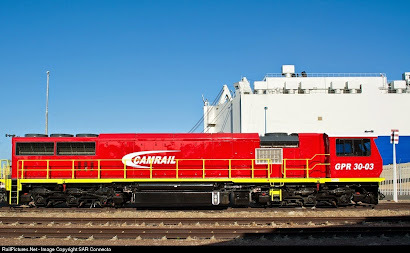 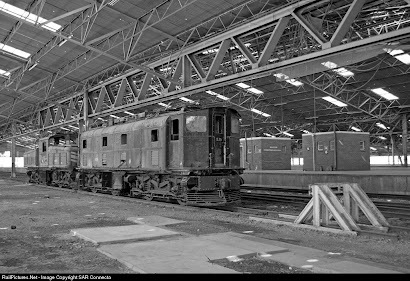 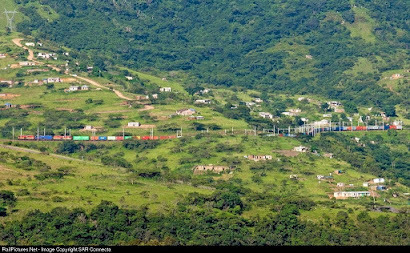 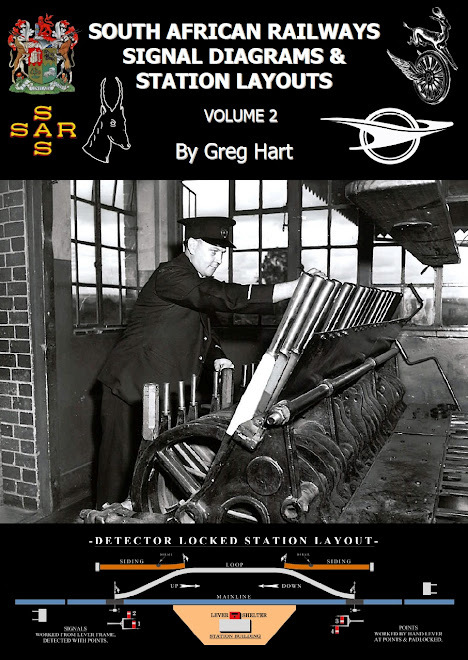 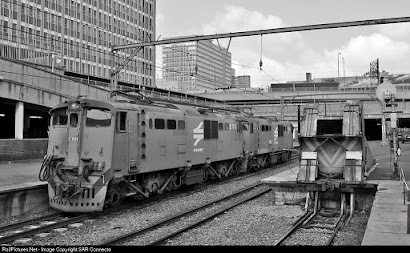 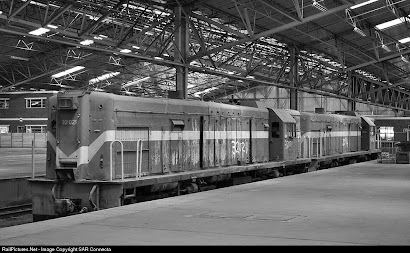 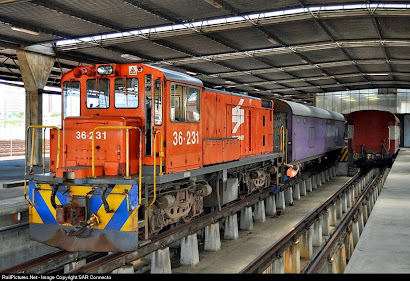 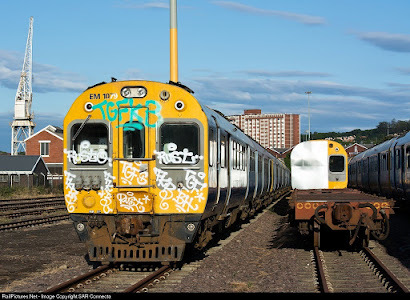 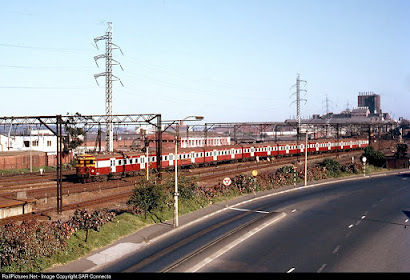 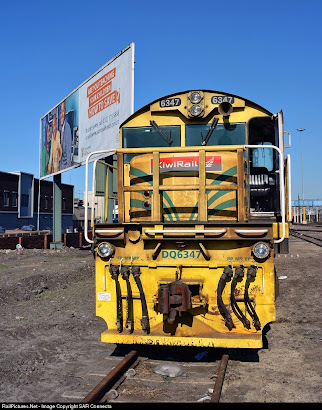 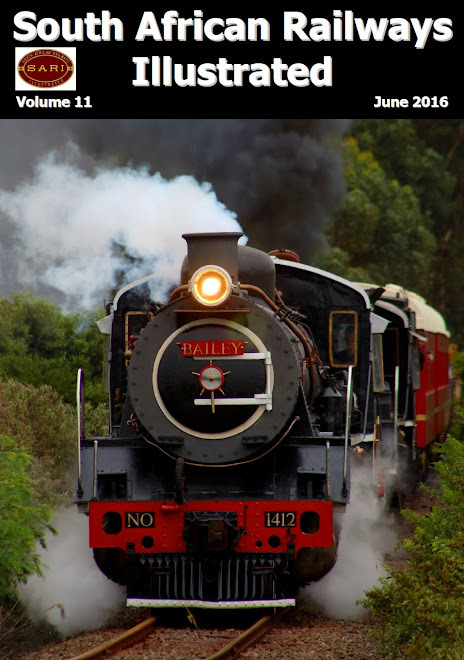 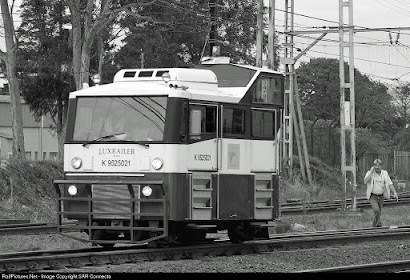 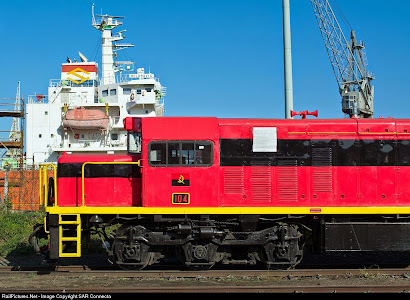 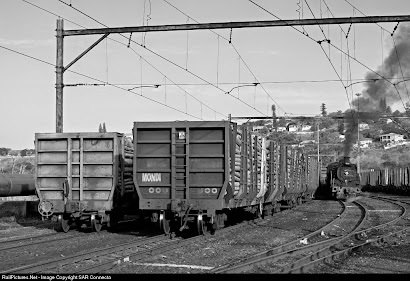 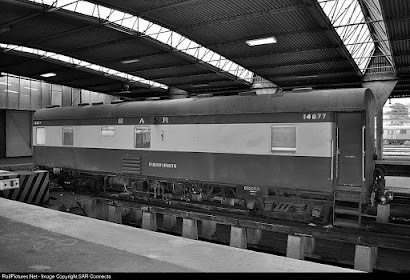 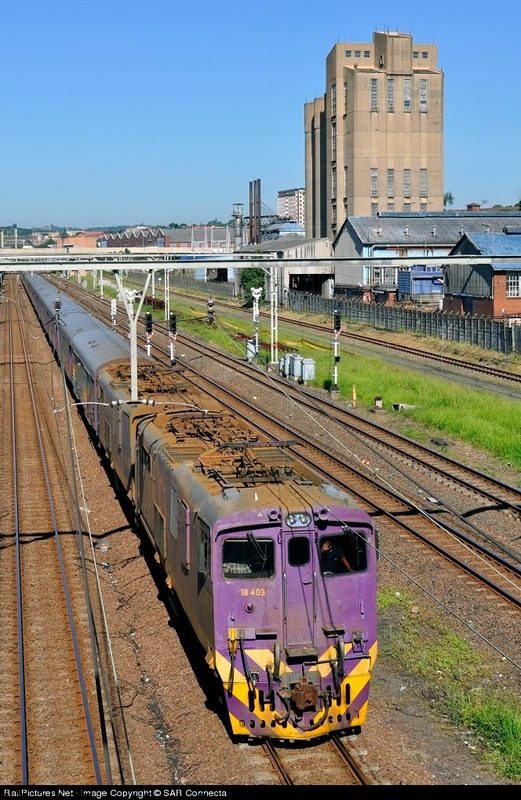 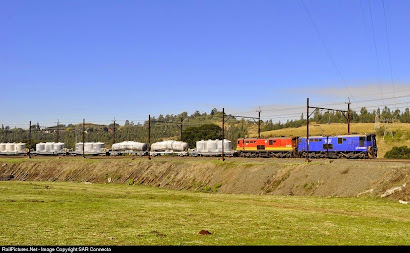 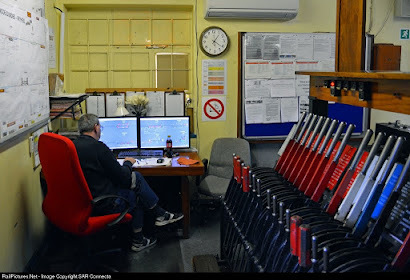 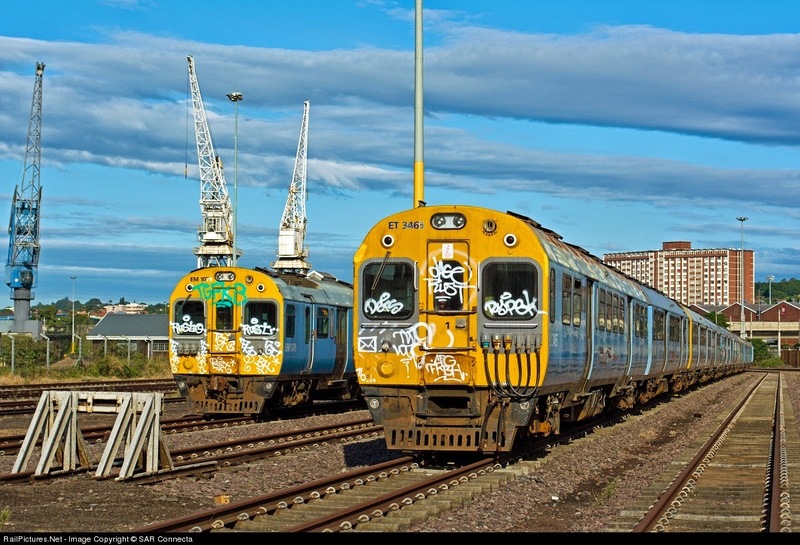 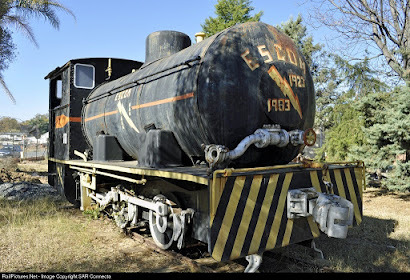 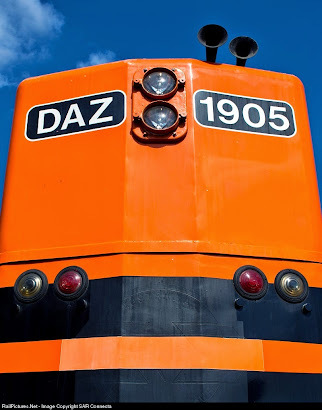 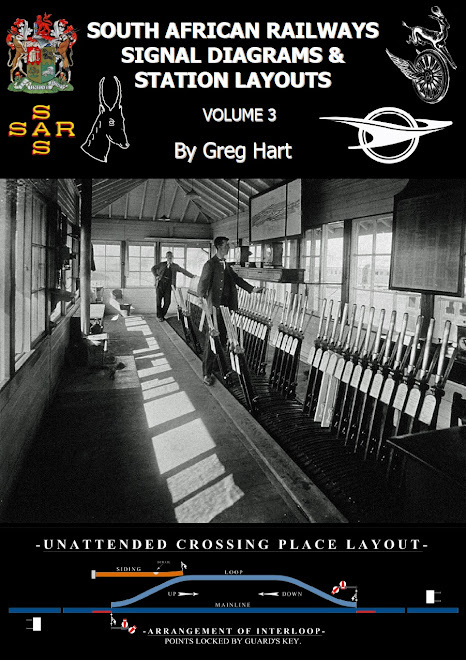 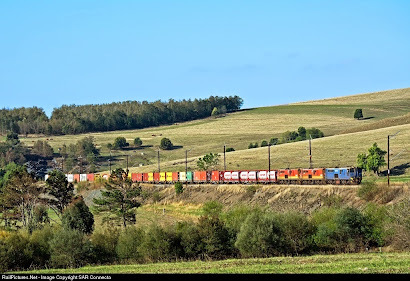 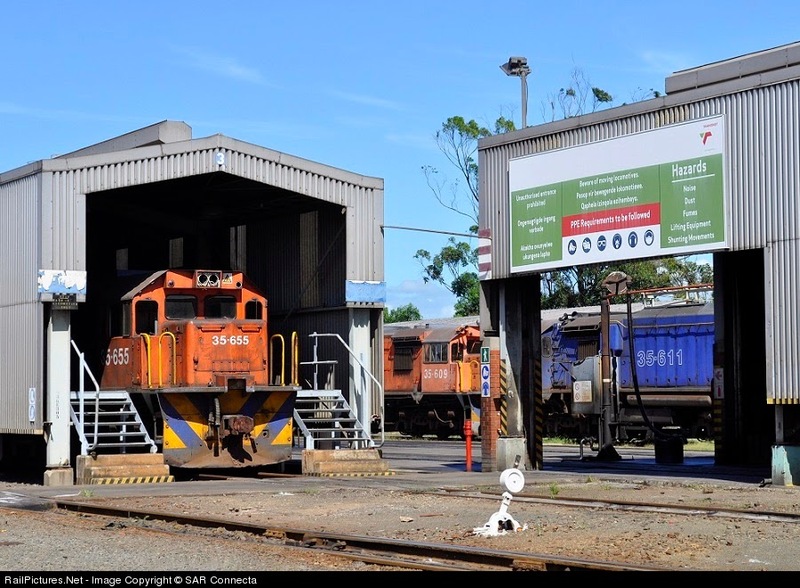 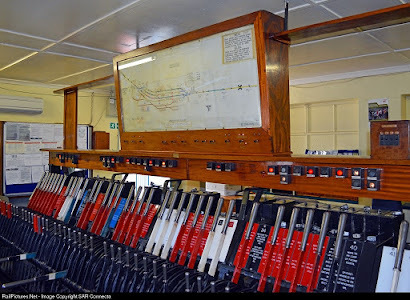 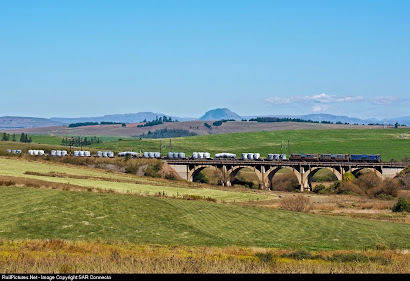 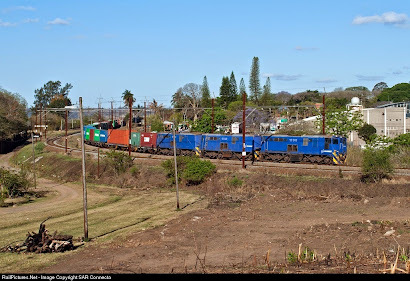 SAR CONNECTA: 18-219 & Mixed Freight (Grain & Tanker Wagons) - Beacon Hill Station (2nd May 2013). 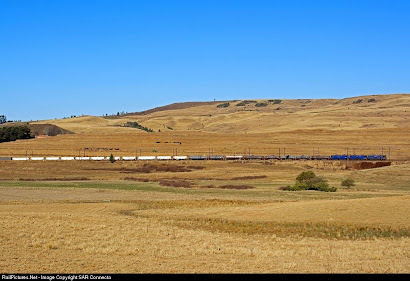 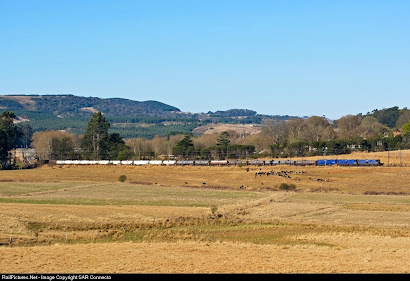 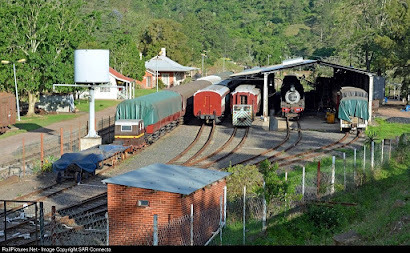 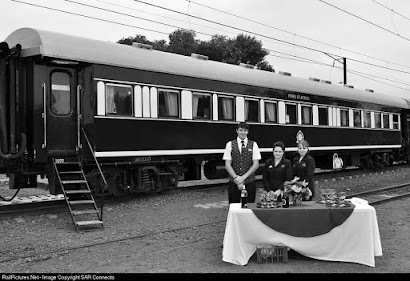 18-219 & Mixed Freight (Grain & Tanker Wagons) - Beacon Hill Station (2nd May 2013). 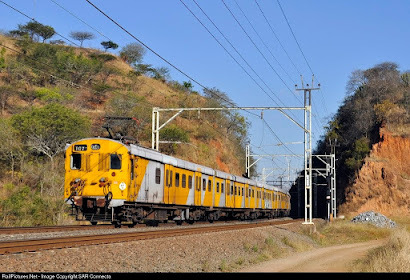 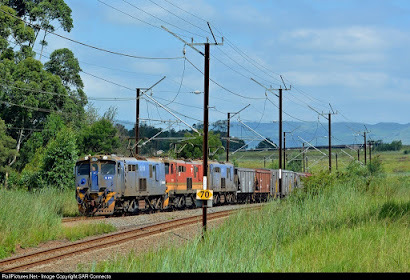 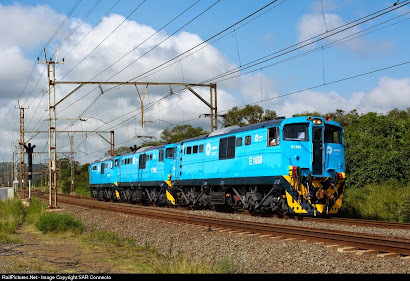 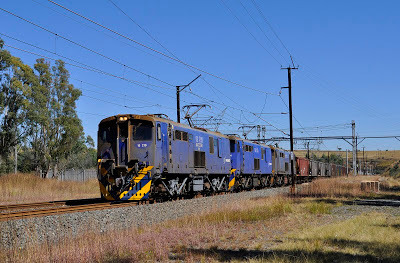 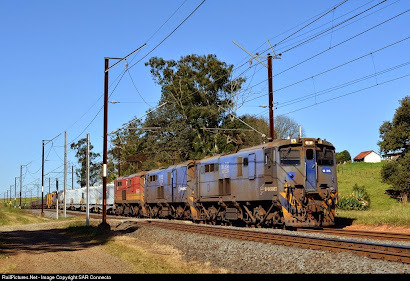 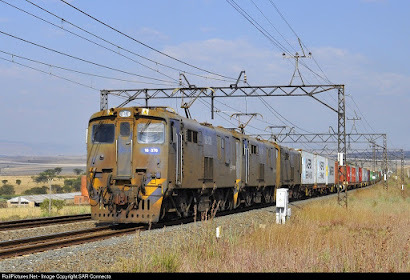 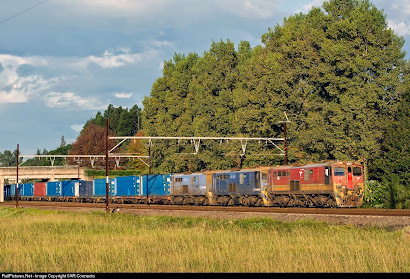 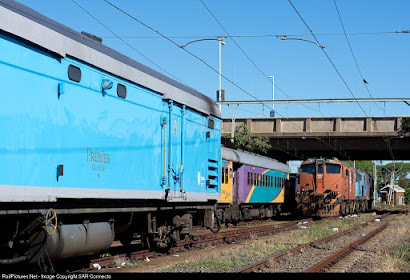 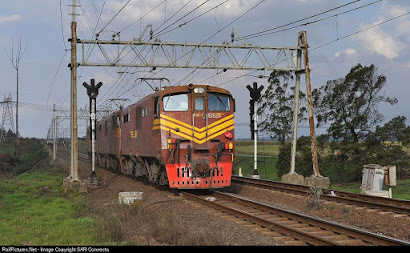 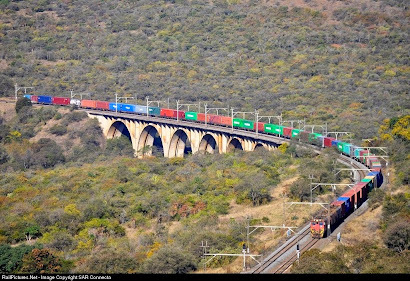 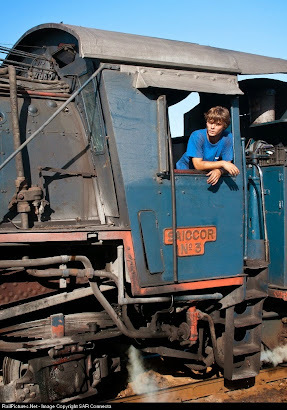 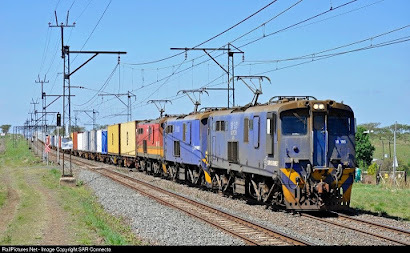 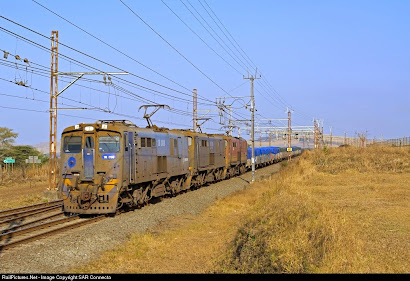 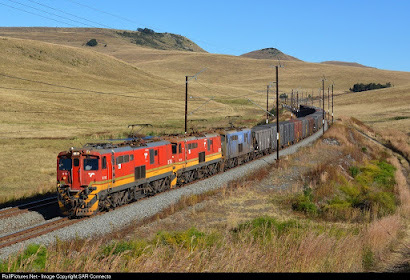 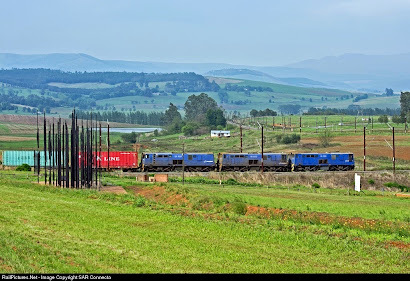 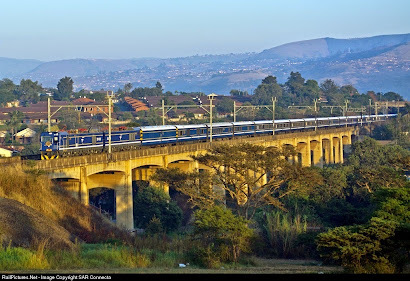 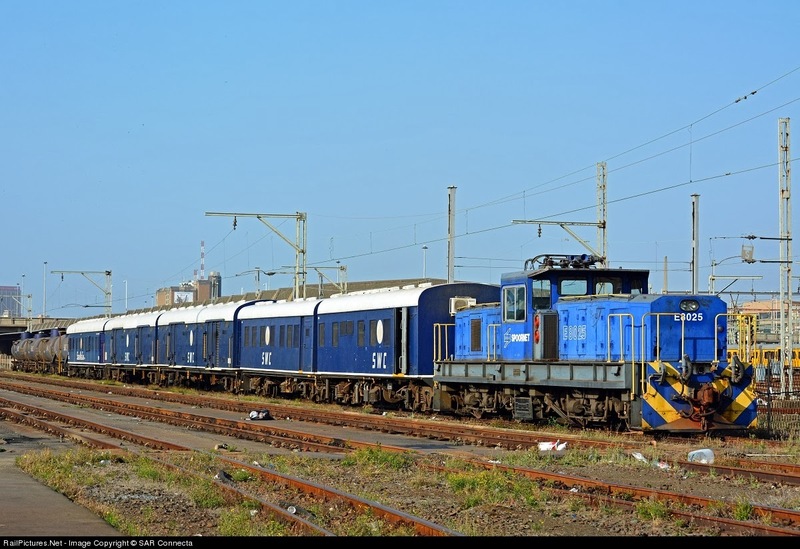 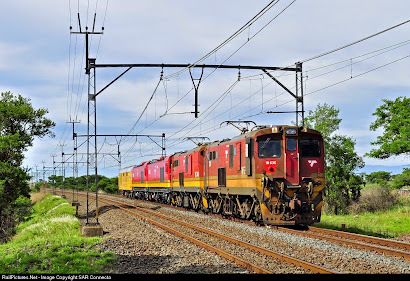 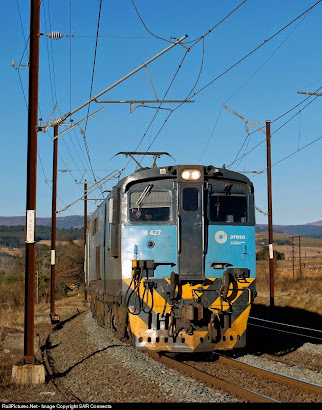 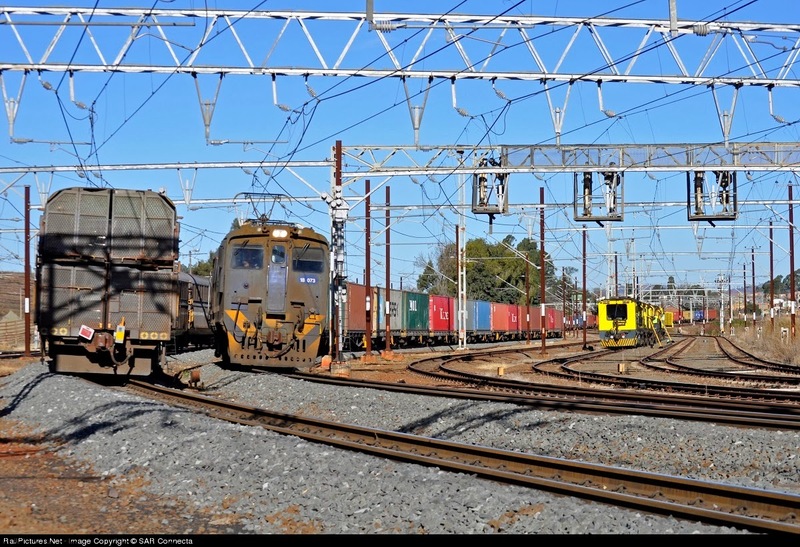 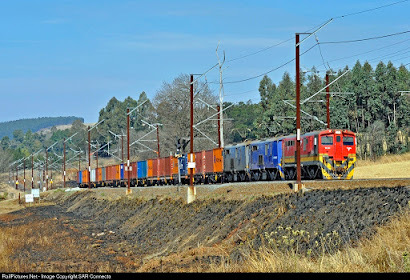 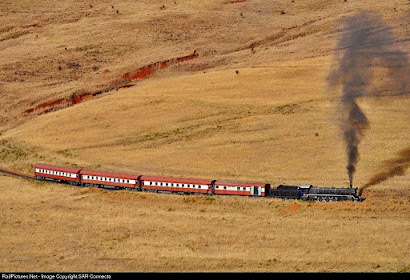 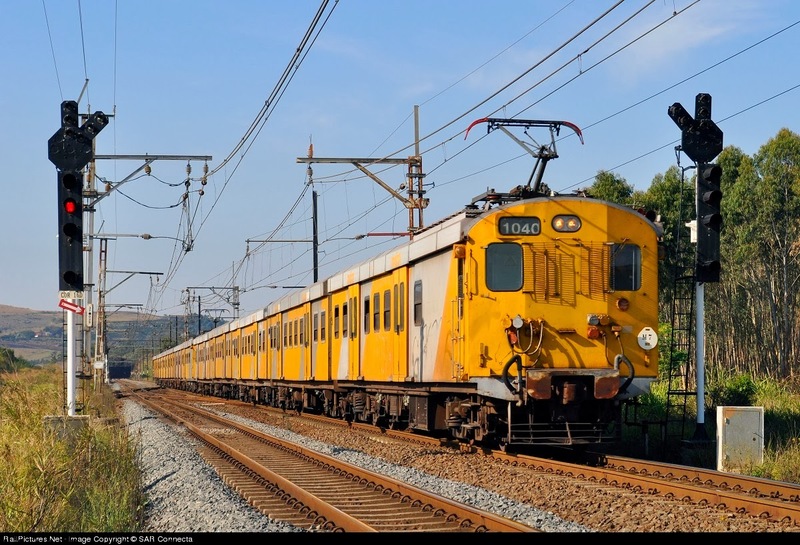 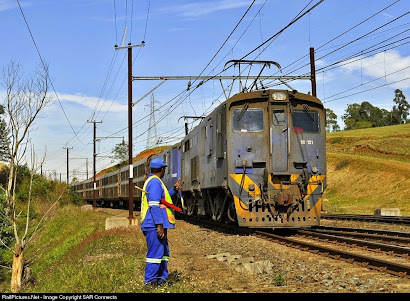 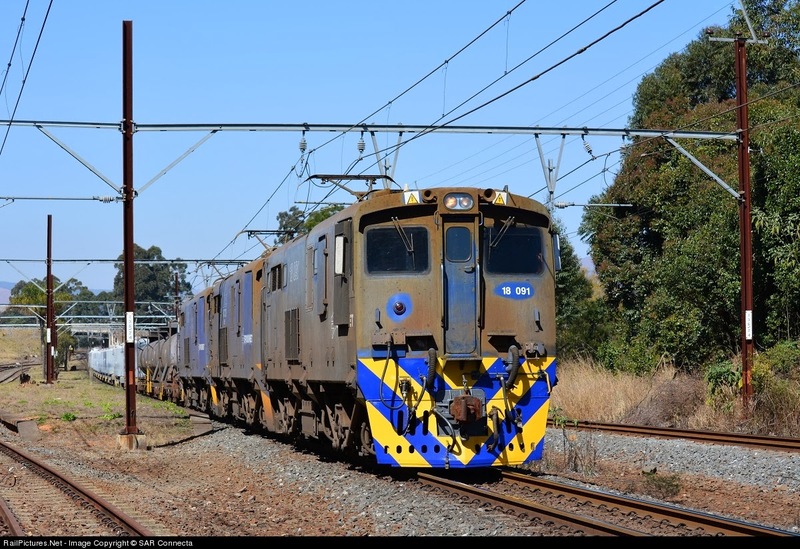 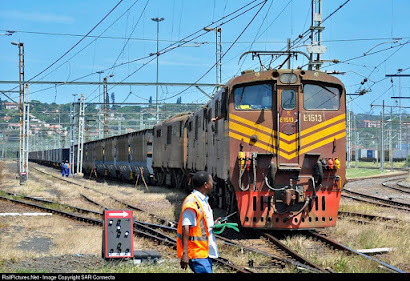 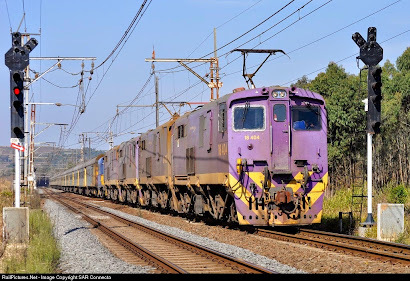 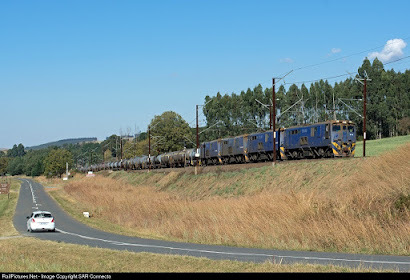 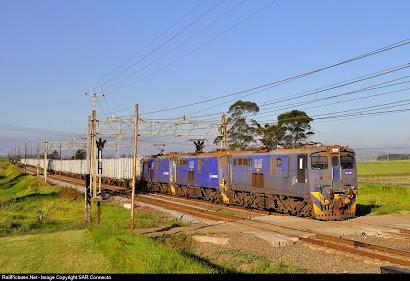 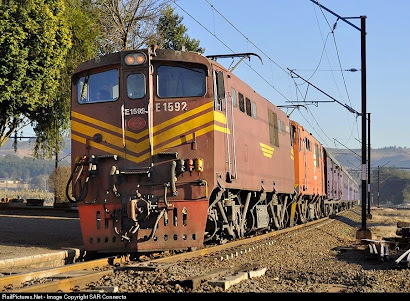 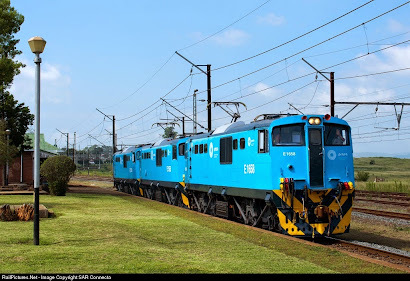 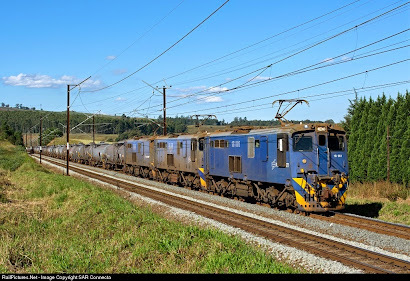 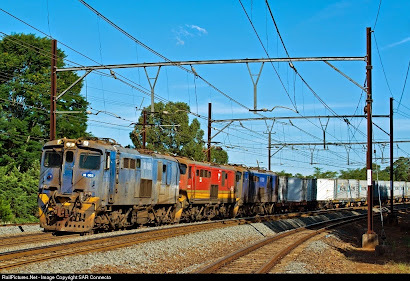 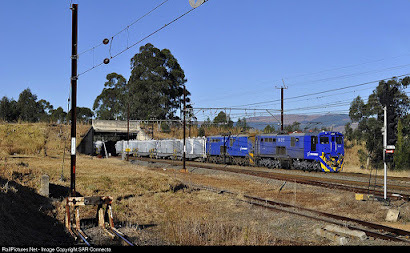 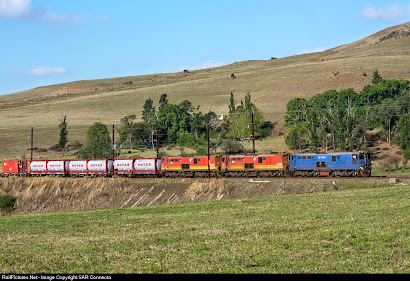 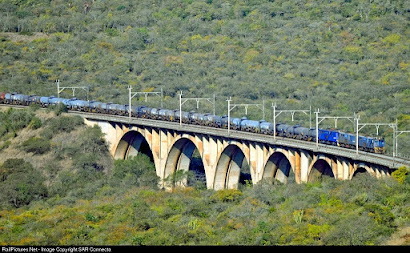 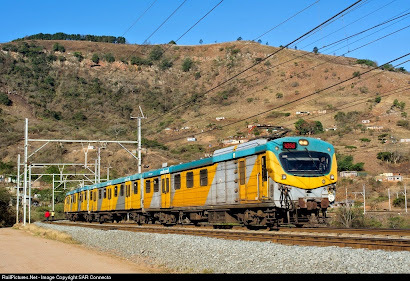 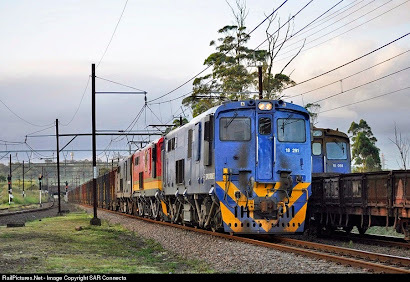 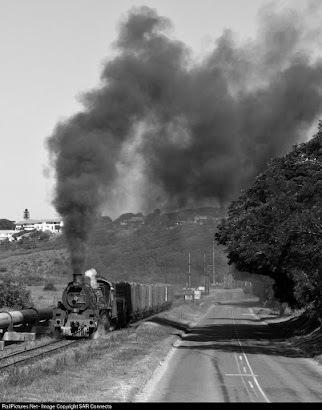 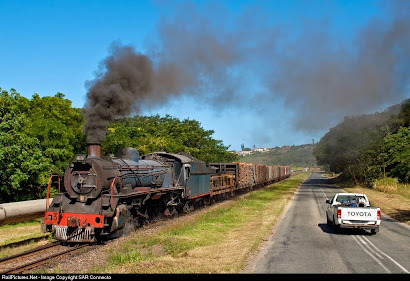 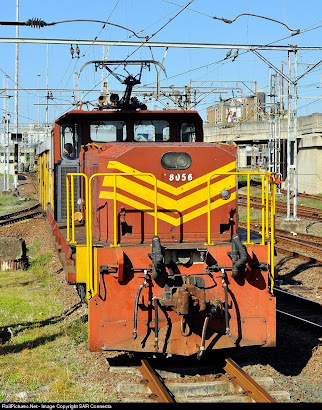 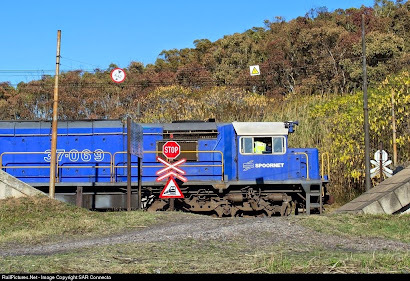 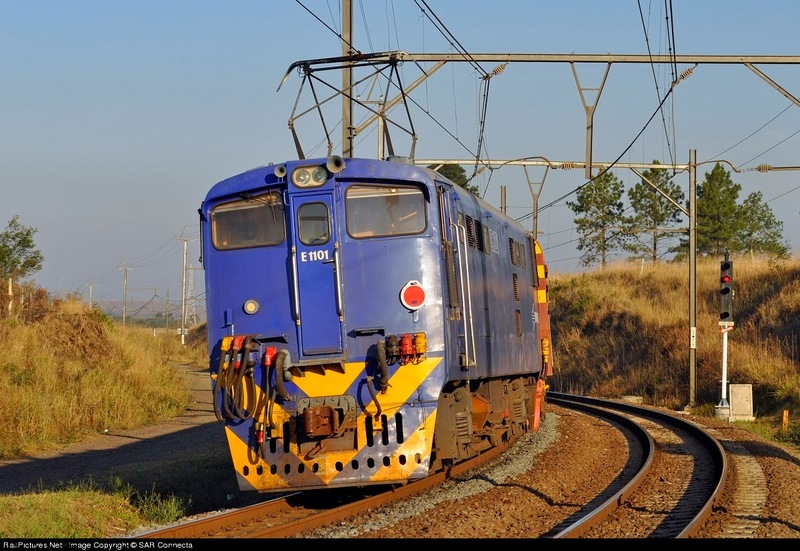 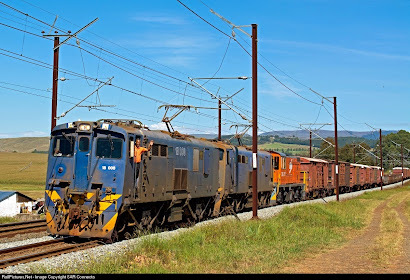 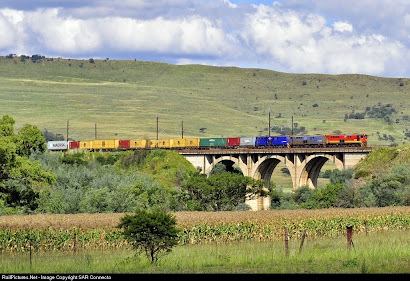 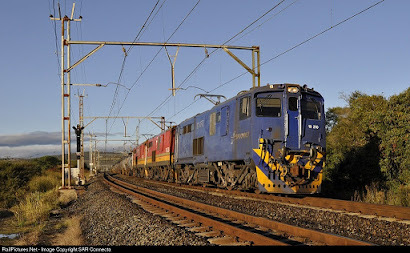 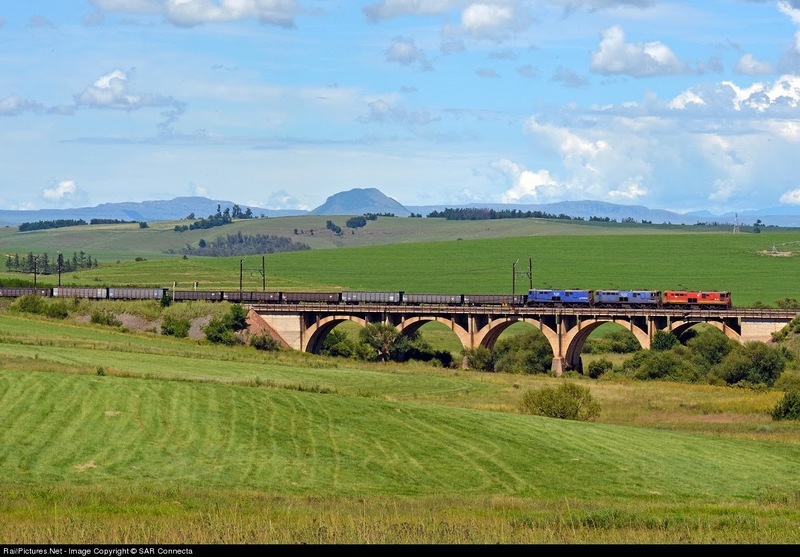 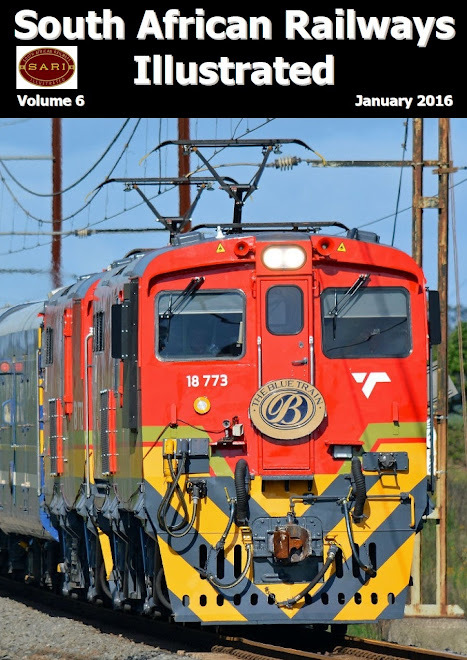 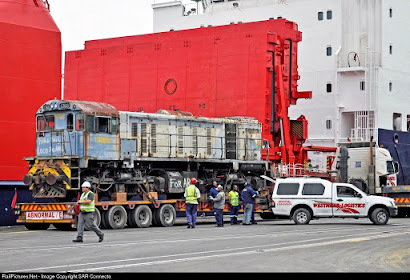 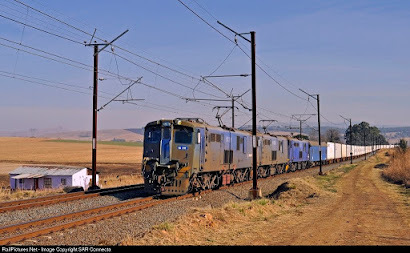 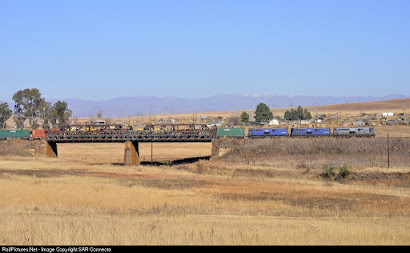 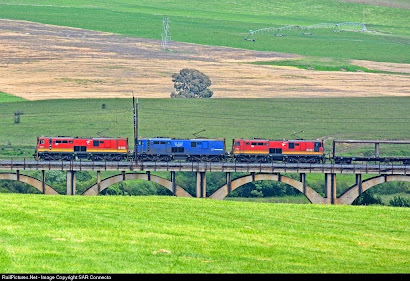 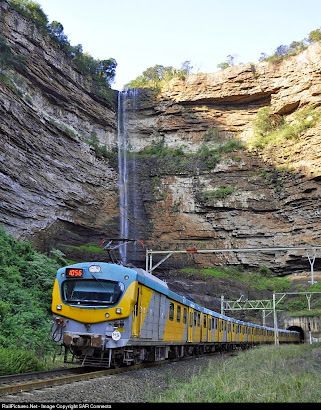 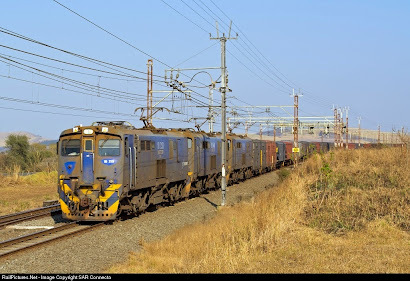 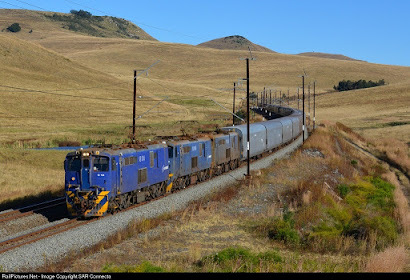 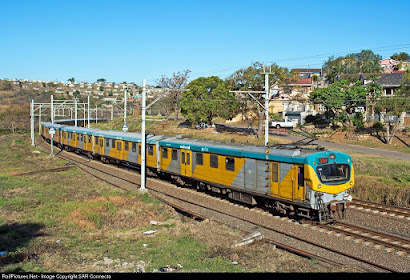 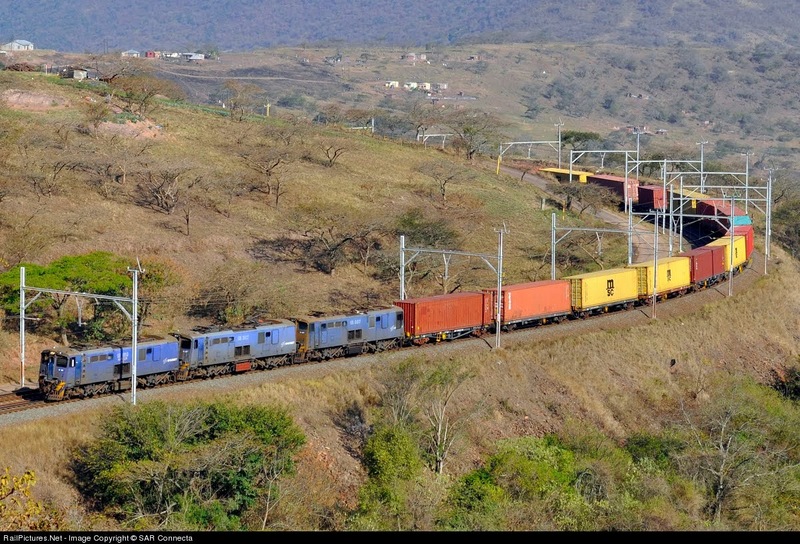 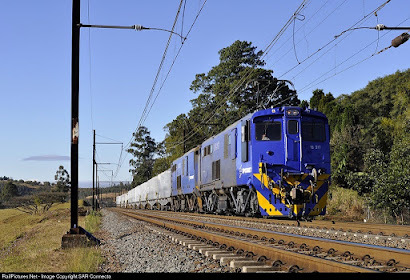 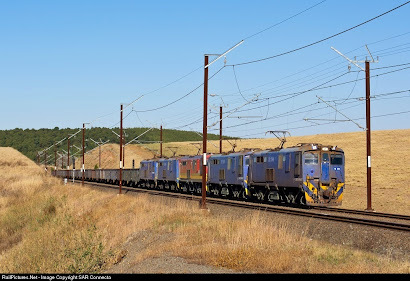 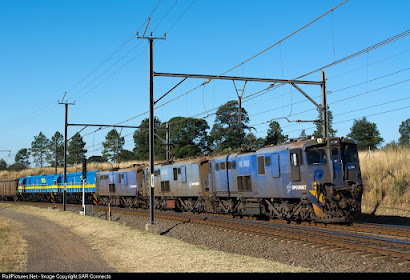 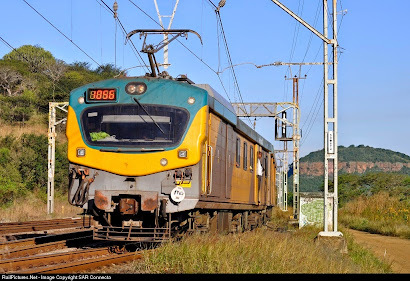 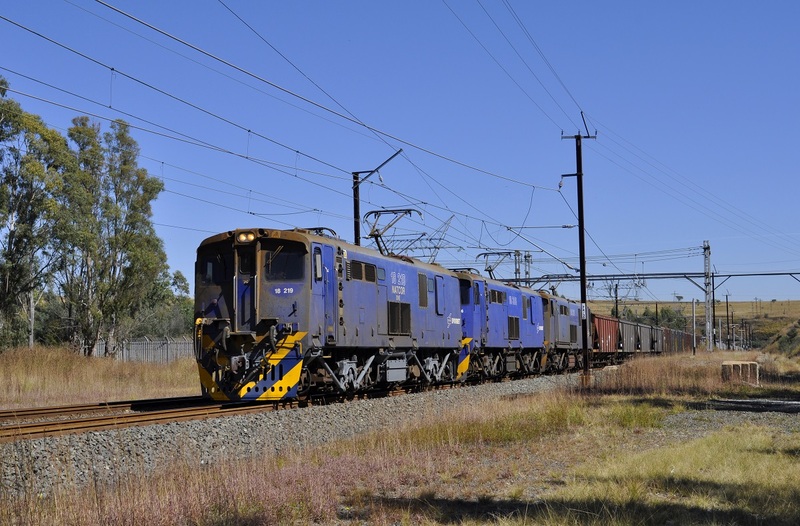 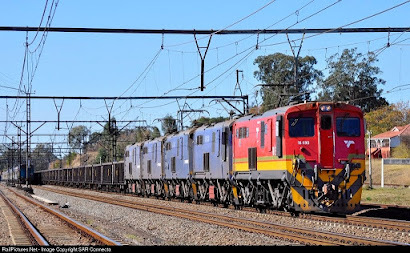 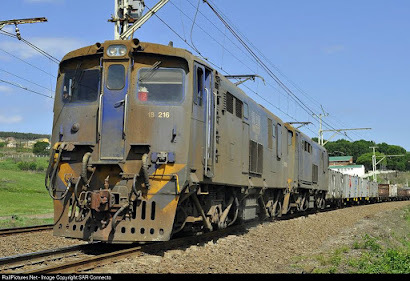 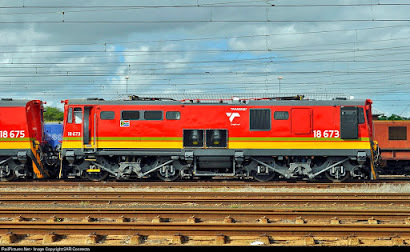 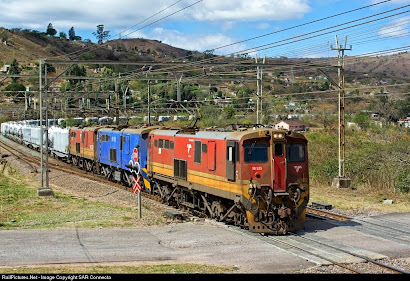 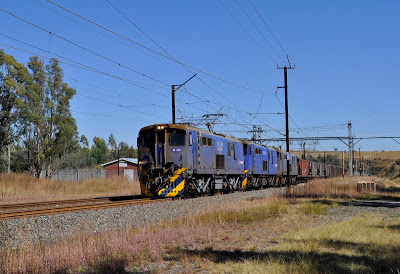 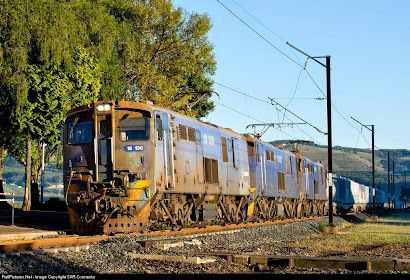 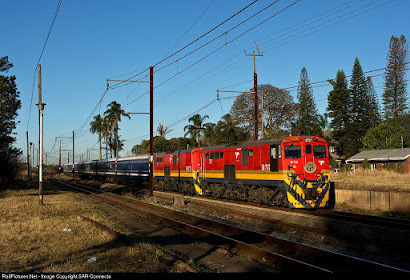 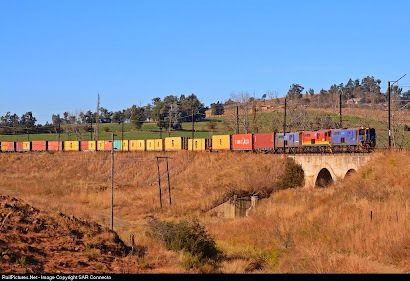 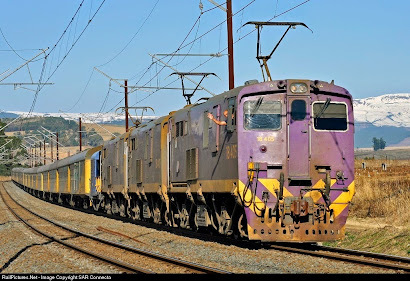 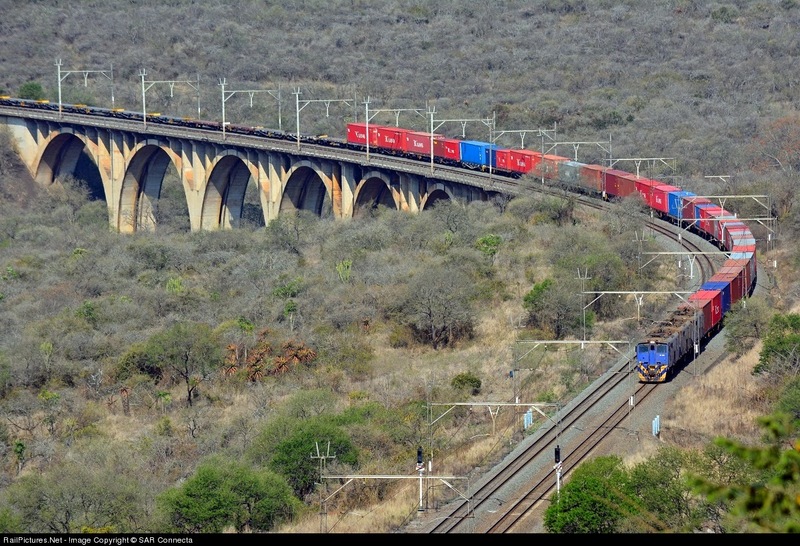 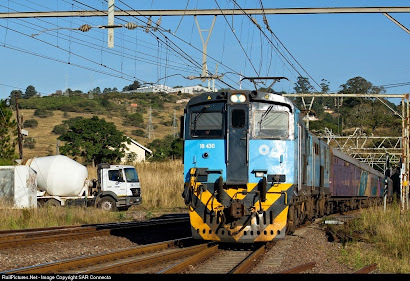 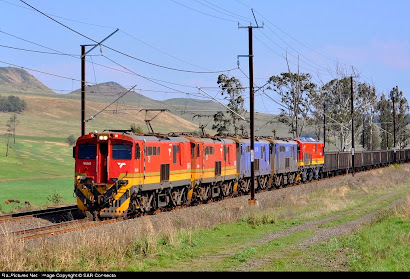 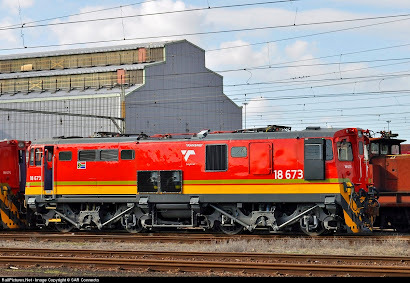 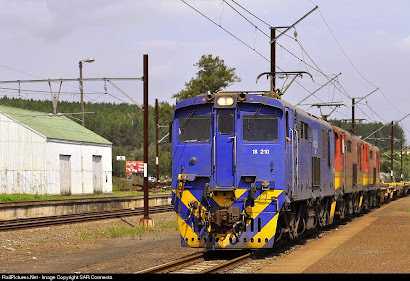 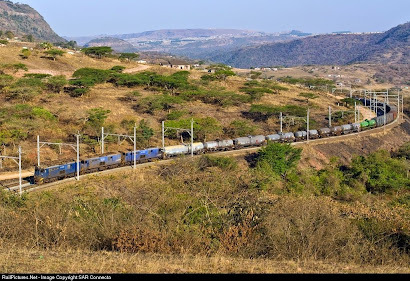 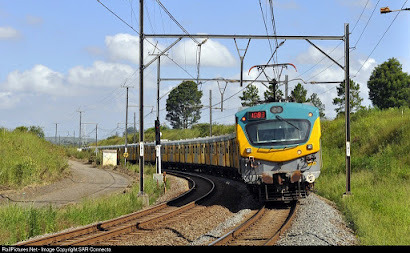 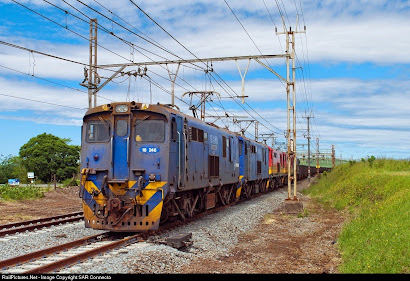 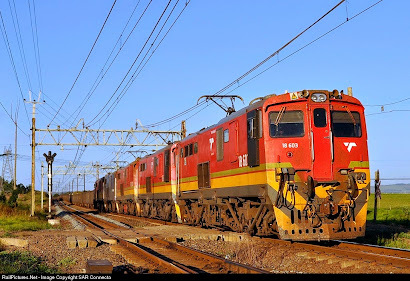 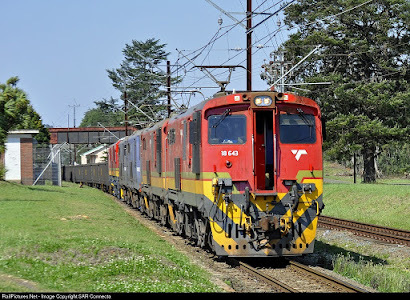 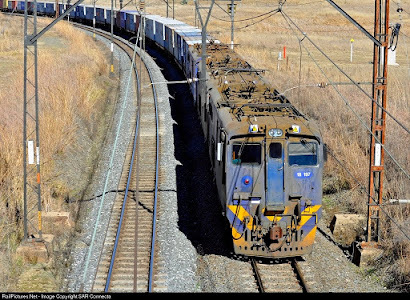 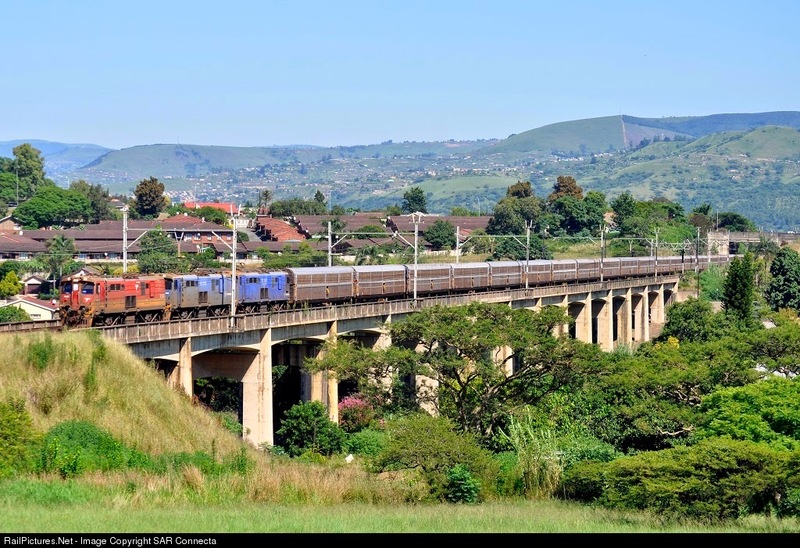 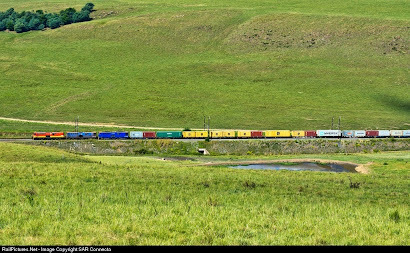 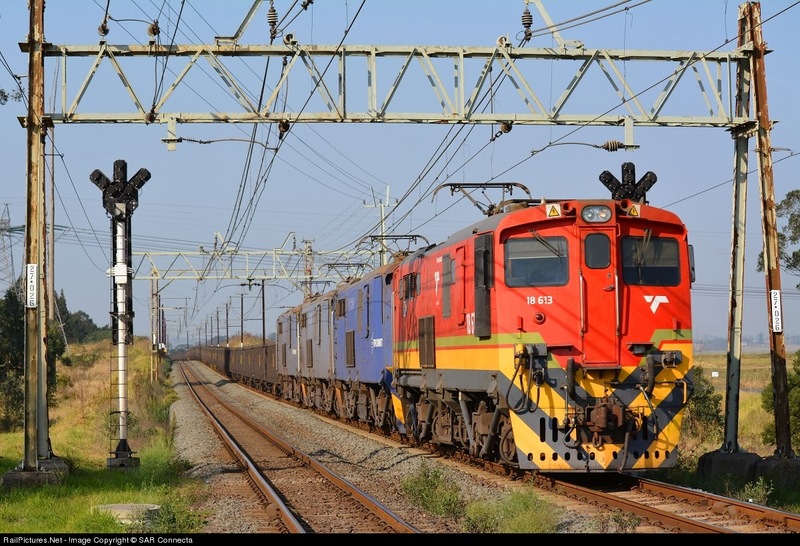 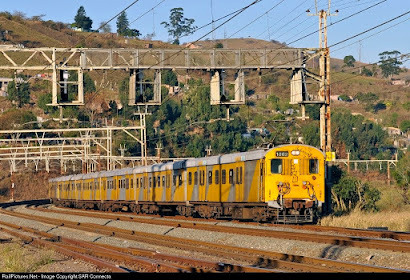 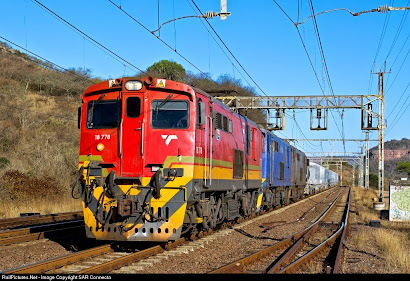 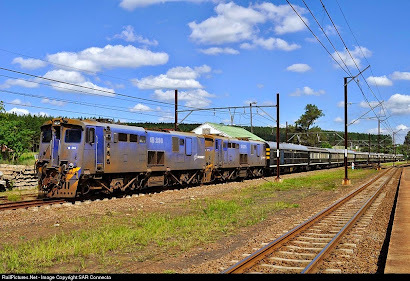 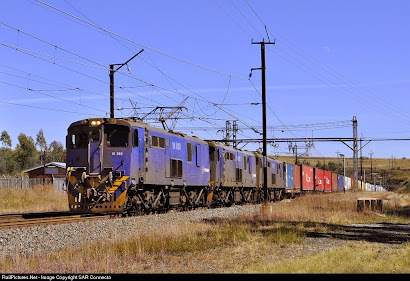 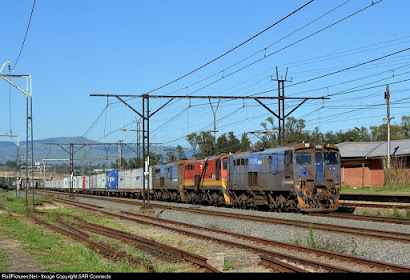 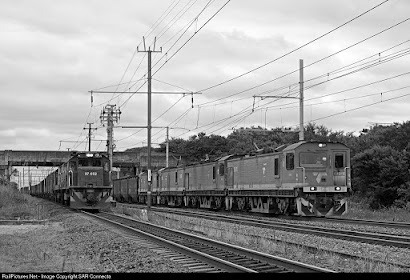 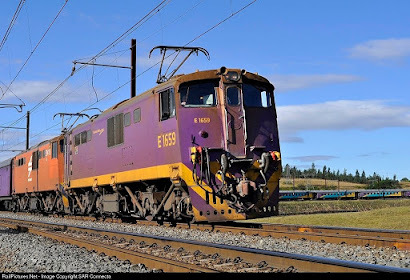 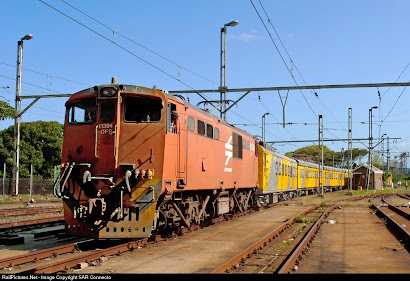 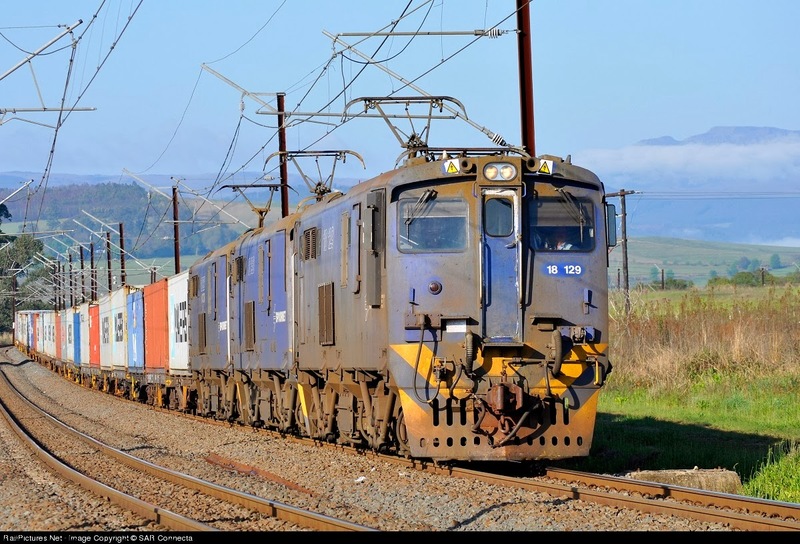 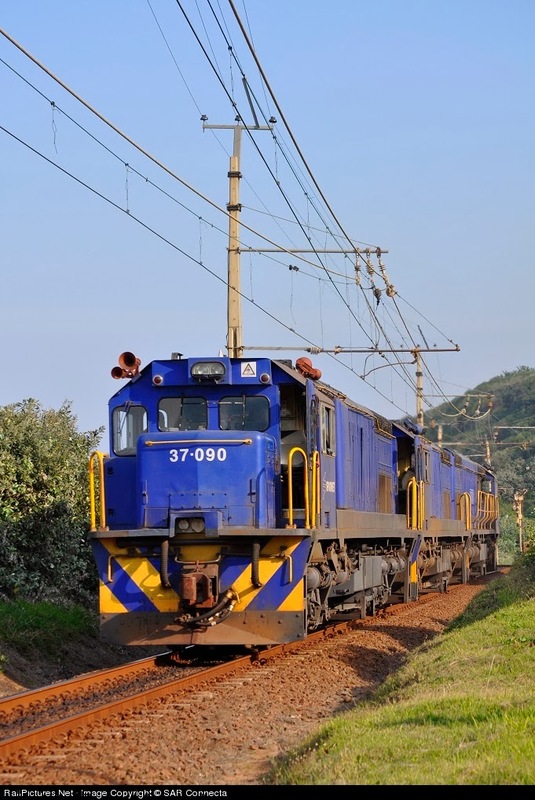 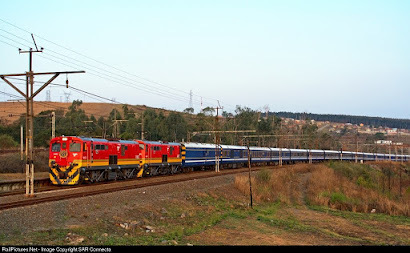 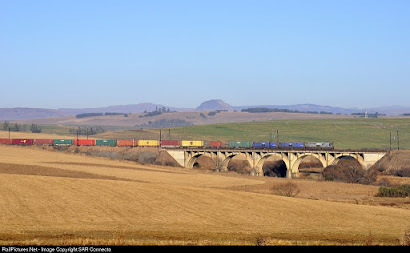 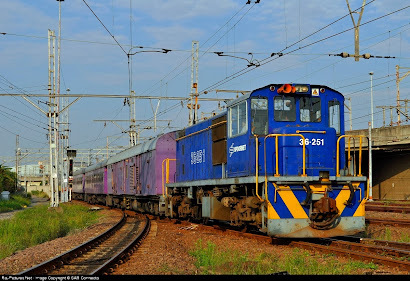 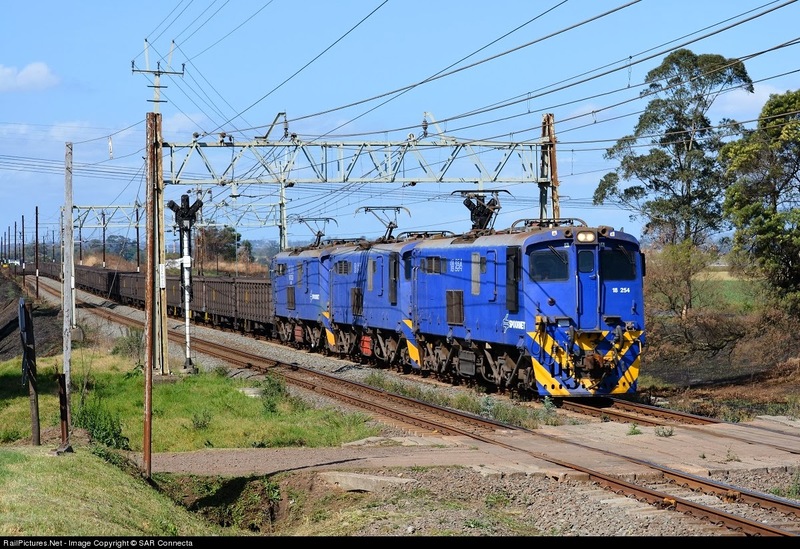 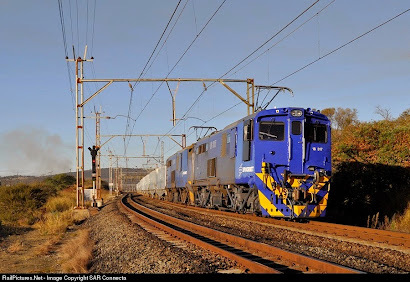 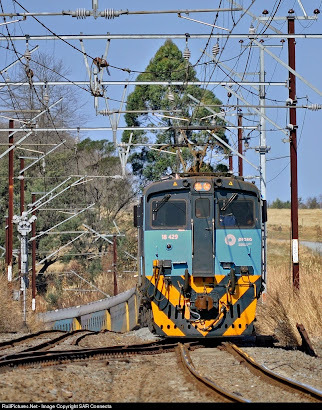 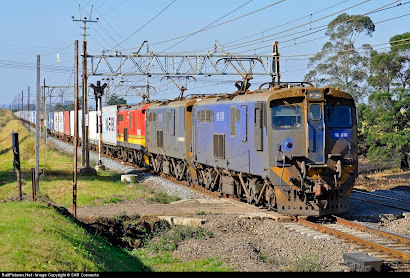 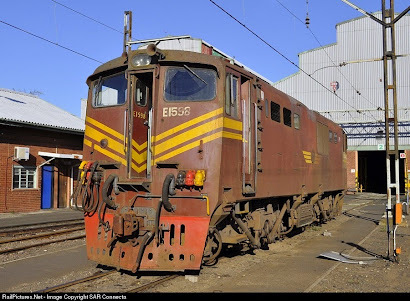 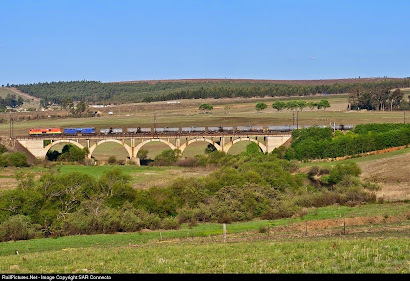 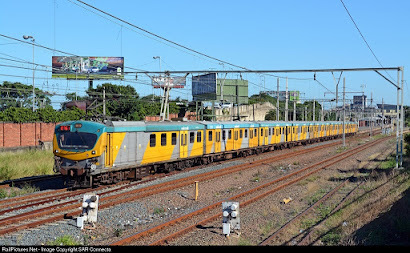 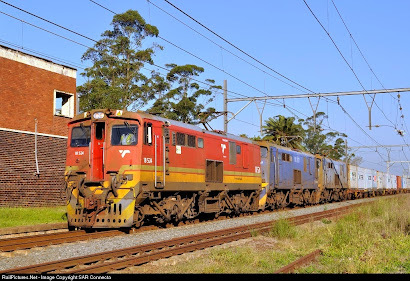 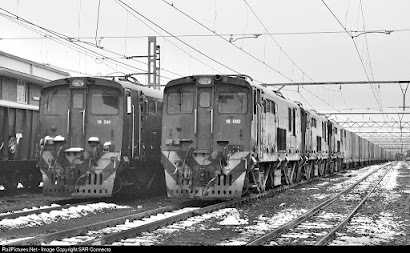 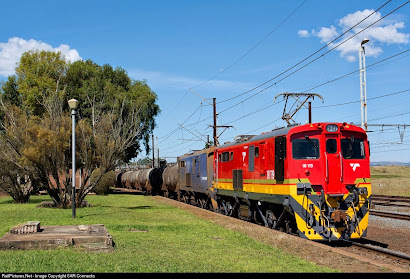 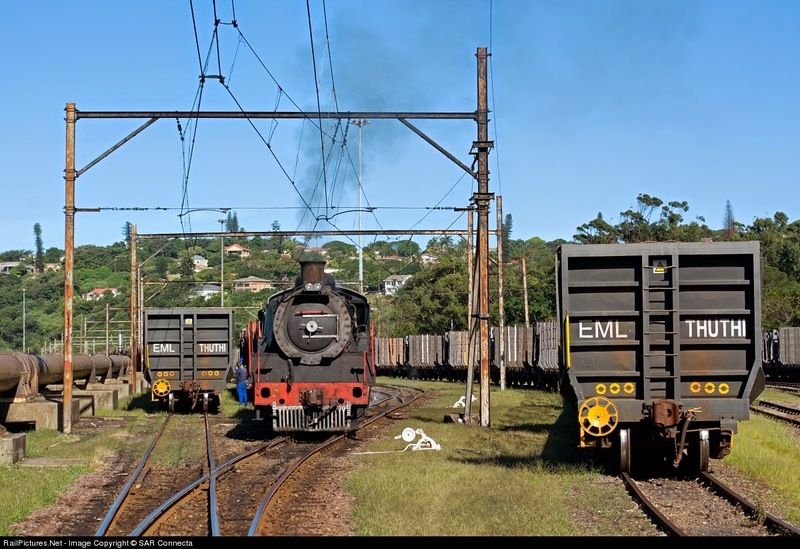 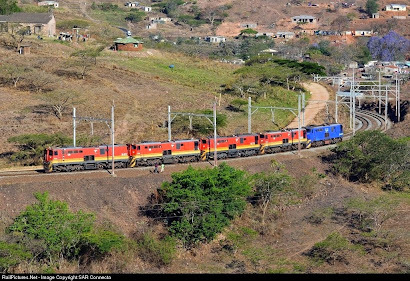 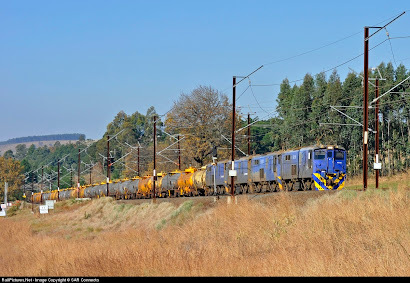 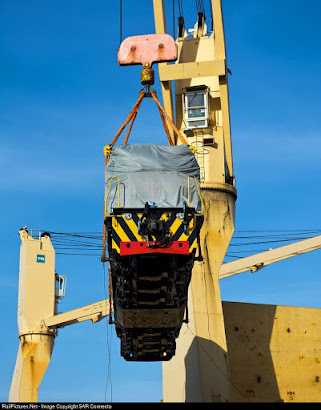 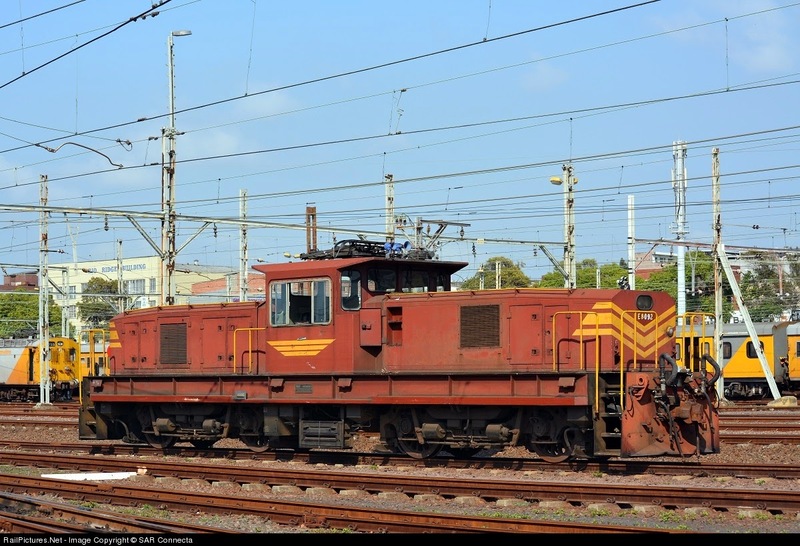 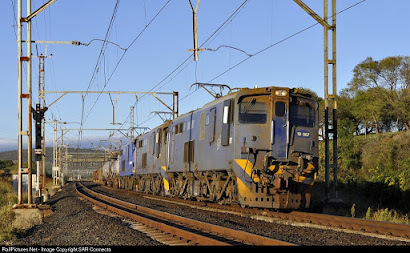 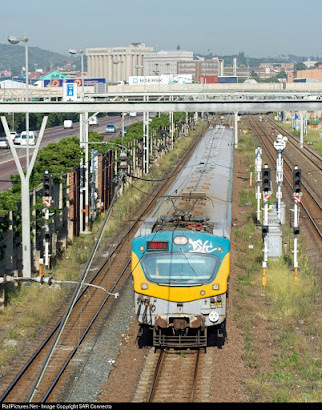 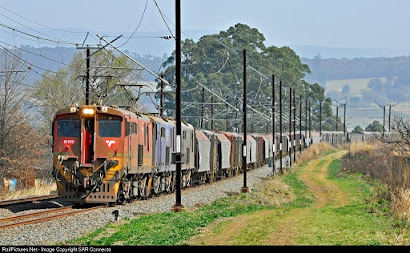 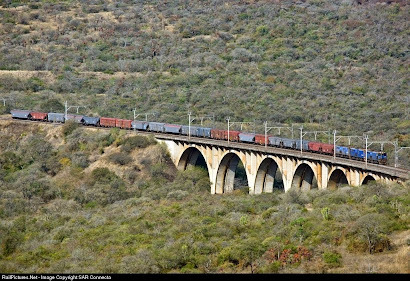 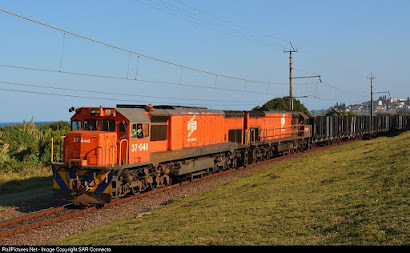 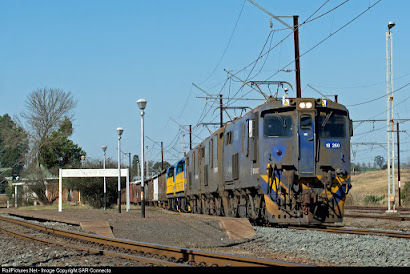 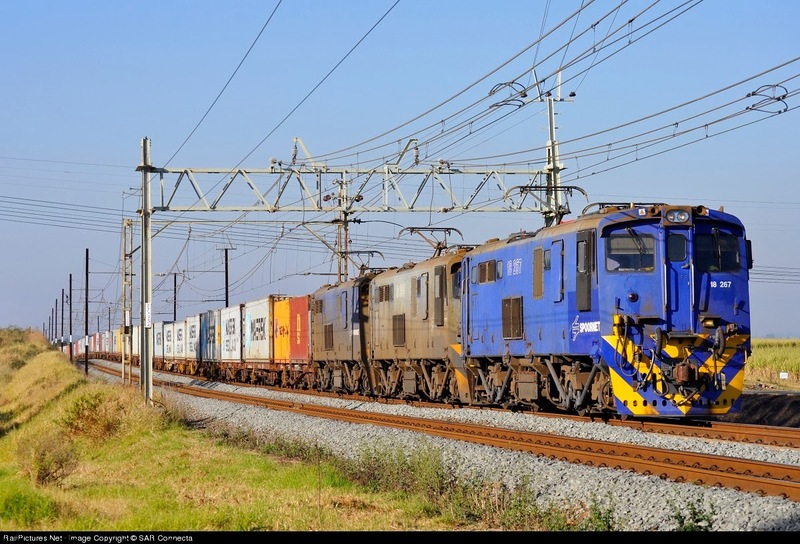 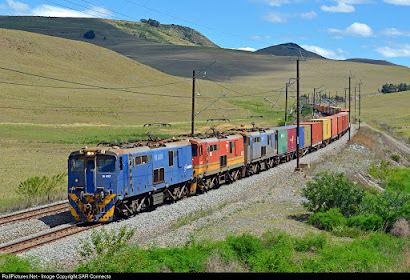 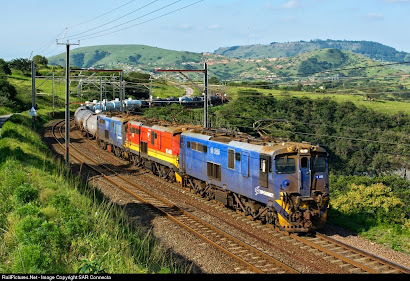 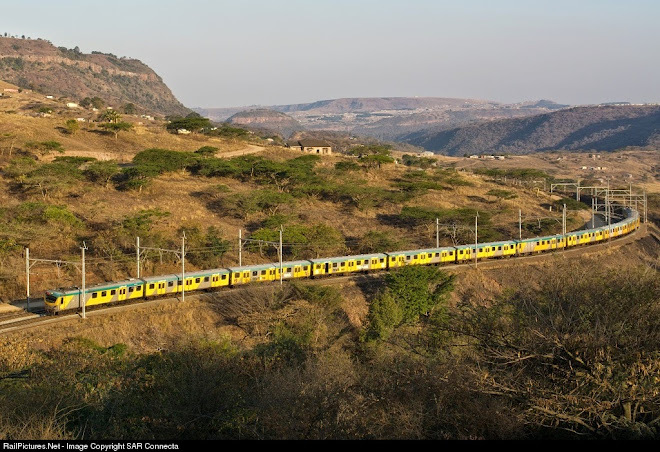 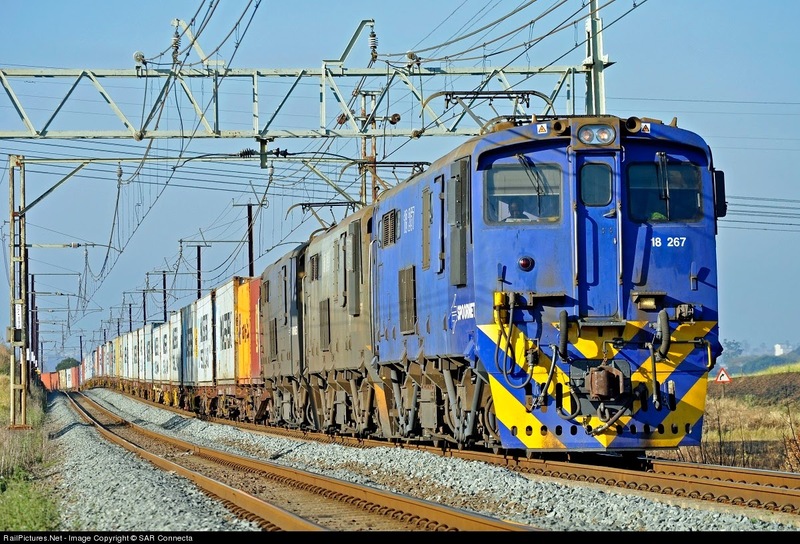 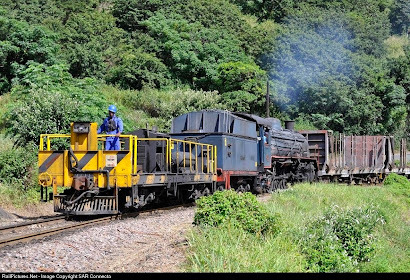 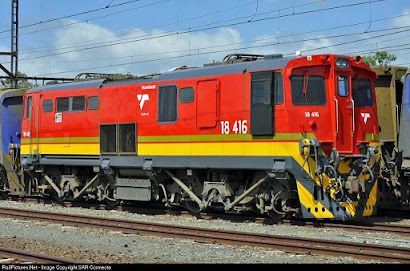 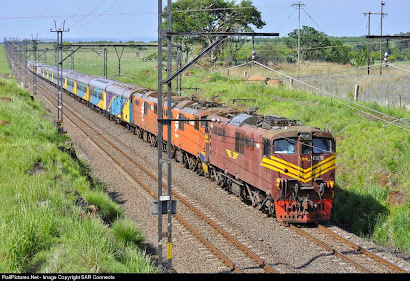 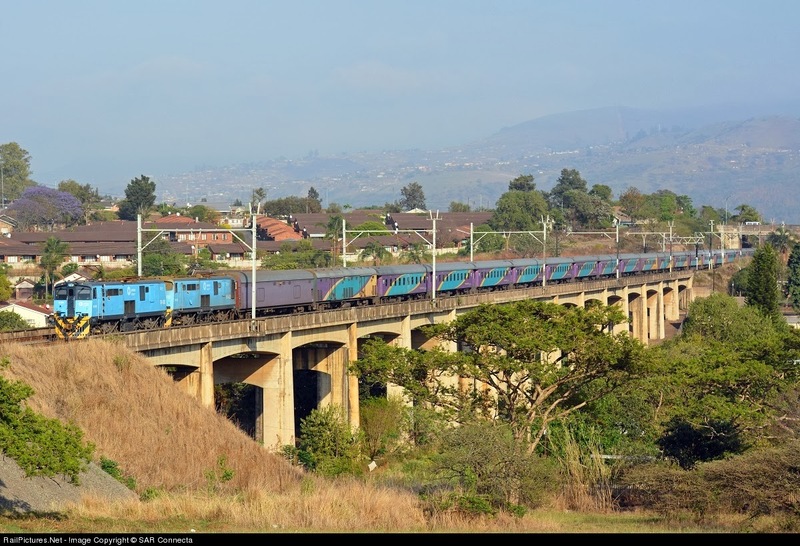 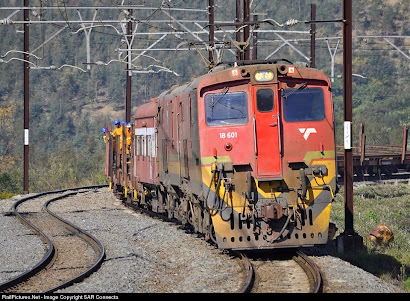 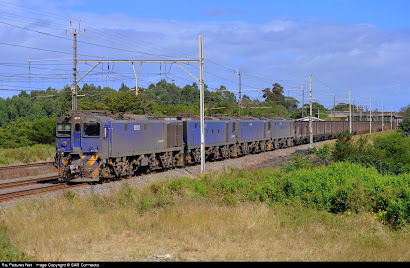 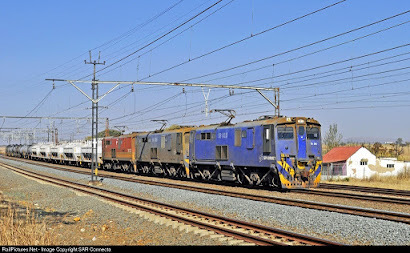 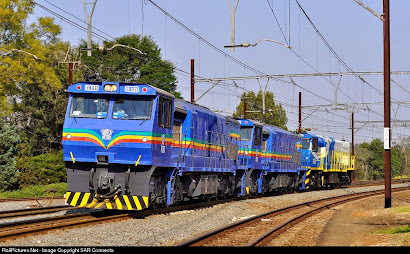 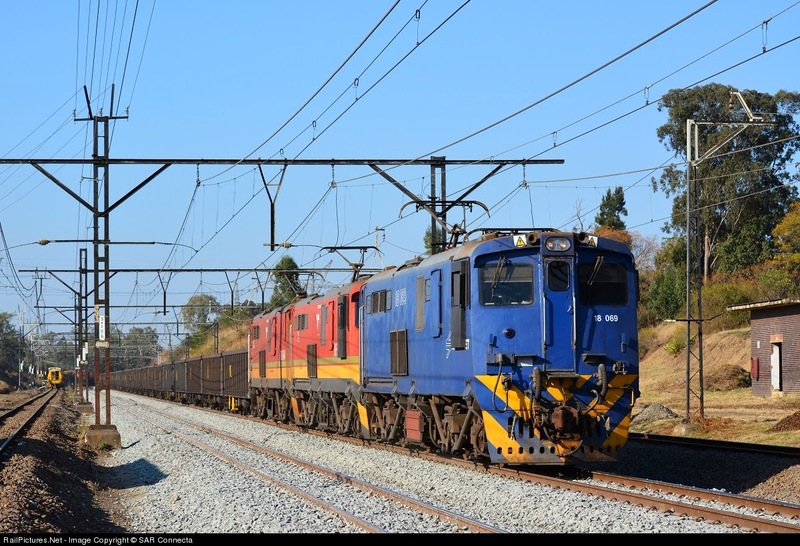 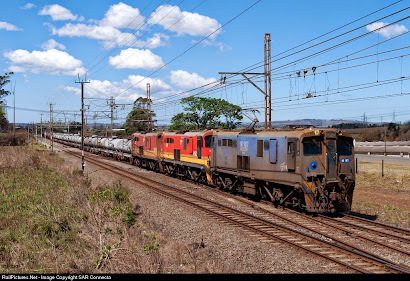 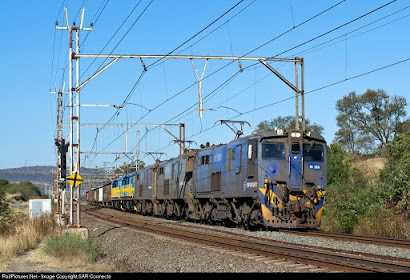 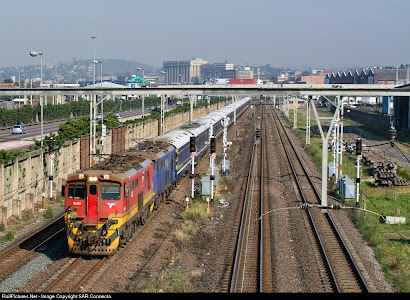 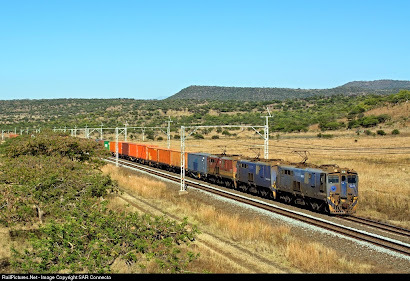 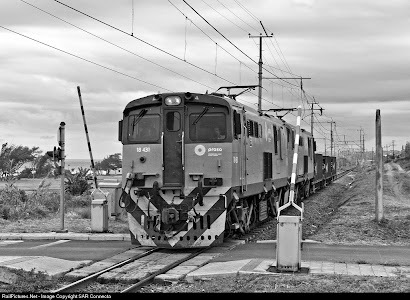 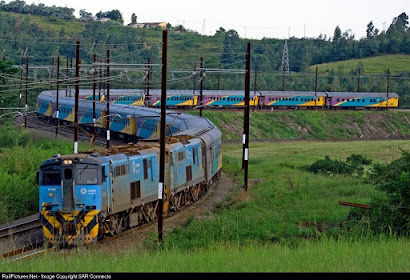 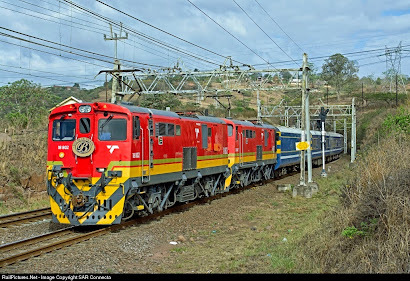 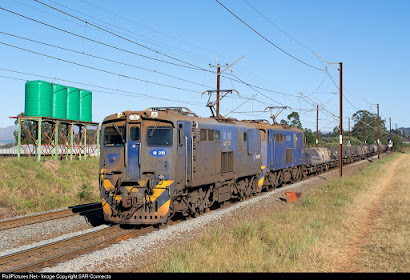 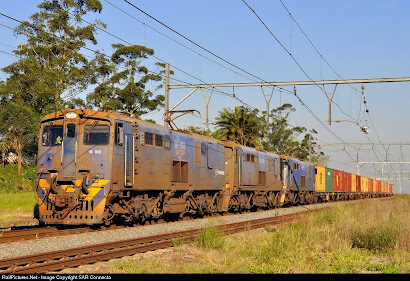 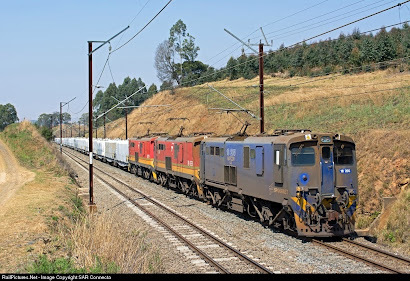 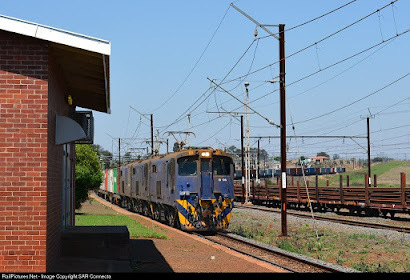 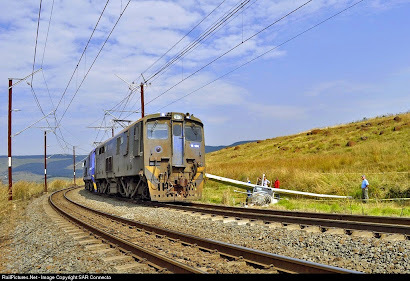 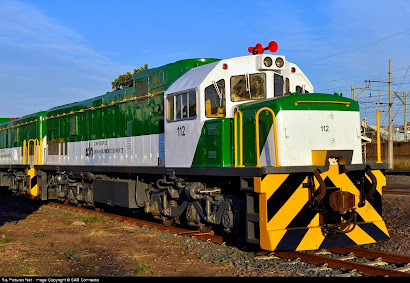 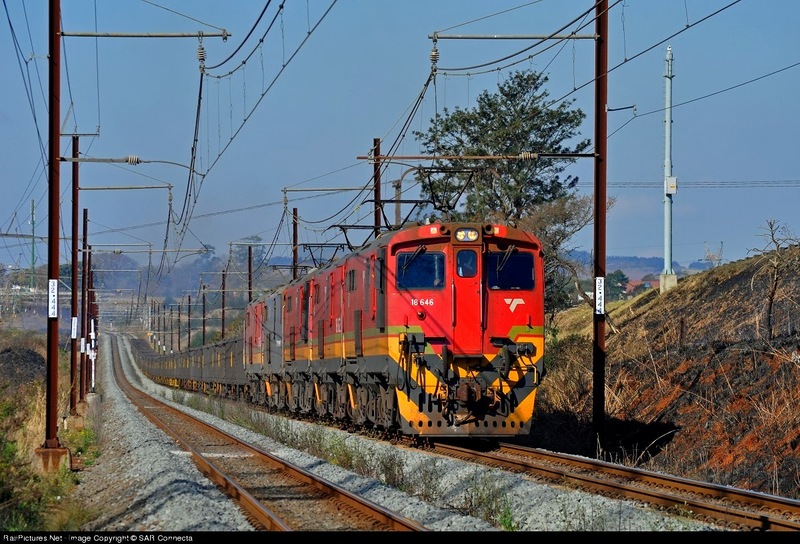 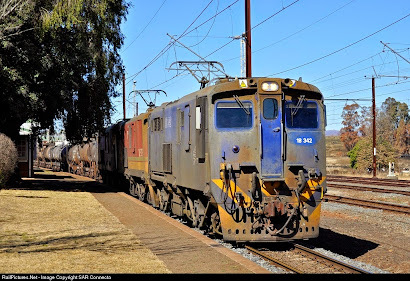 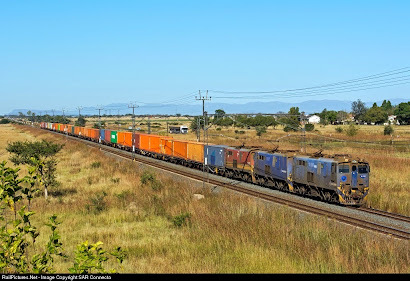 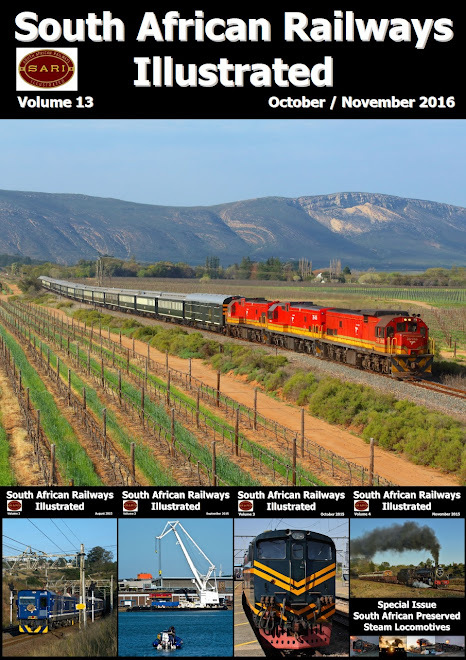 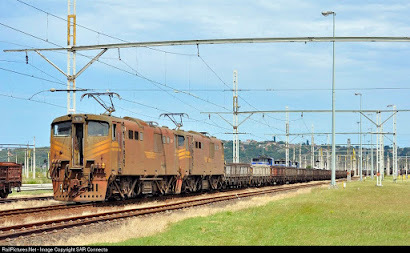 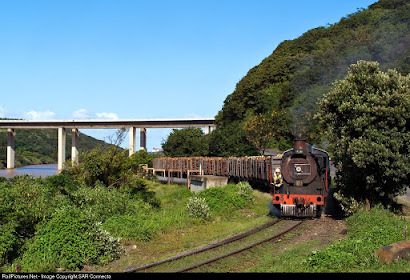 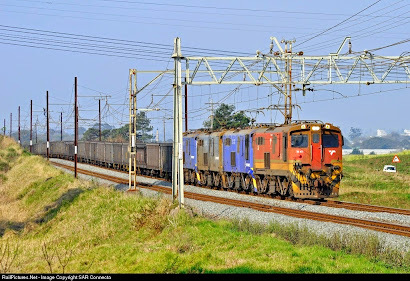 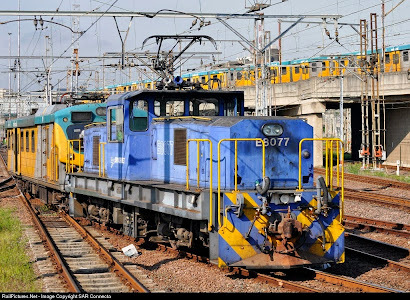 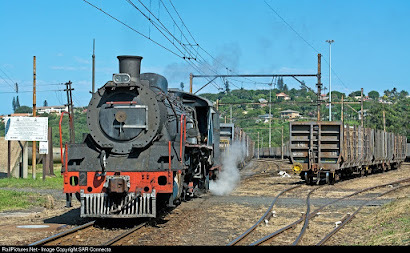 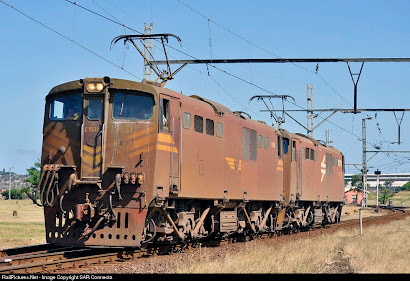 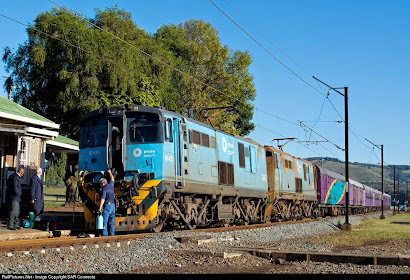 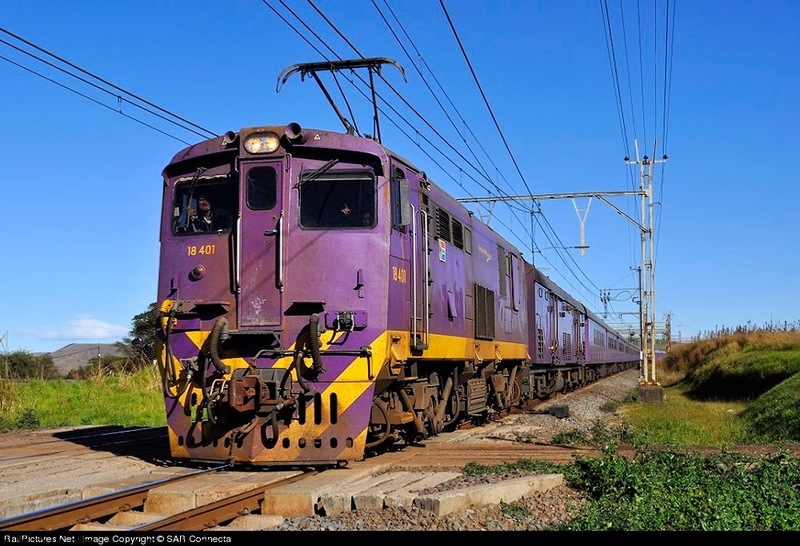 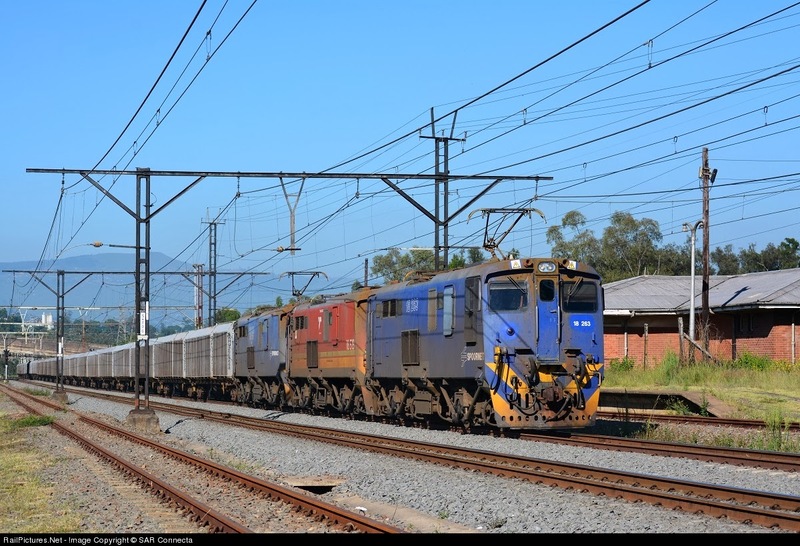 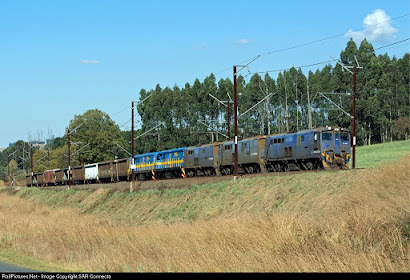 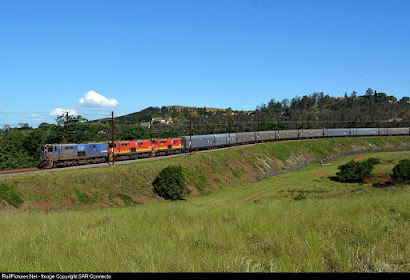 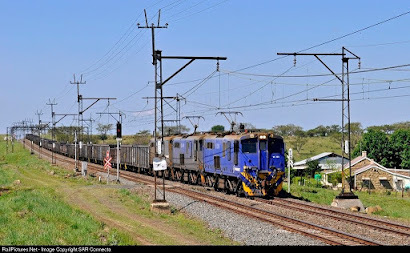 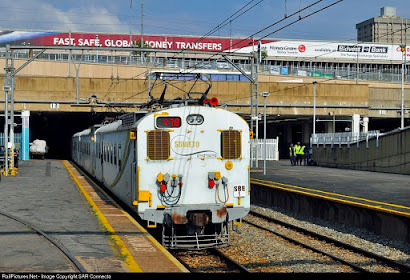 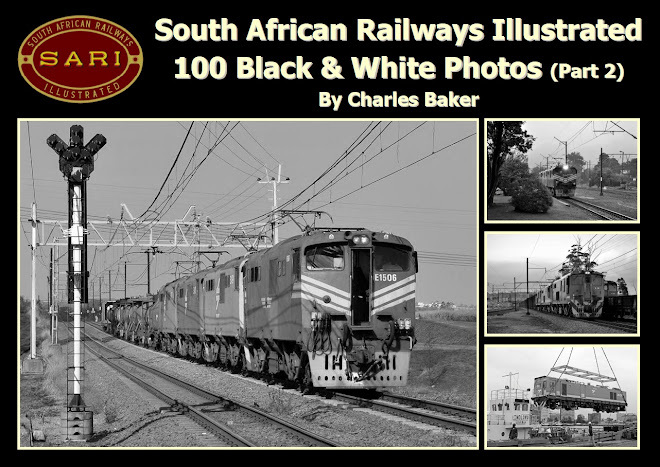 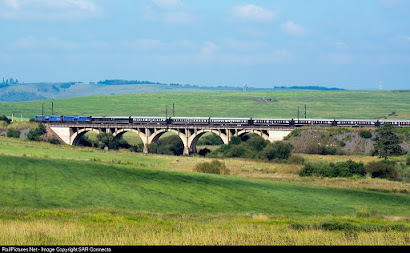 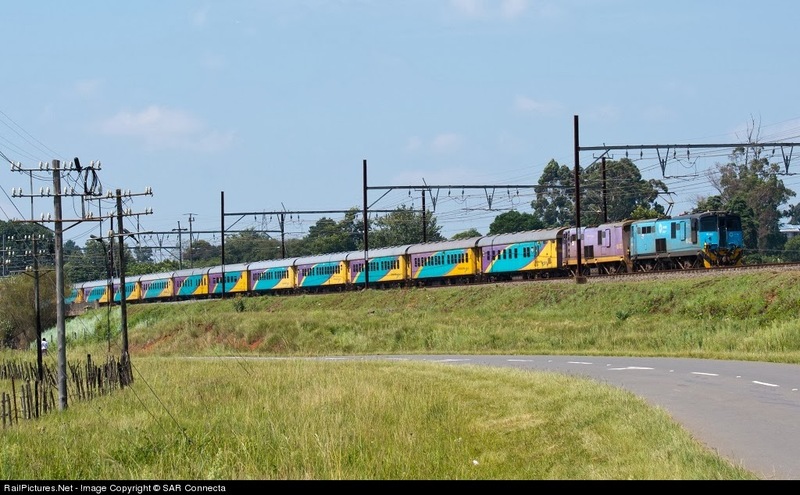 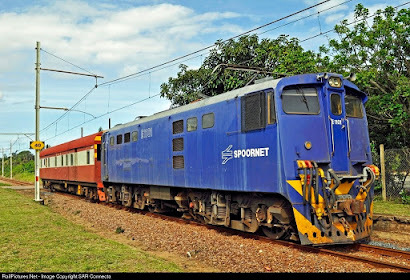 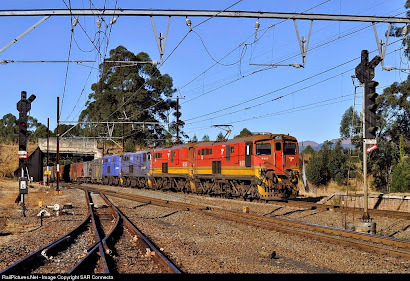 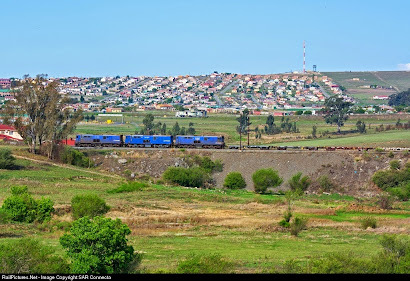 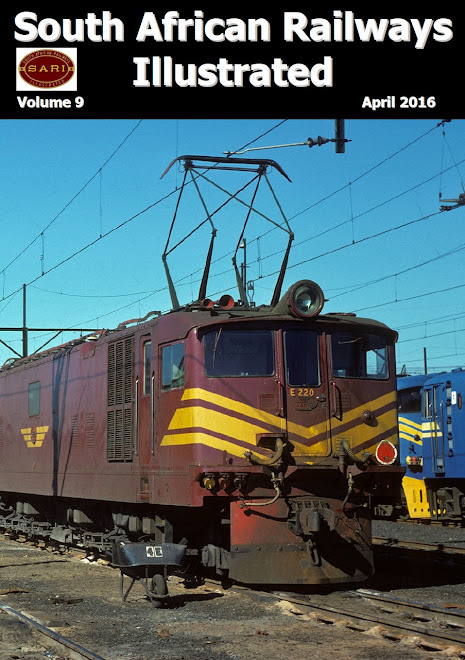 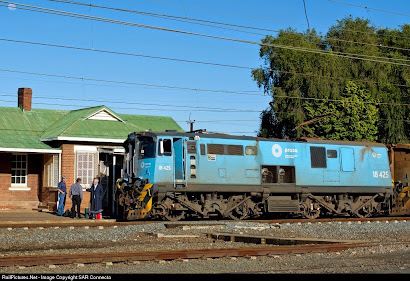 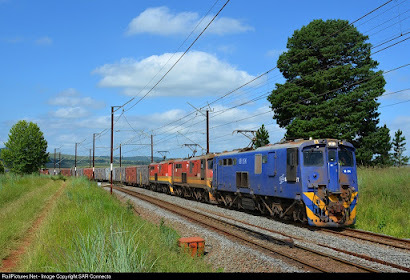 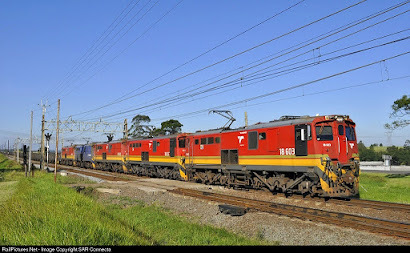 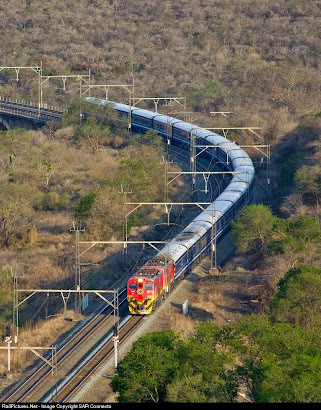 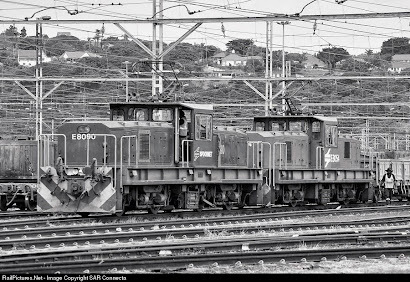 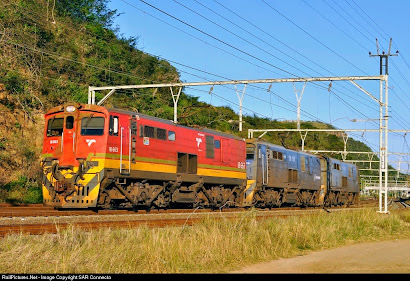 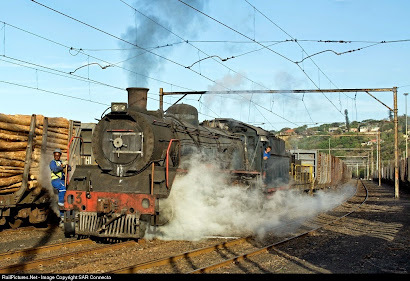 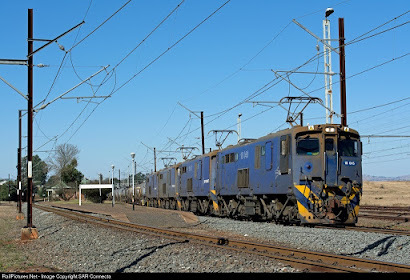 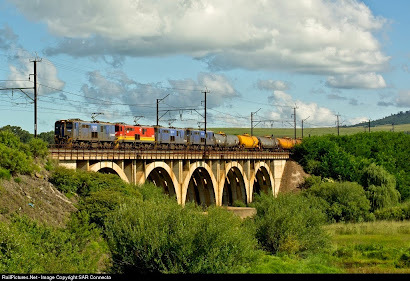 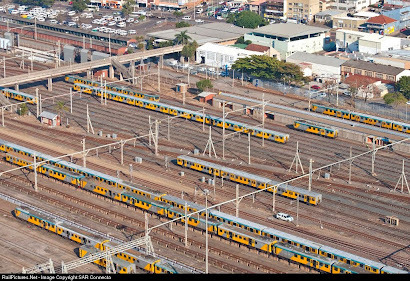 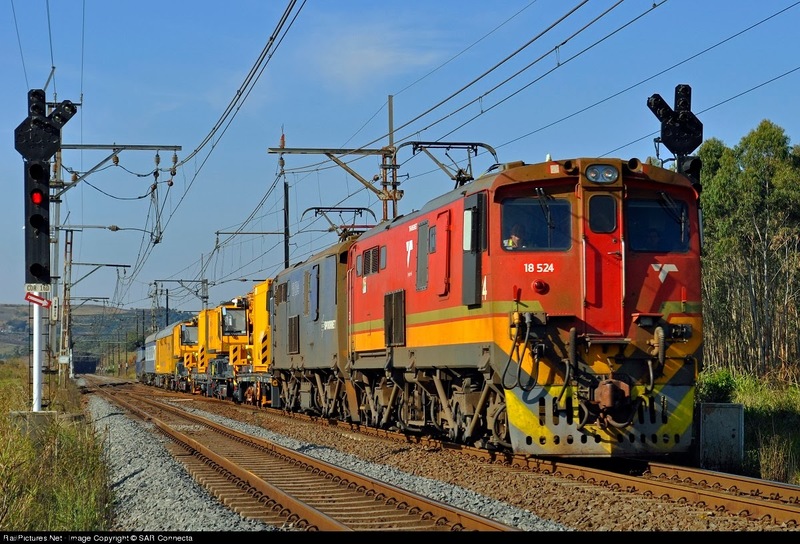 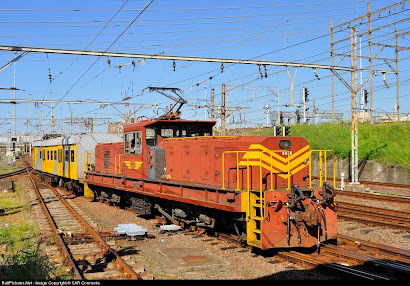 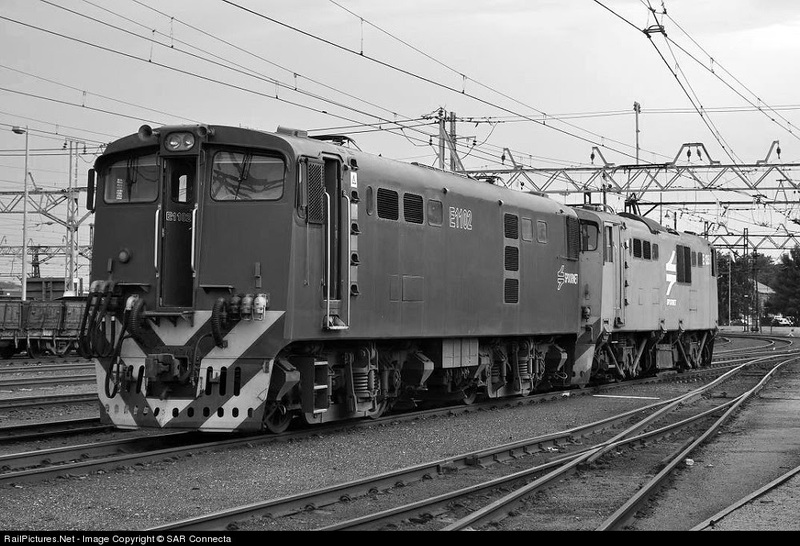 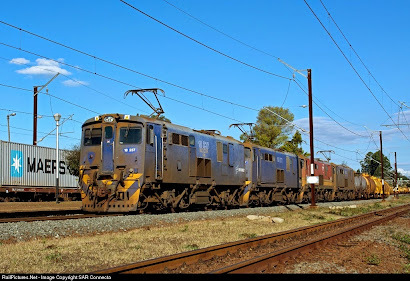 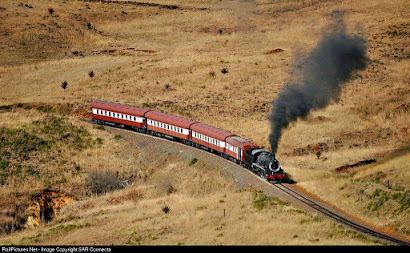 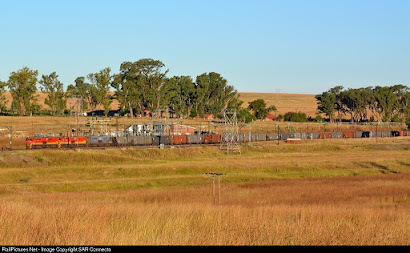 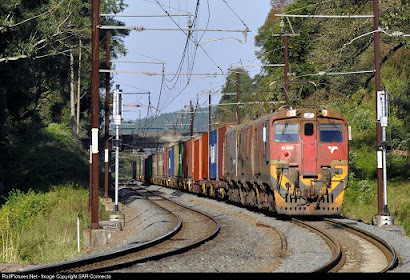 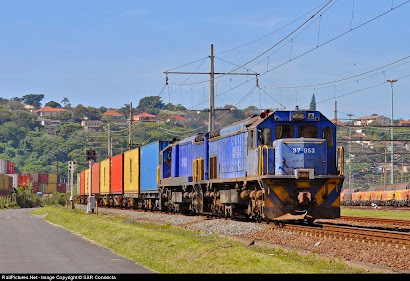 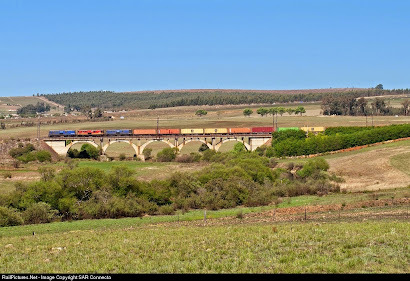 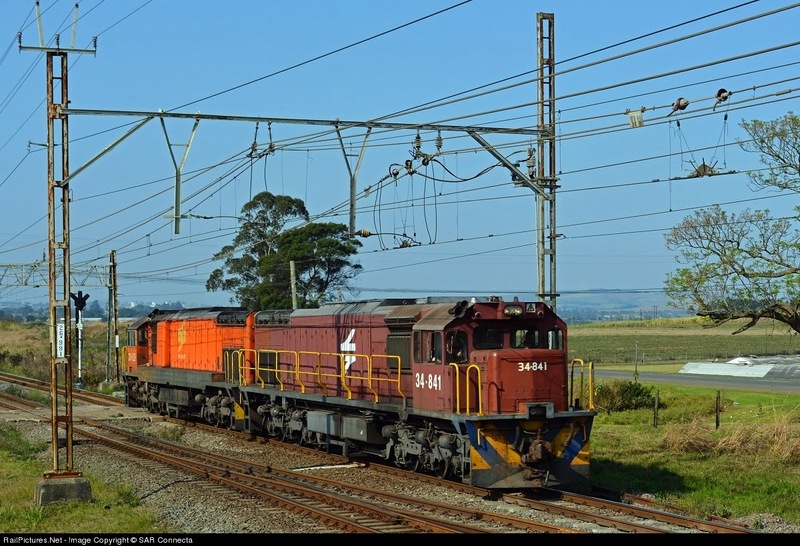 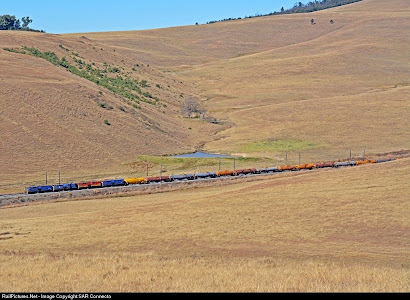 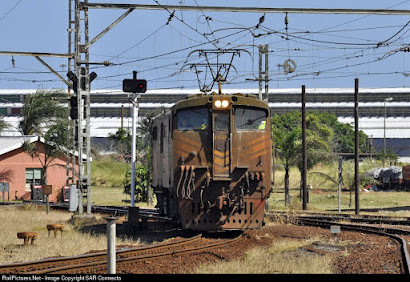 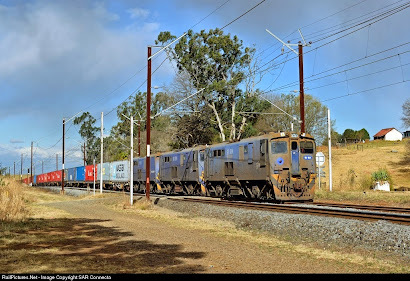 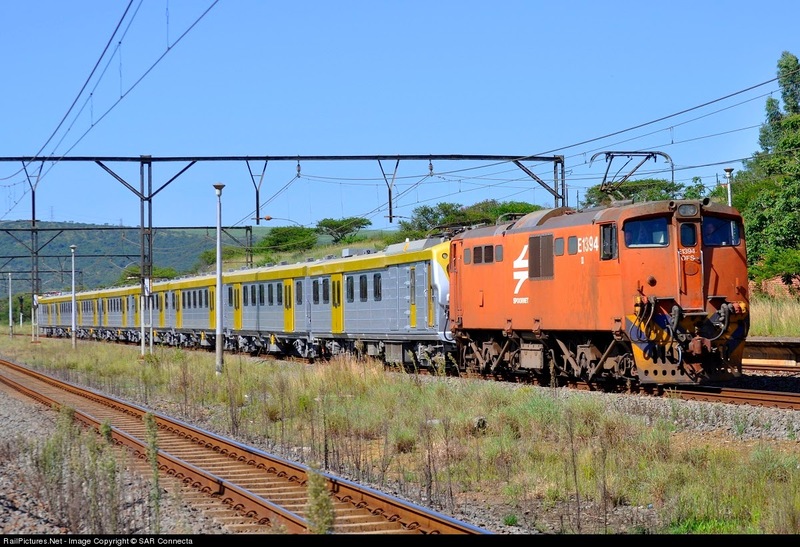 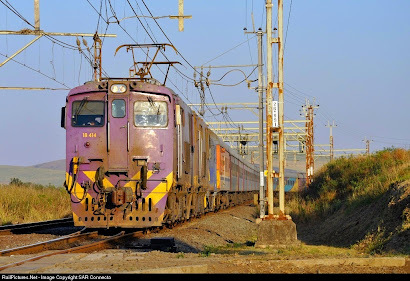 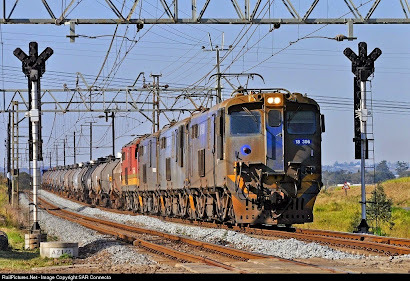 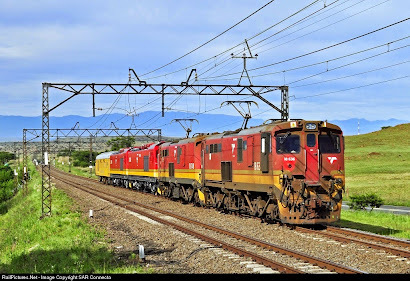 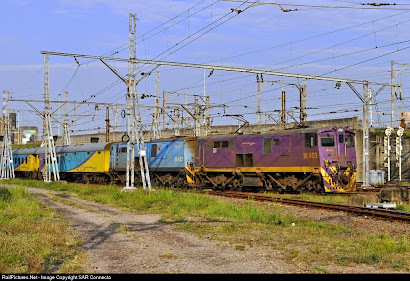 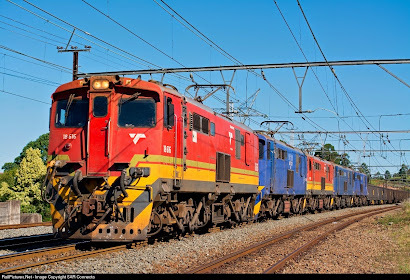 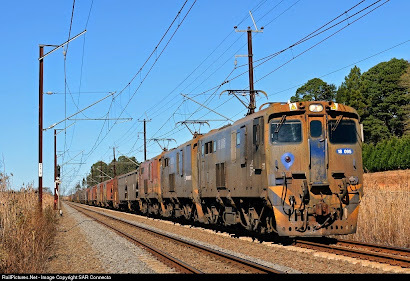 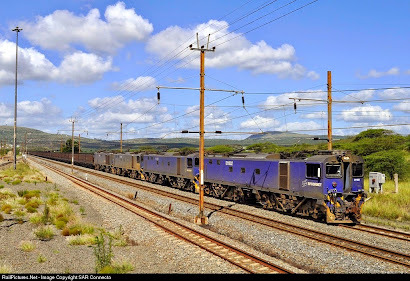 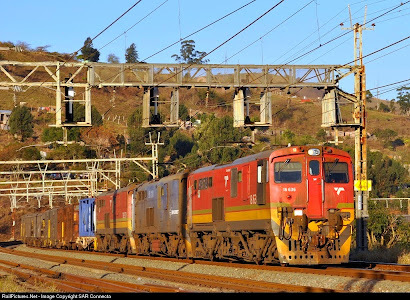 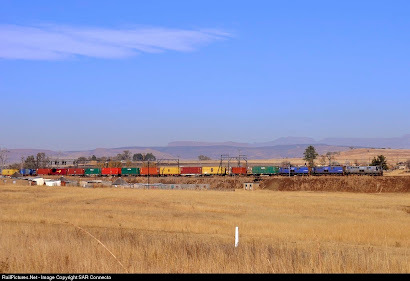 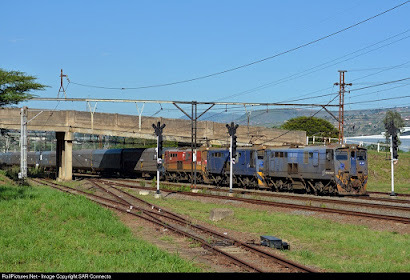 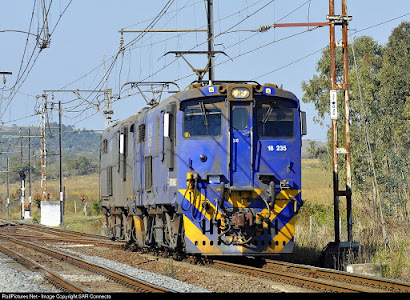 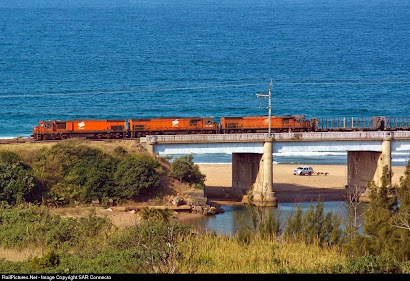 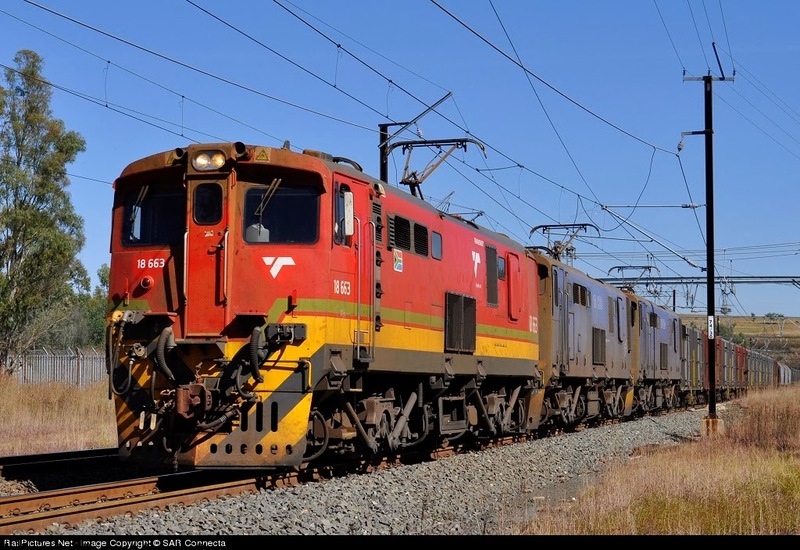 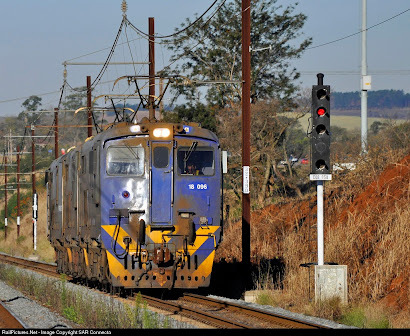 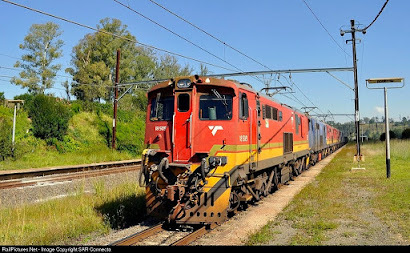 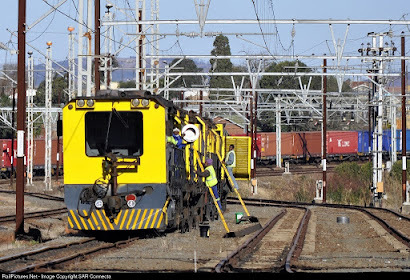 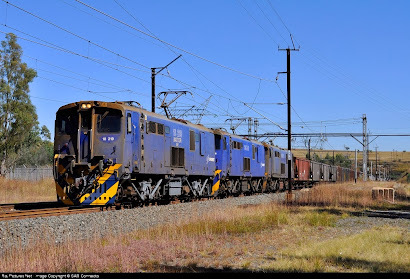 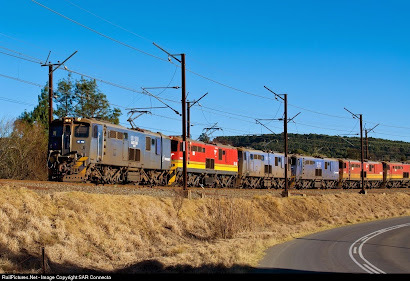 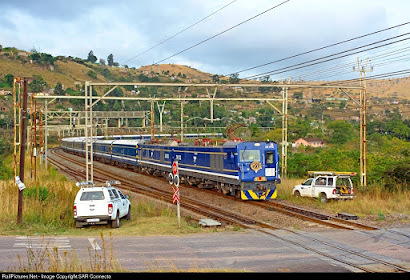 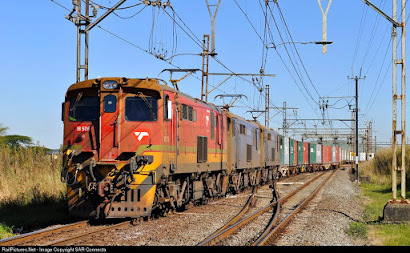 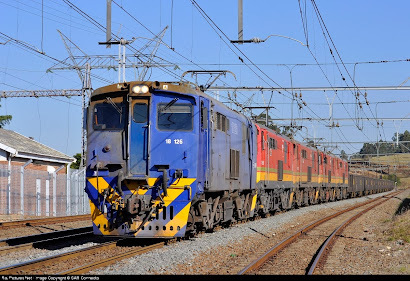 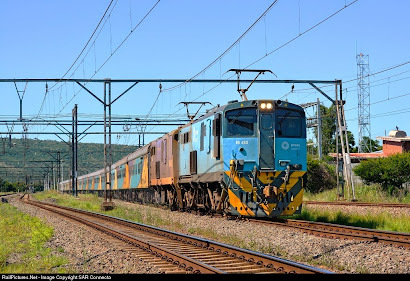 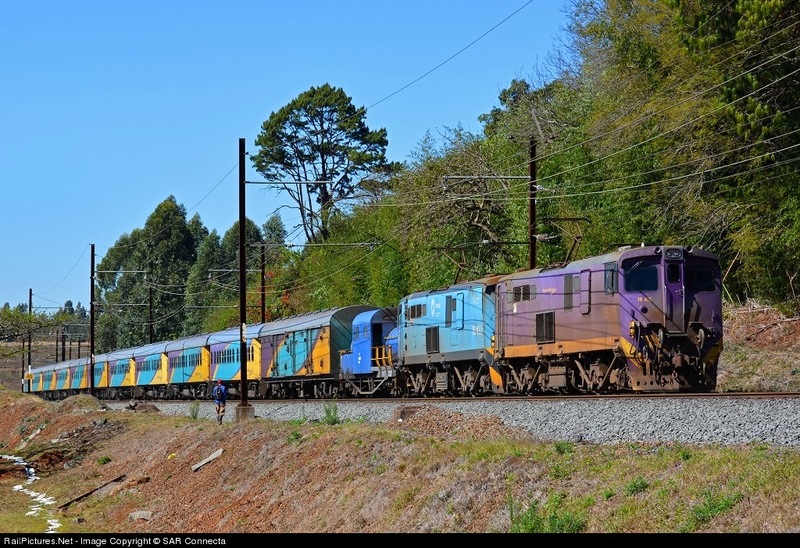 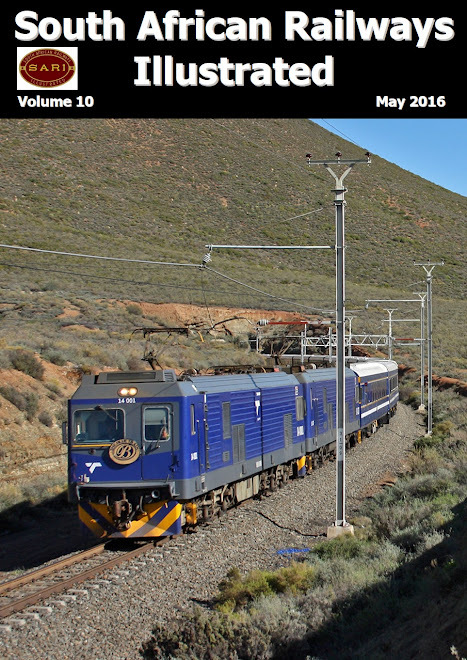 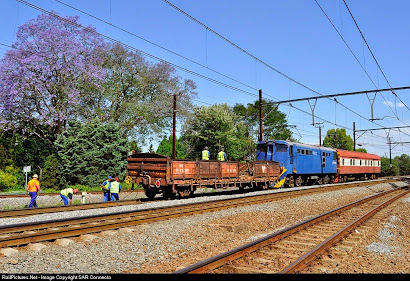 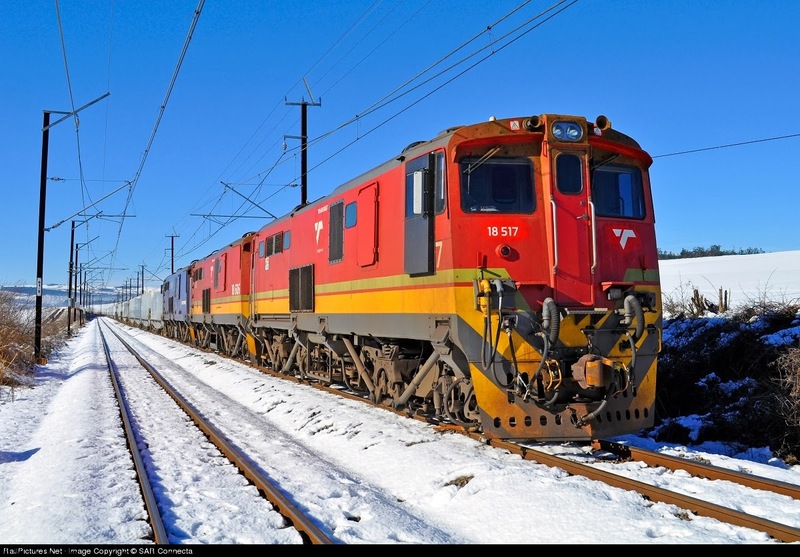 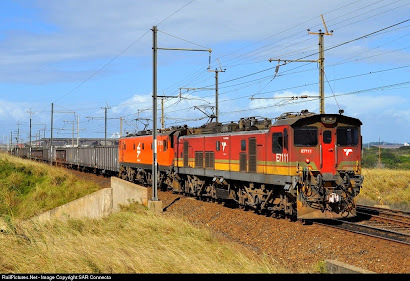 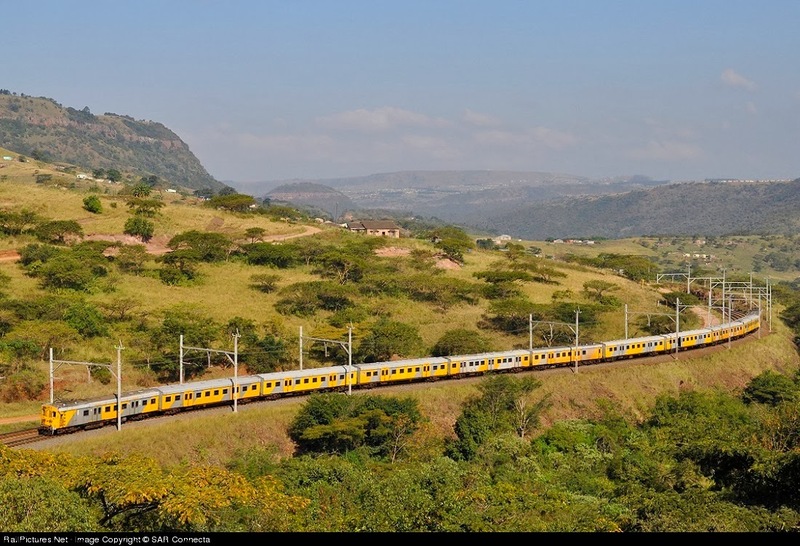 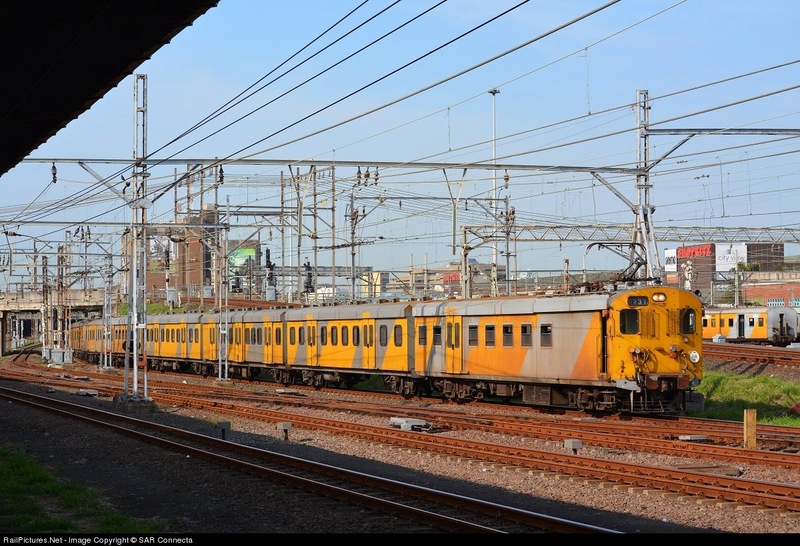 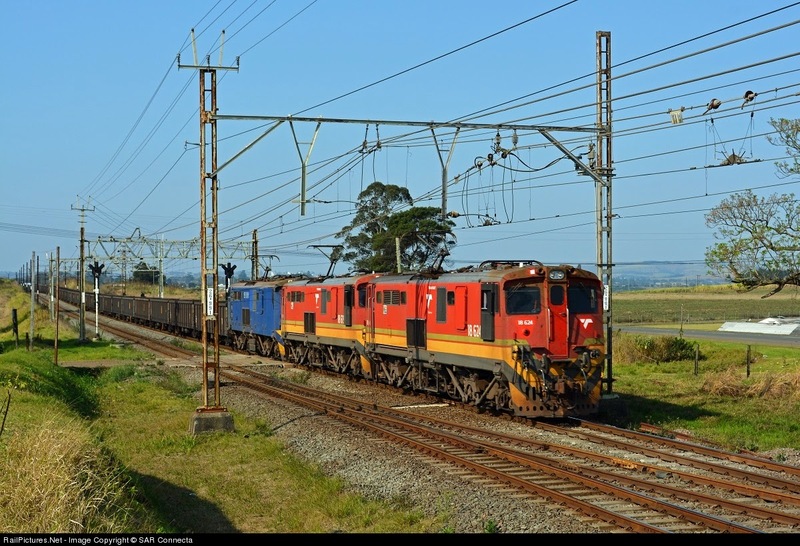 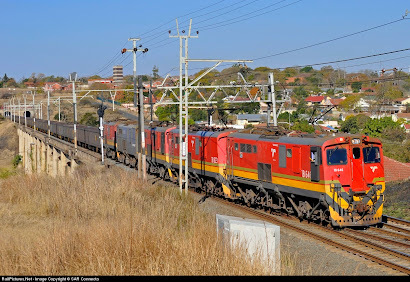 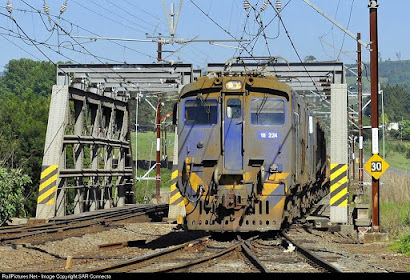 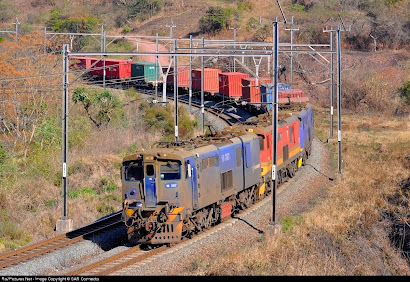 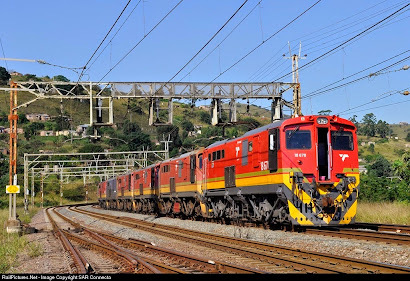 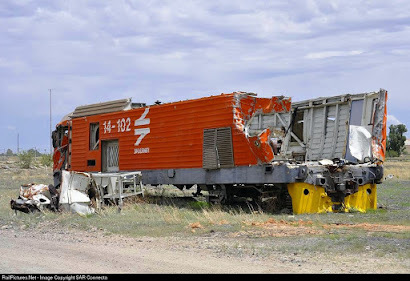 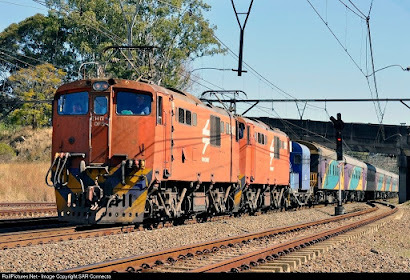 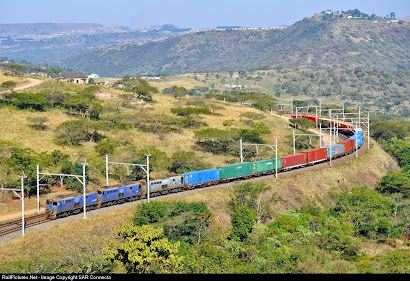 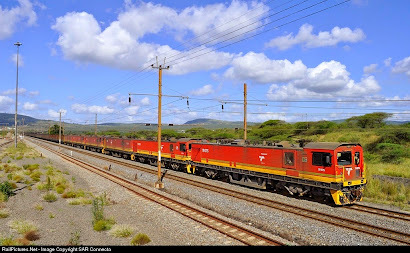 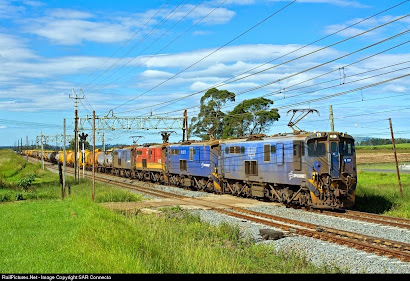 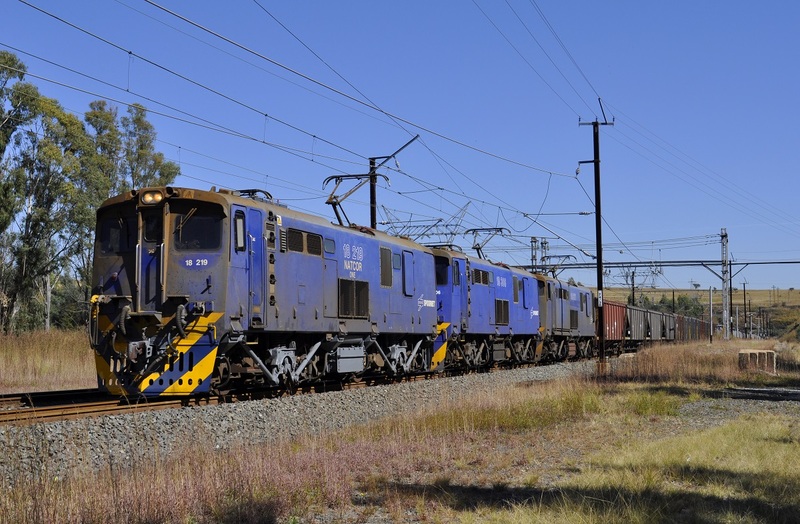 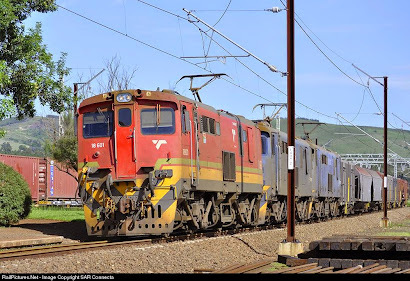 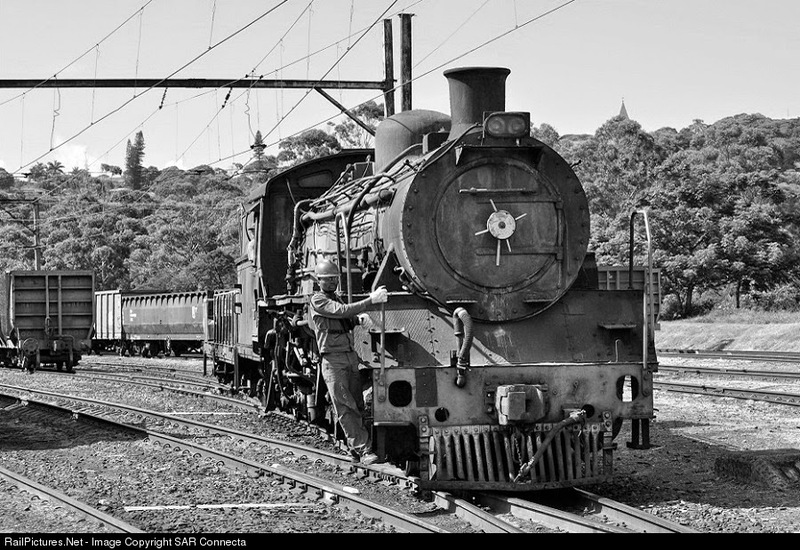 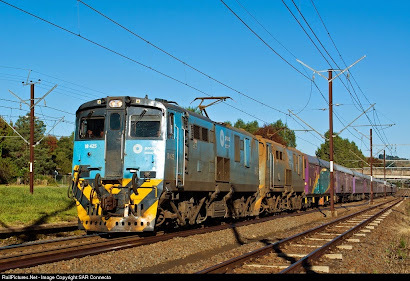 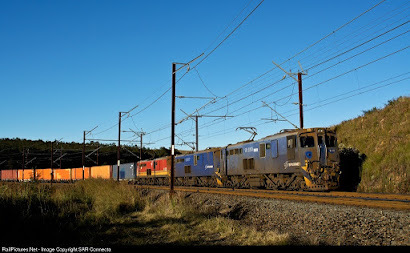 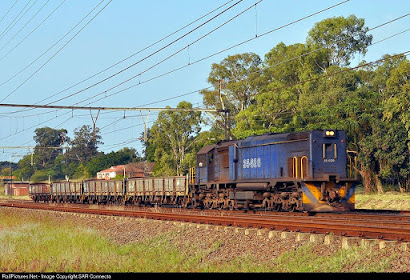 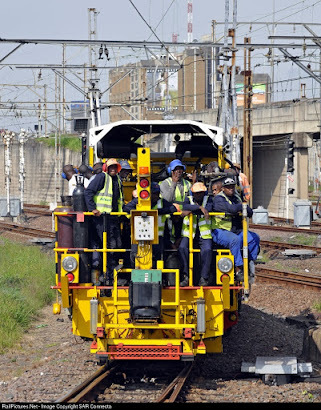 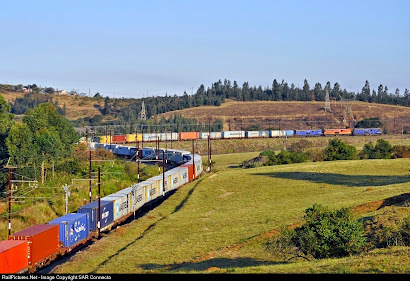 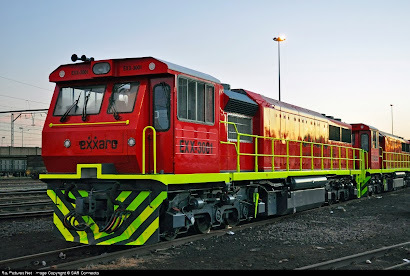 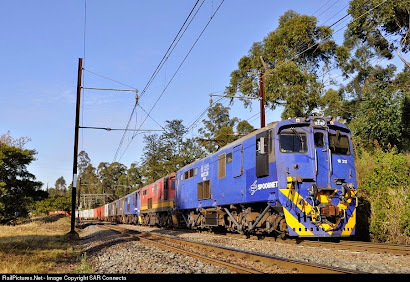 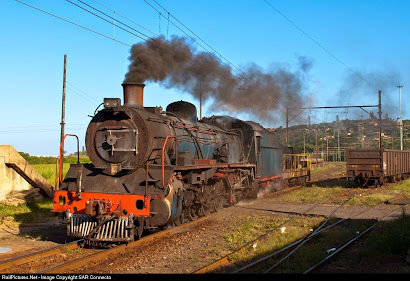 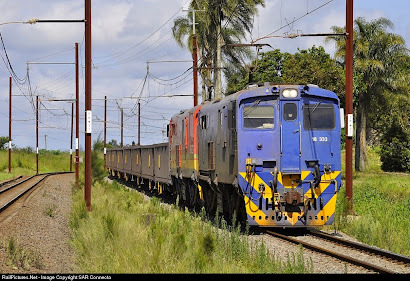 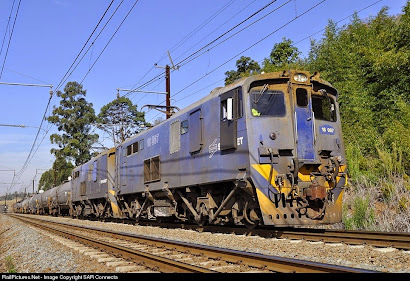 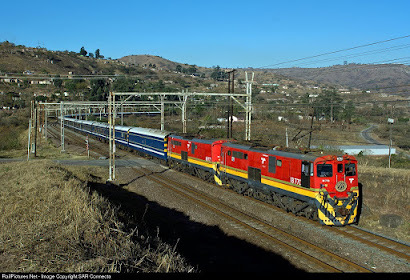 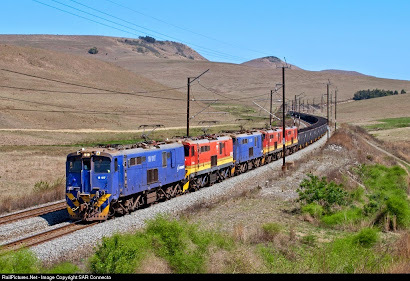 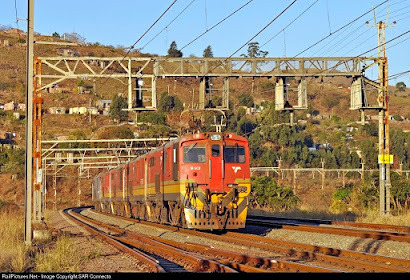 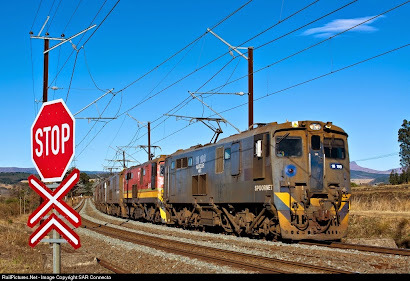 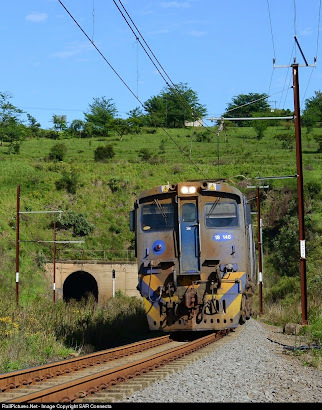 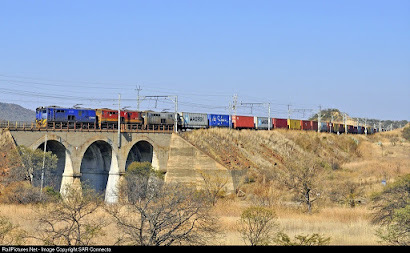 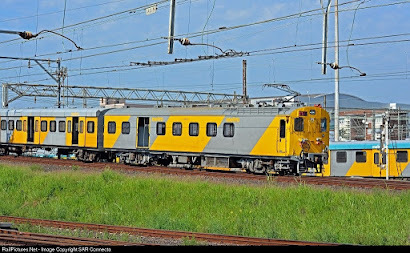 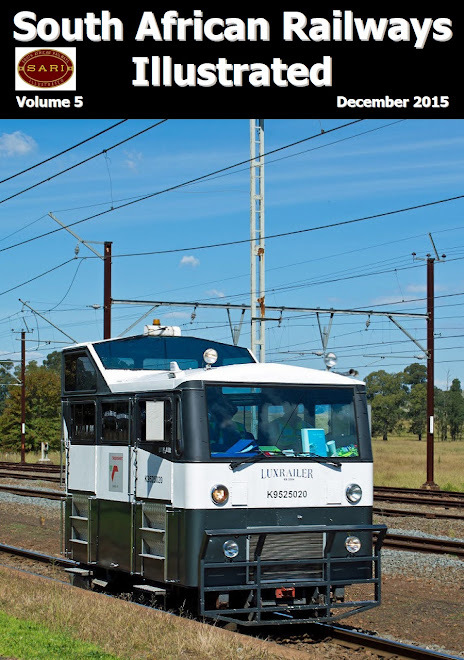 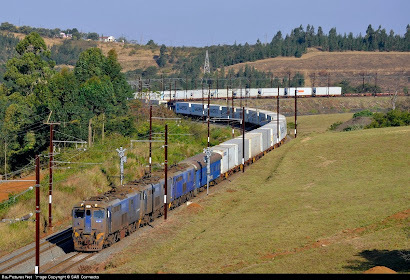 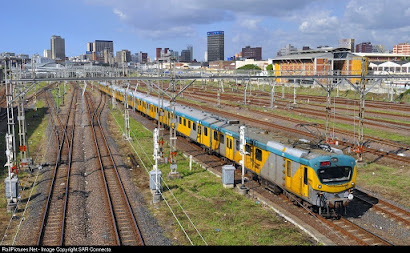 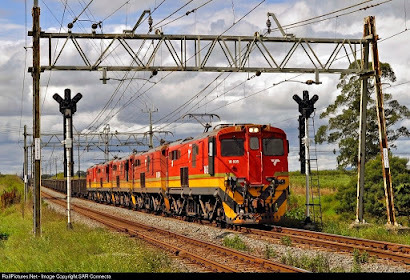 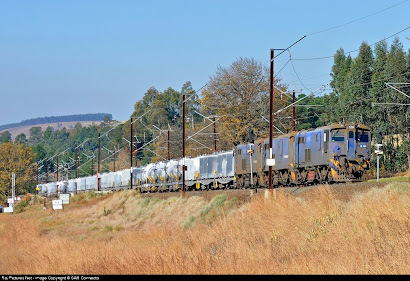 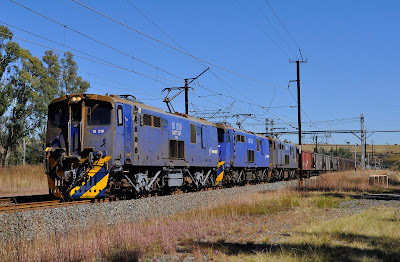 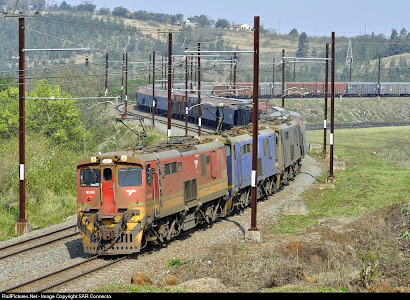 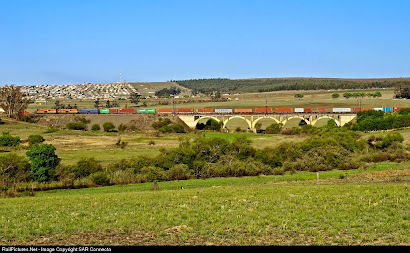 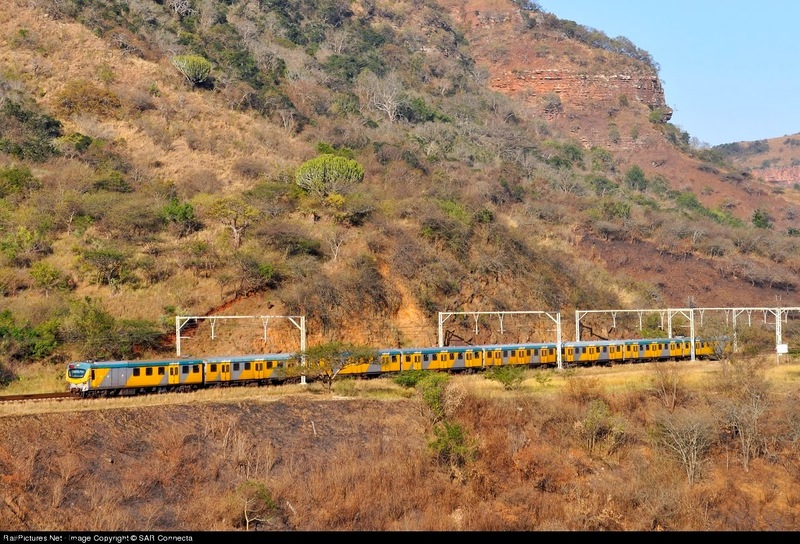 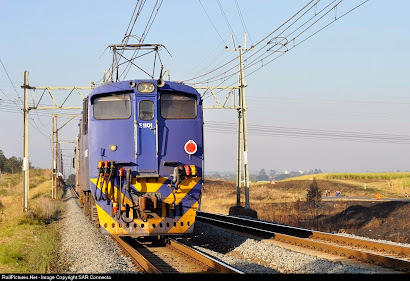 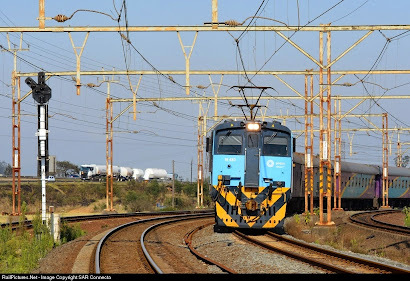 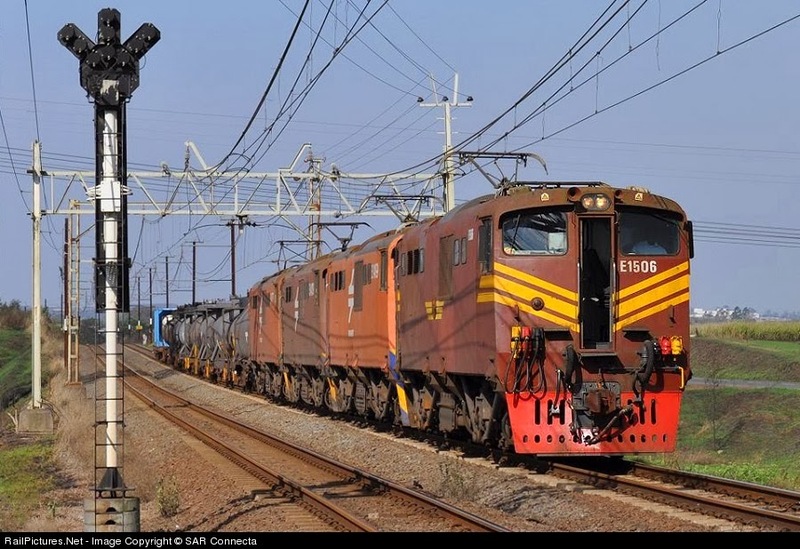 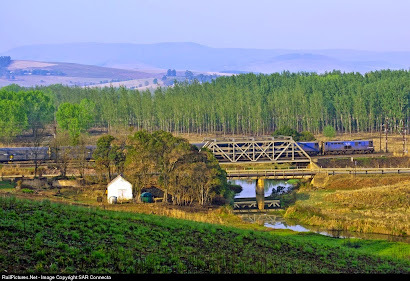 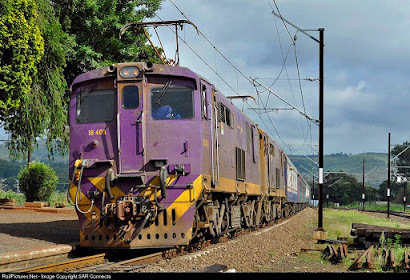 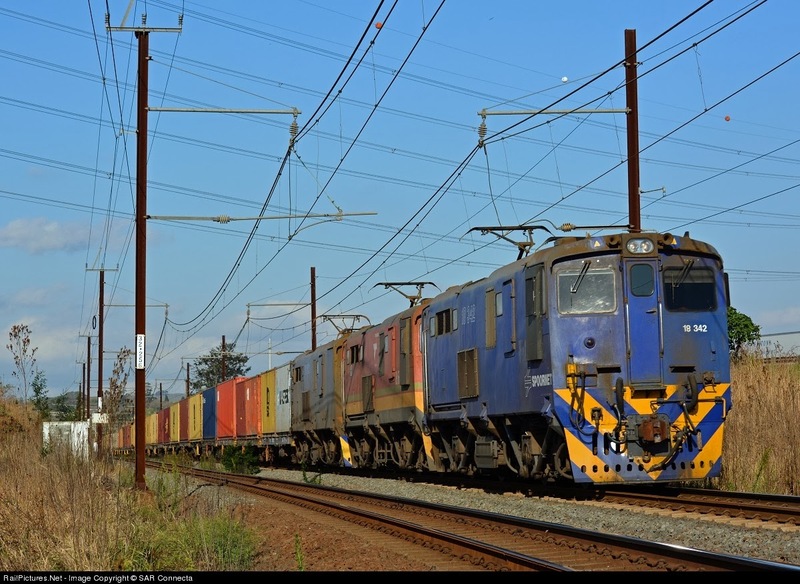 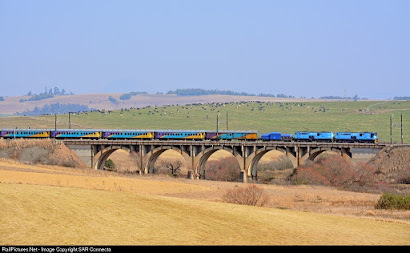 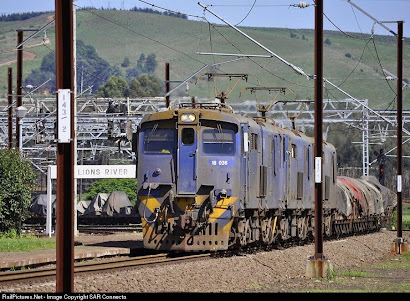 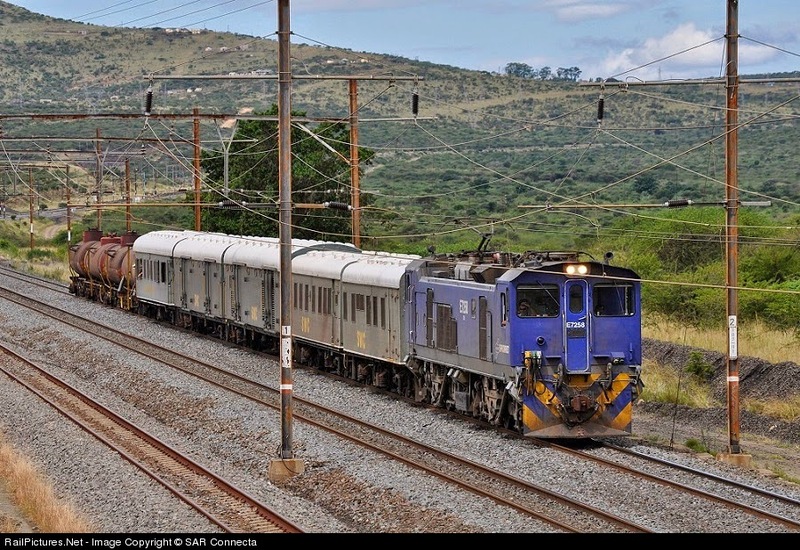 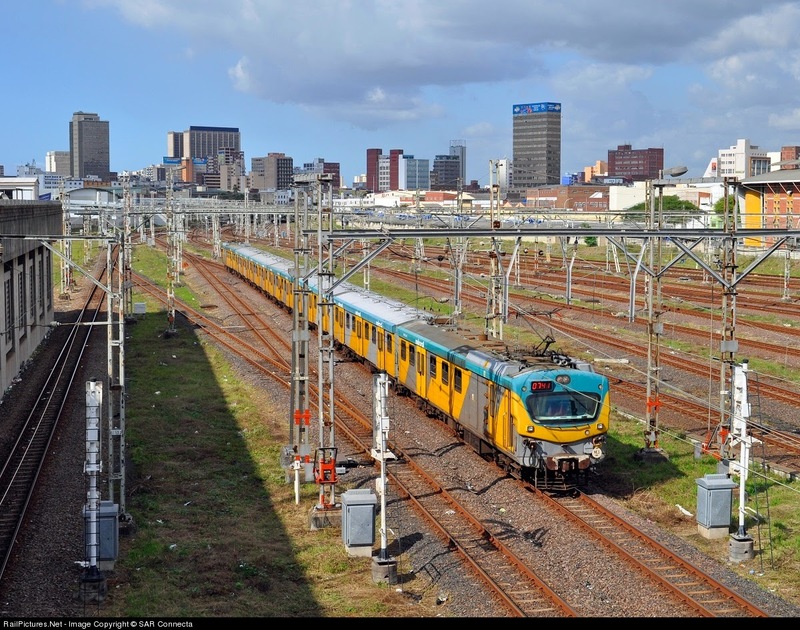 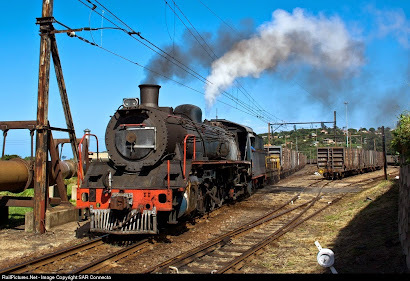 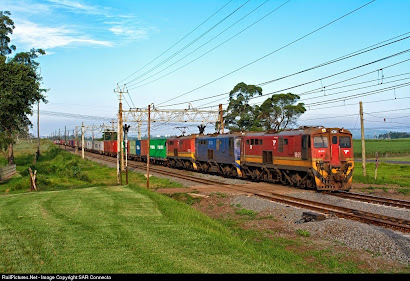 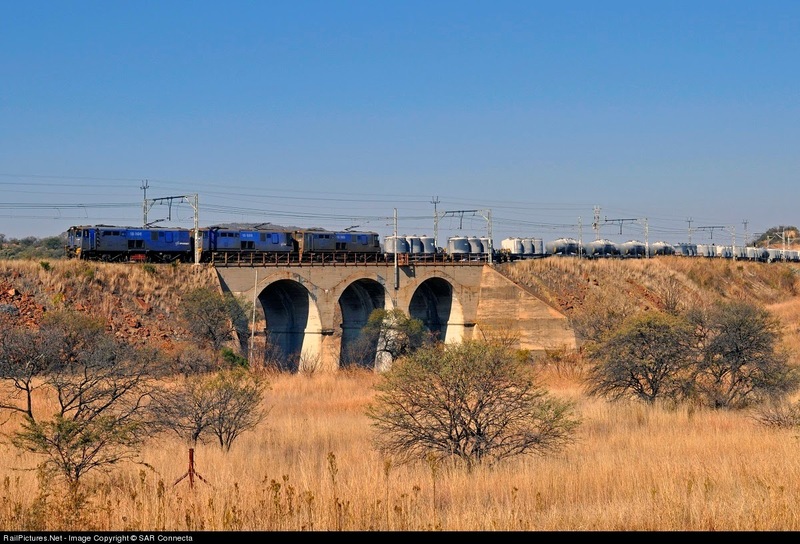 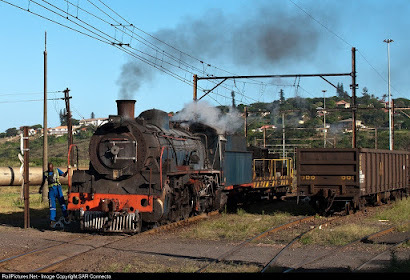 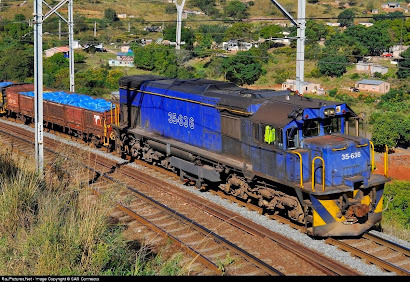 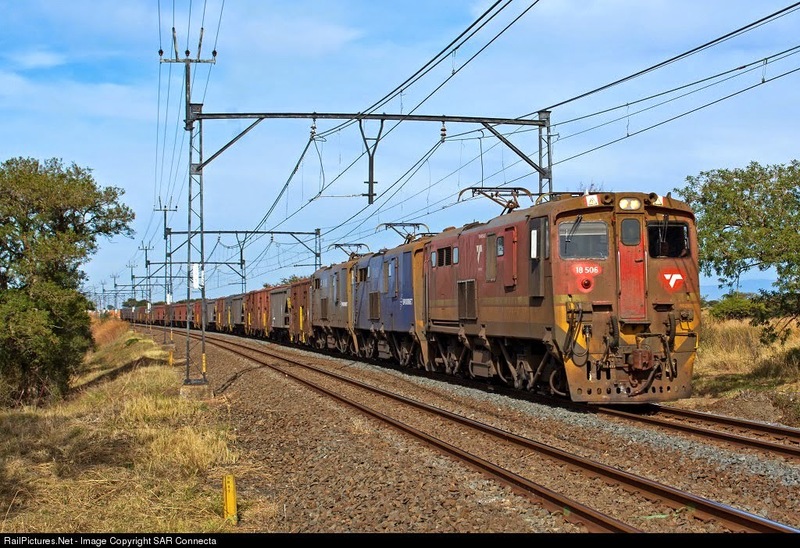 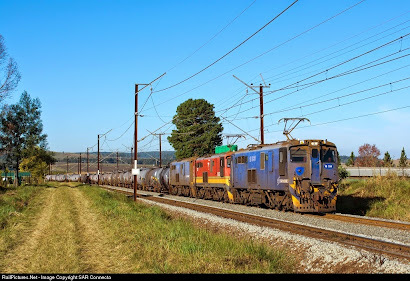 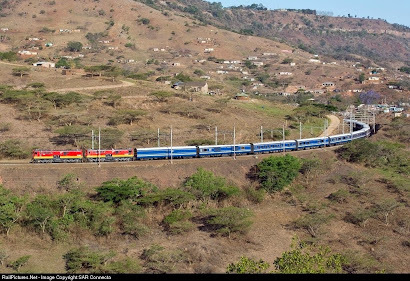 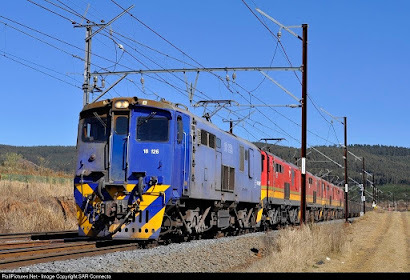 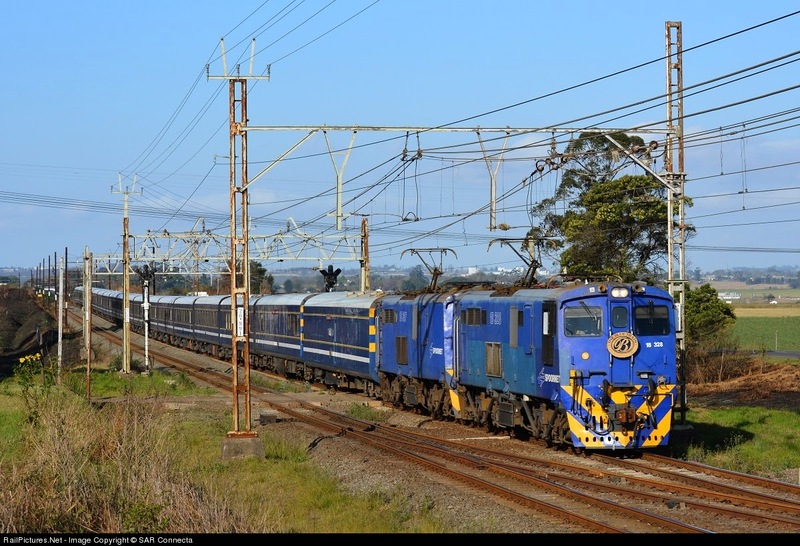 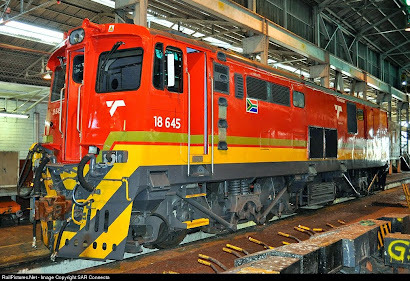 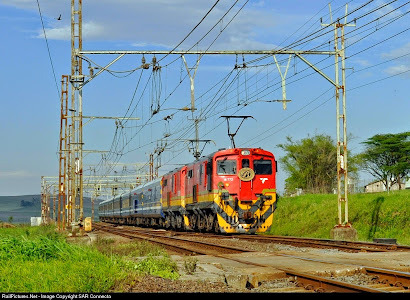 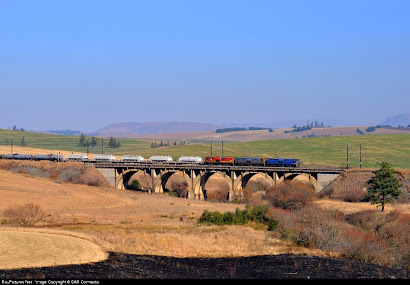 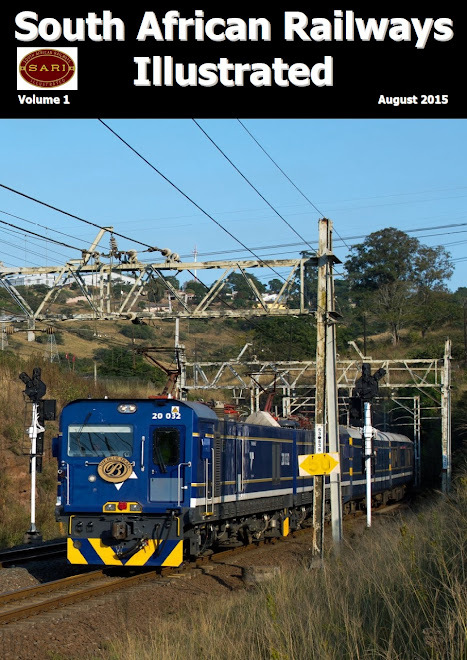 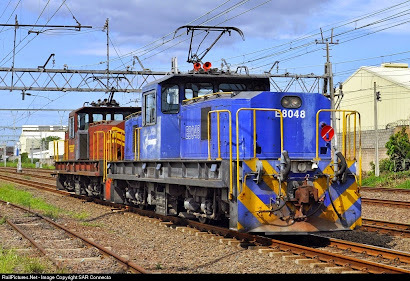 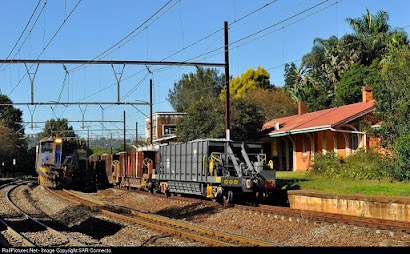 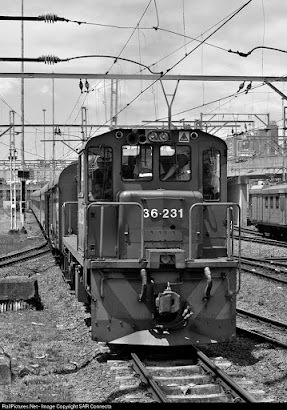 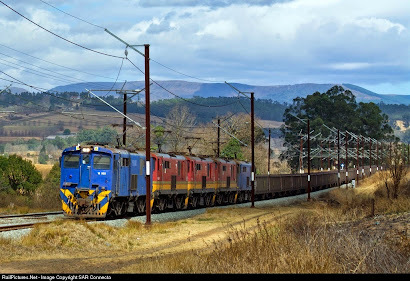 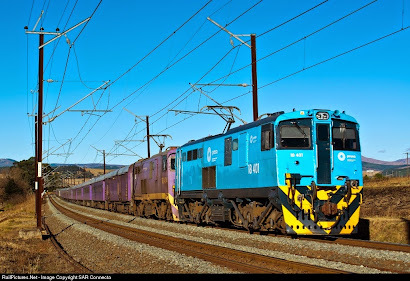 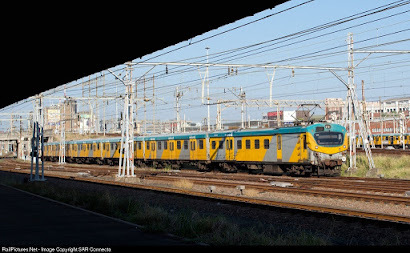 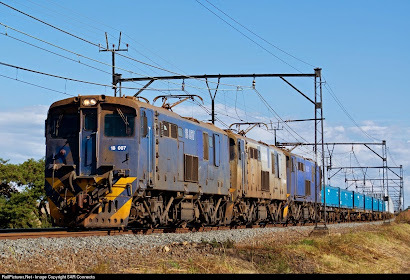 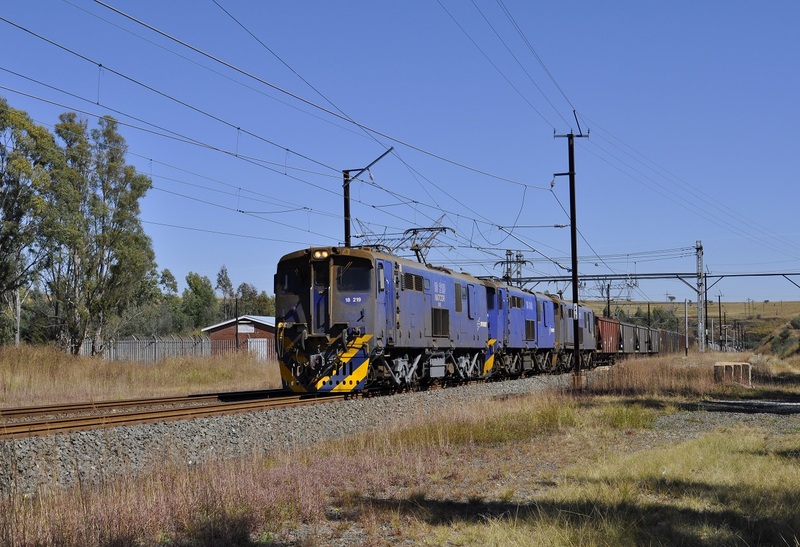 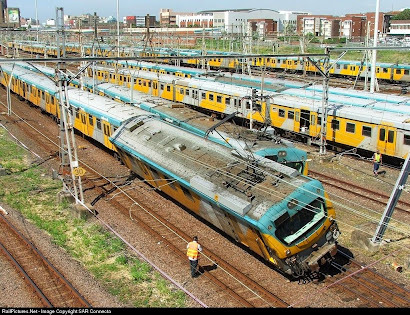 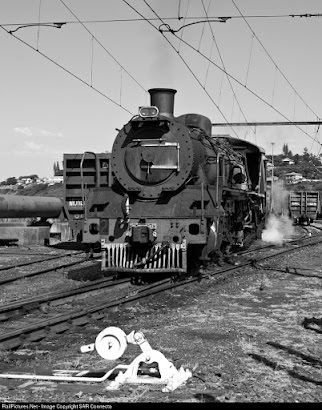 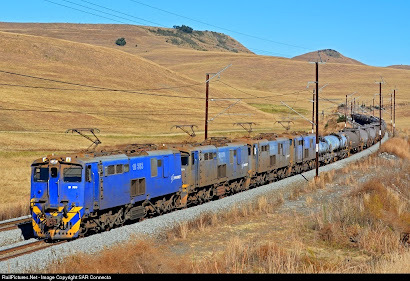 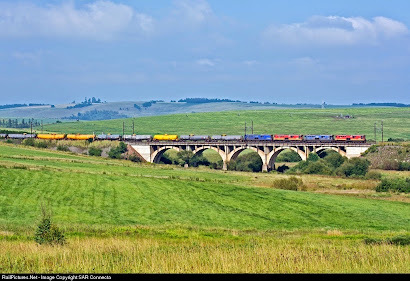 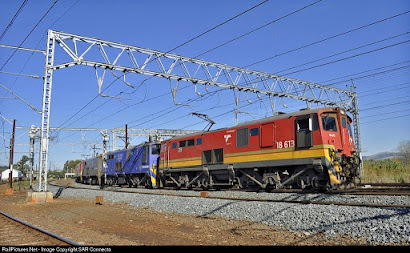 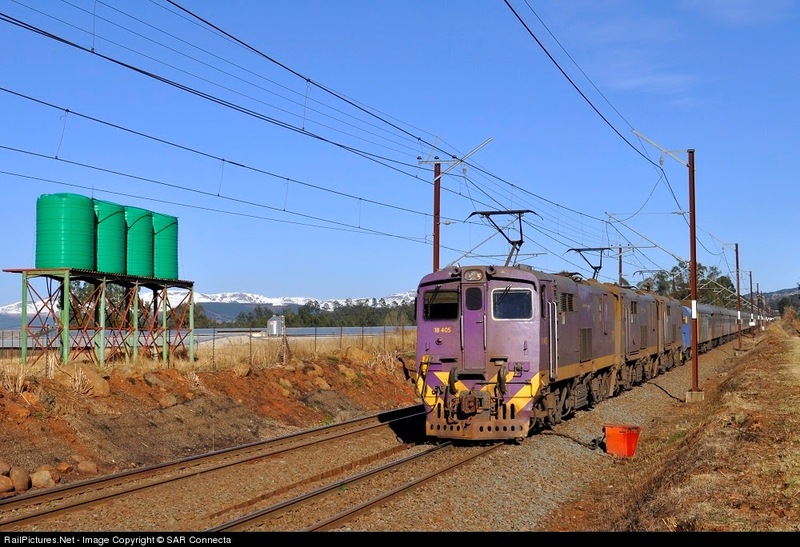 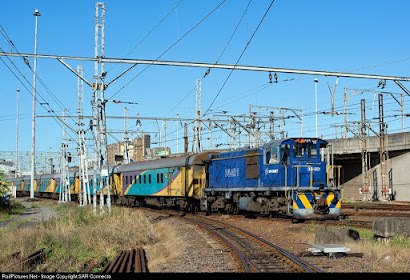 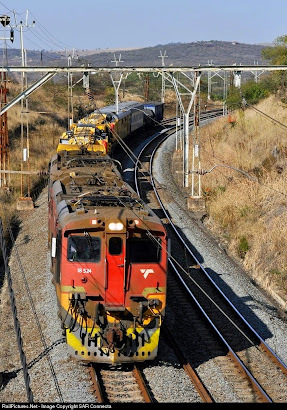 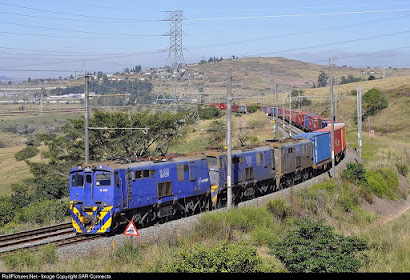 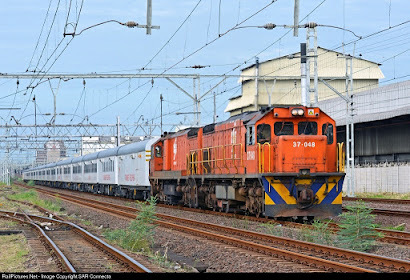 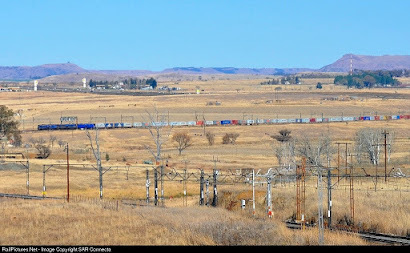 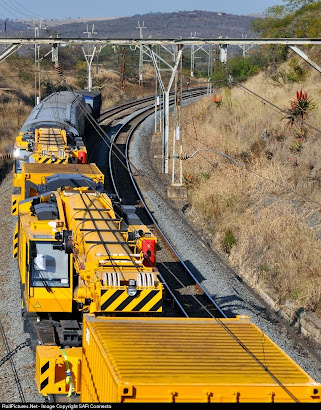 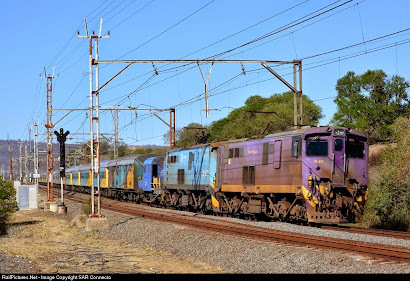 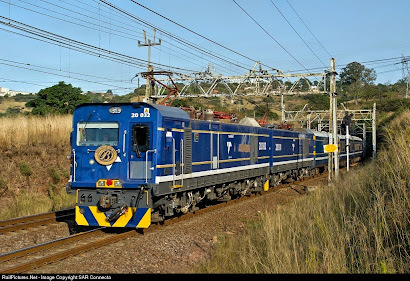 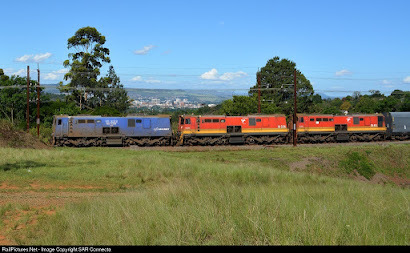 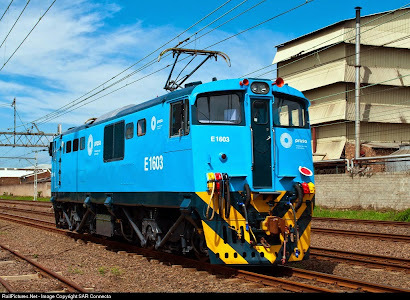 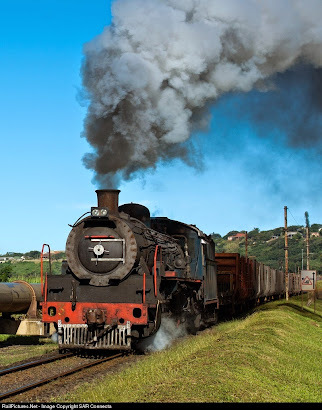 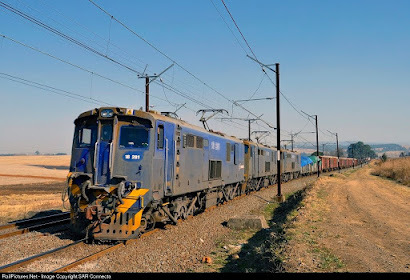 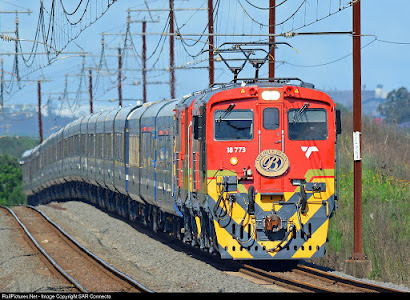 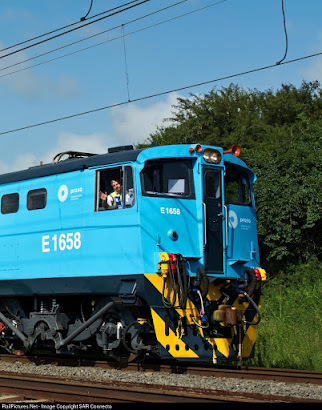 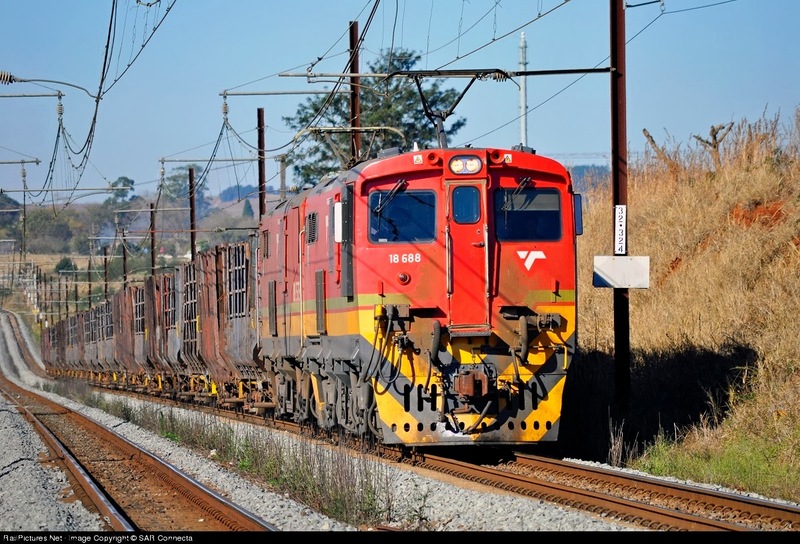 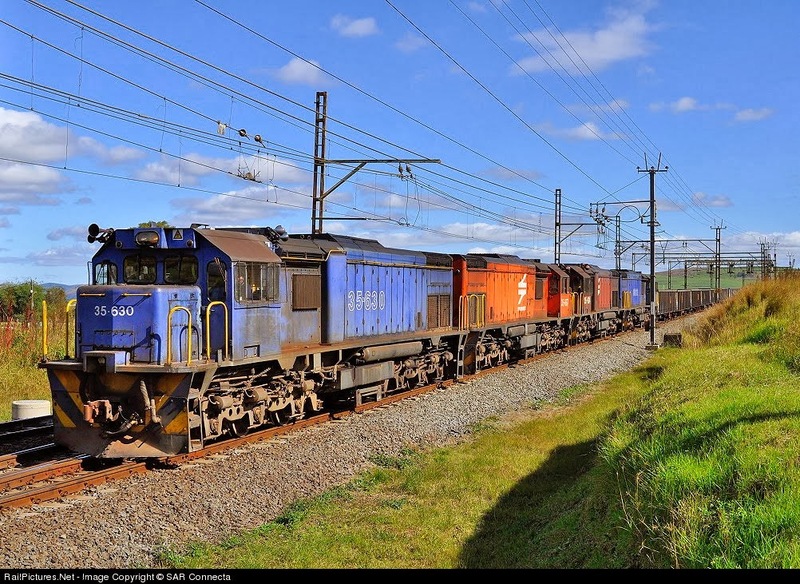 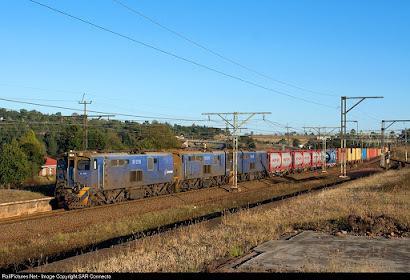 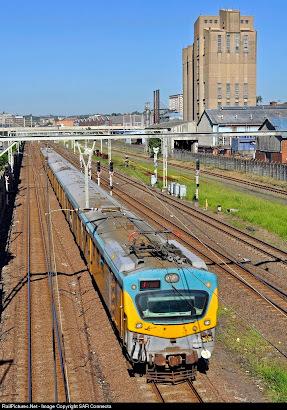 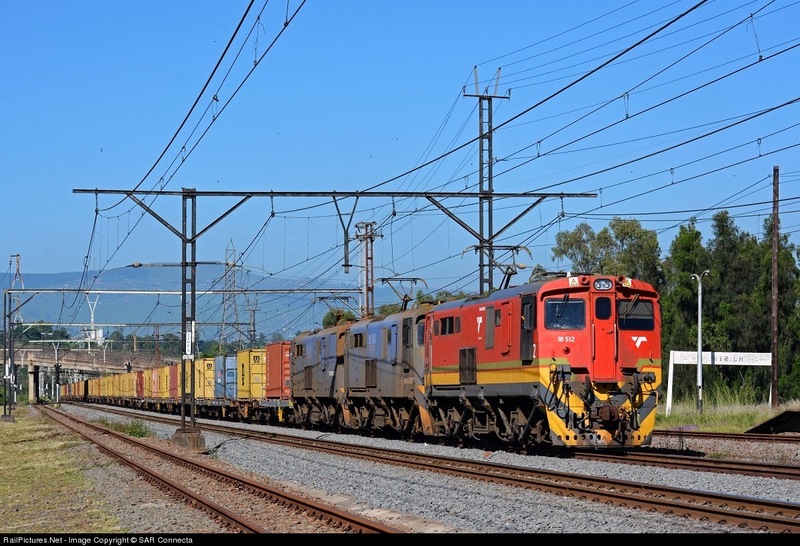 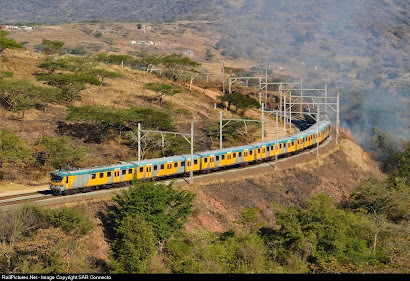 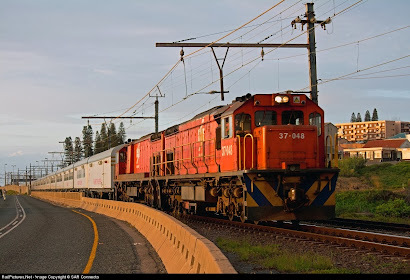 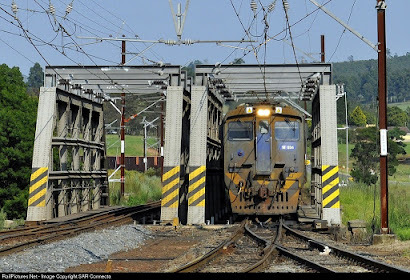 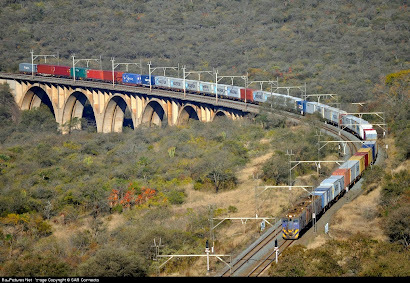 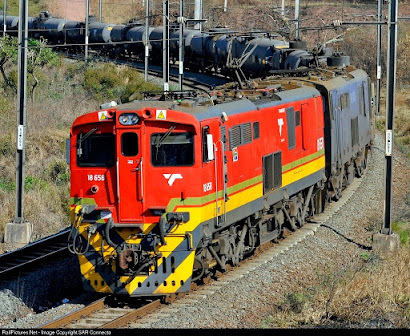 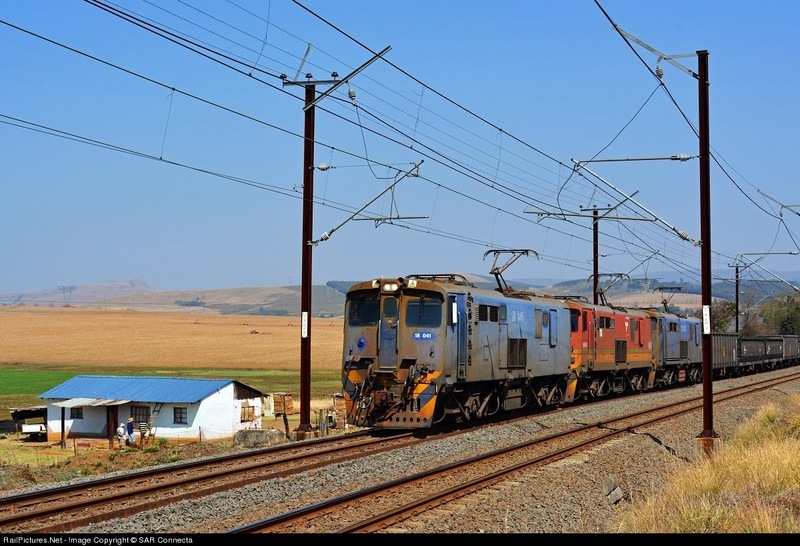 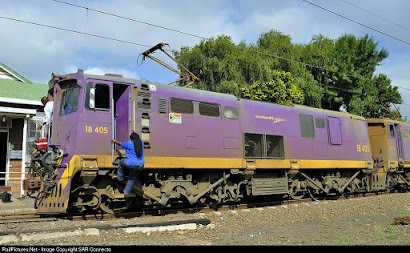 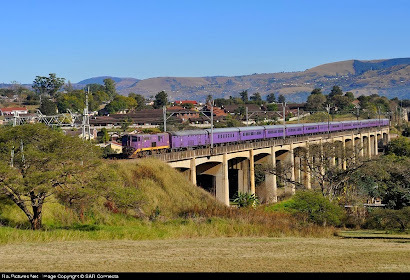 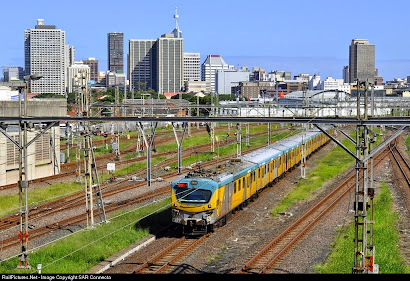 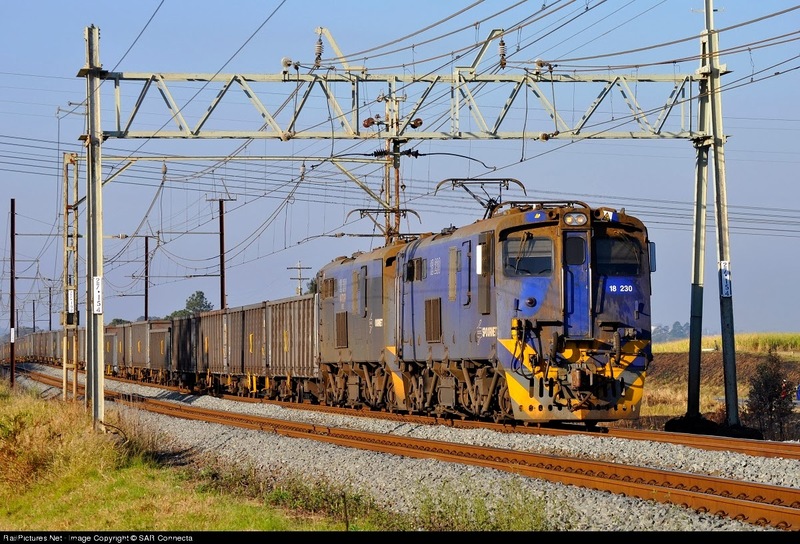 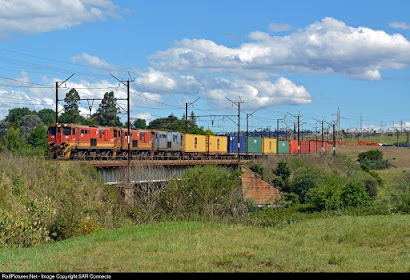 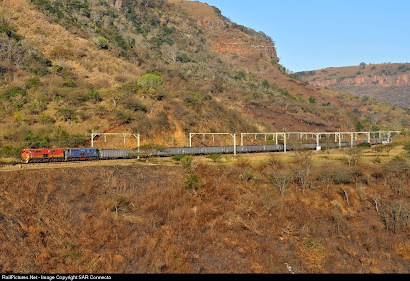 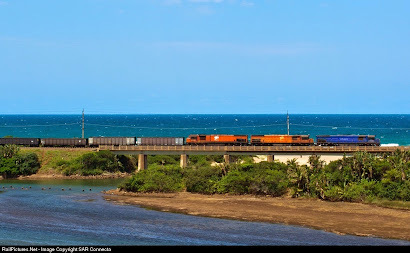 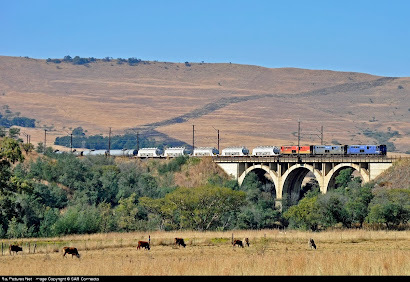 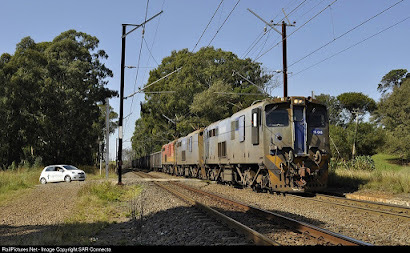 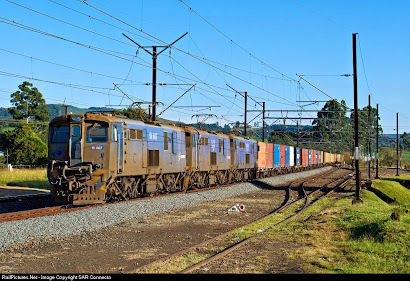 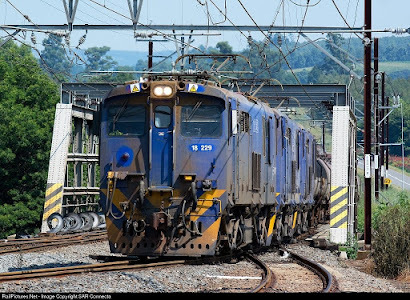 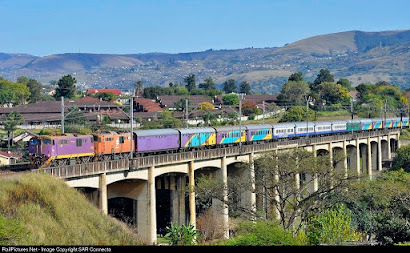 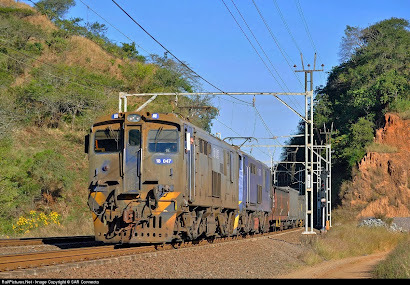 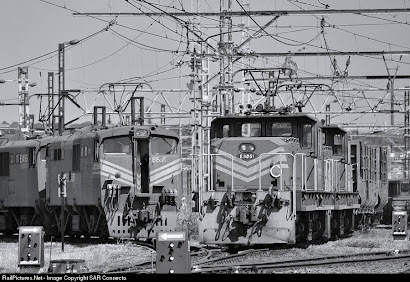 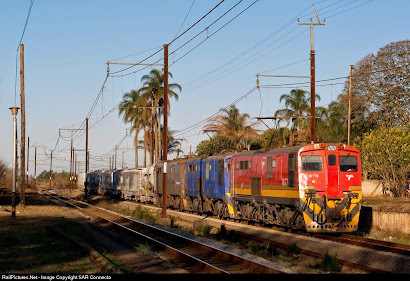 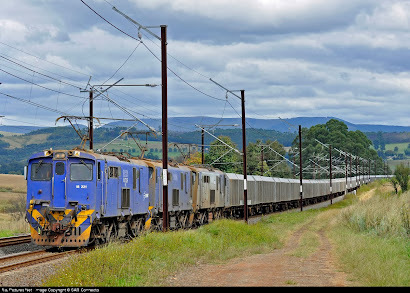 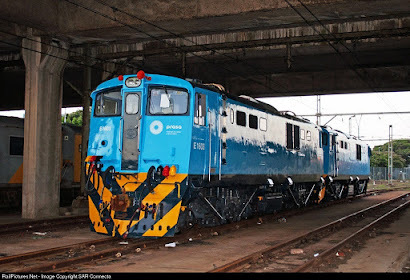 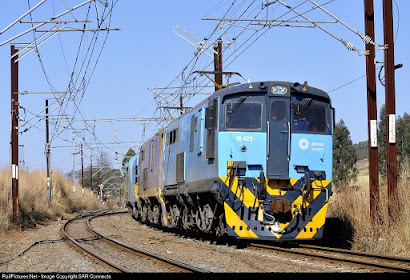 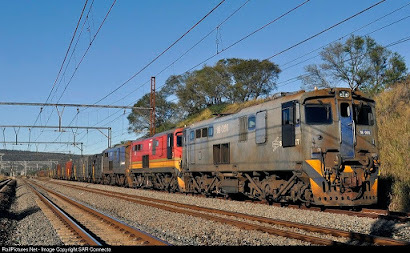 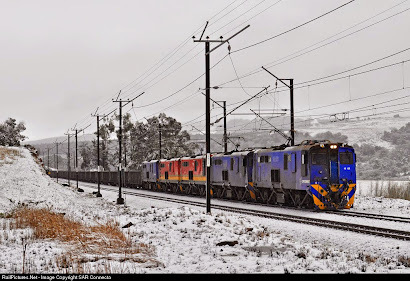 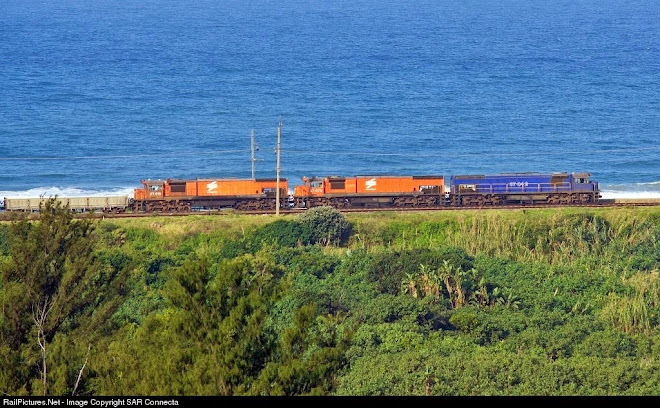 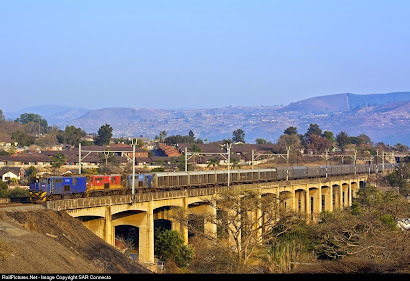 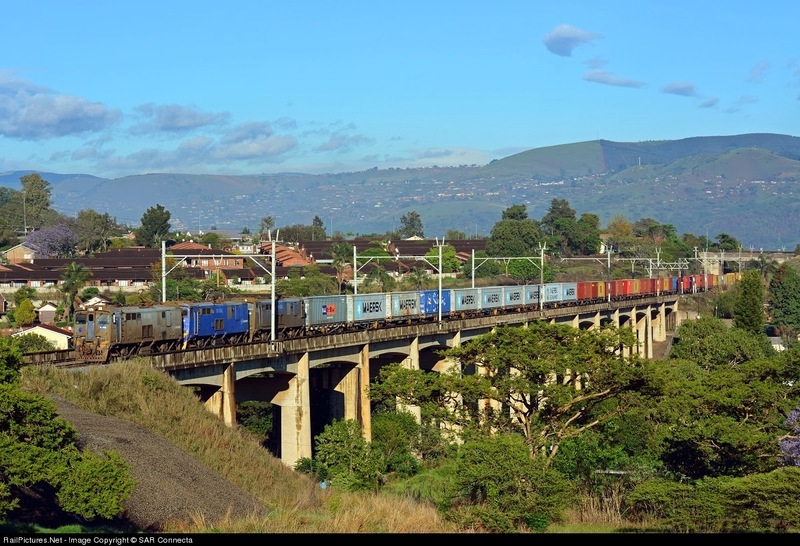 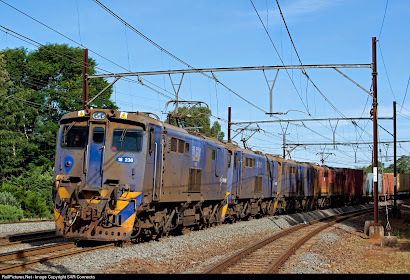 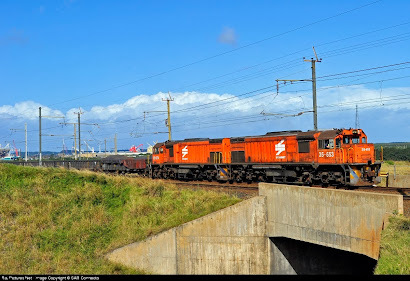 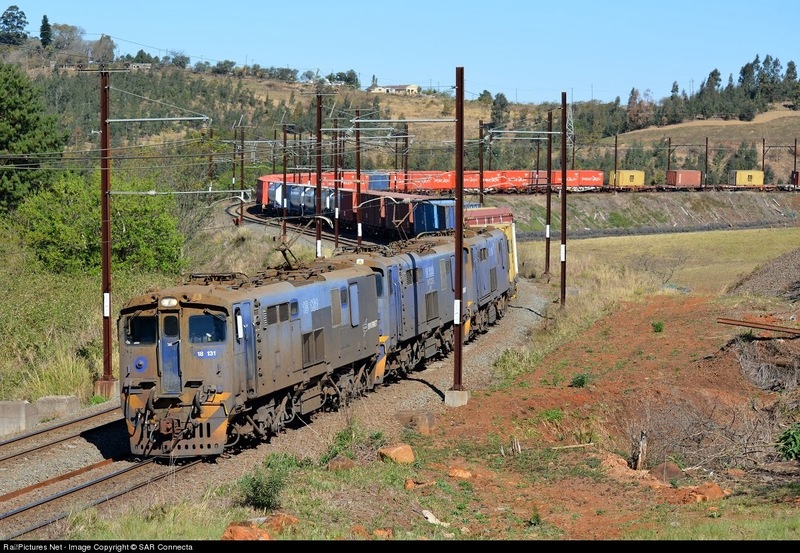 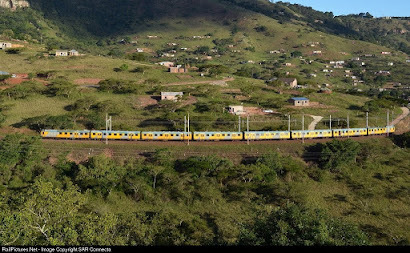 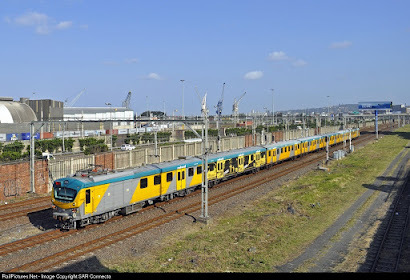 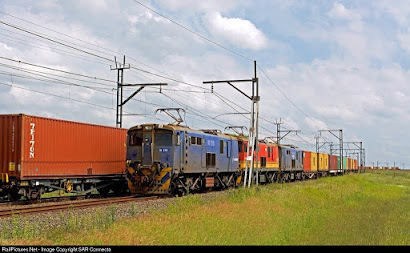 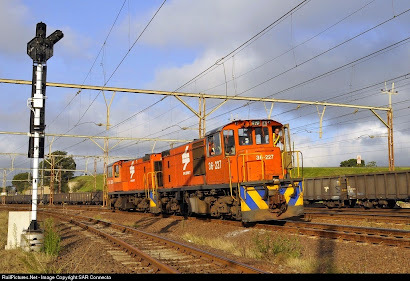 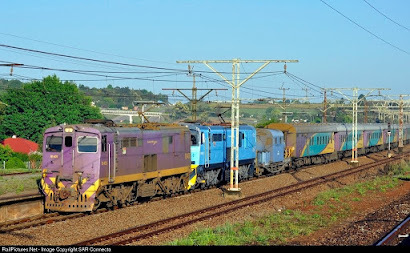 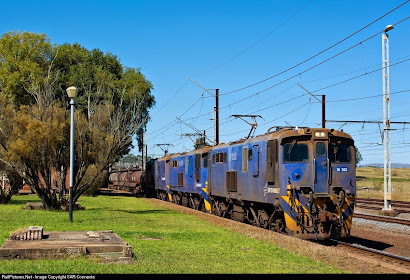 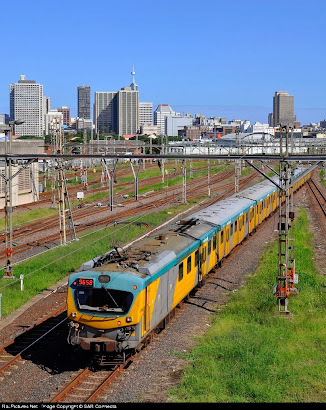 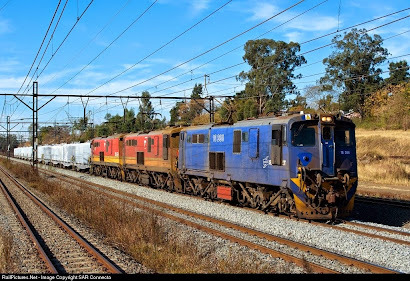 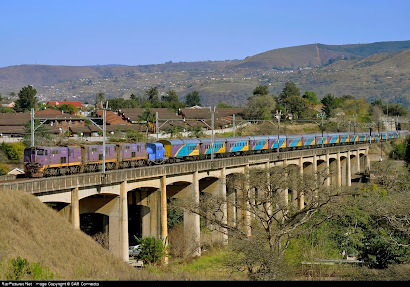 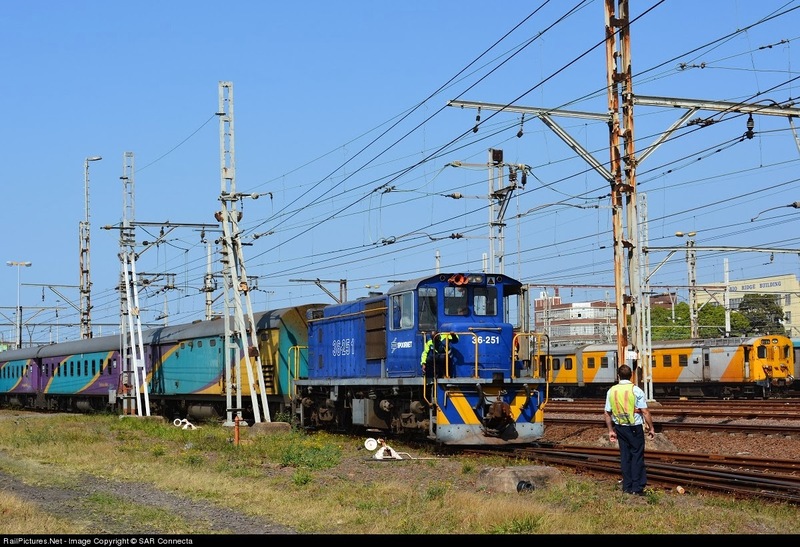 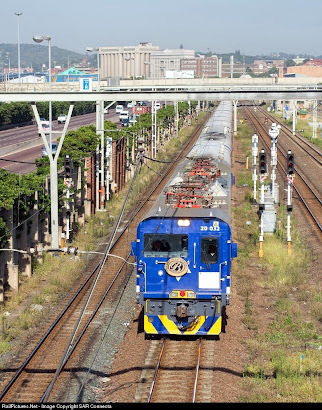 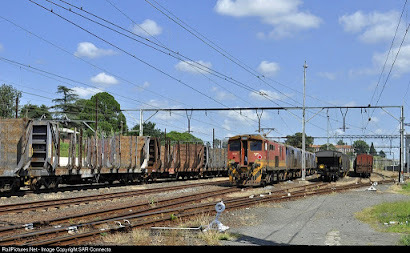 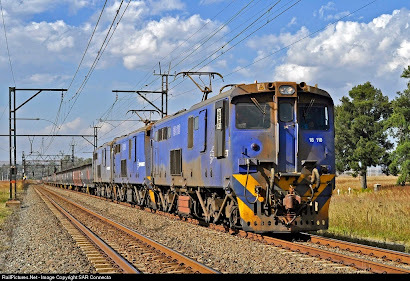 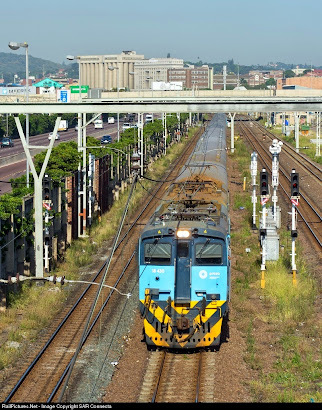 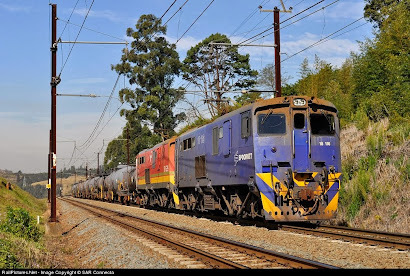 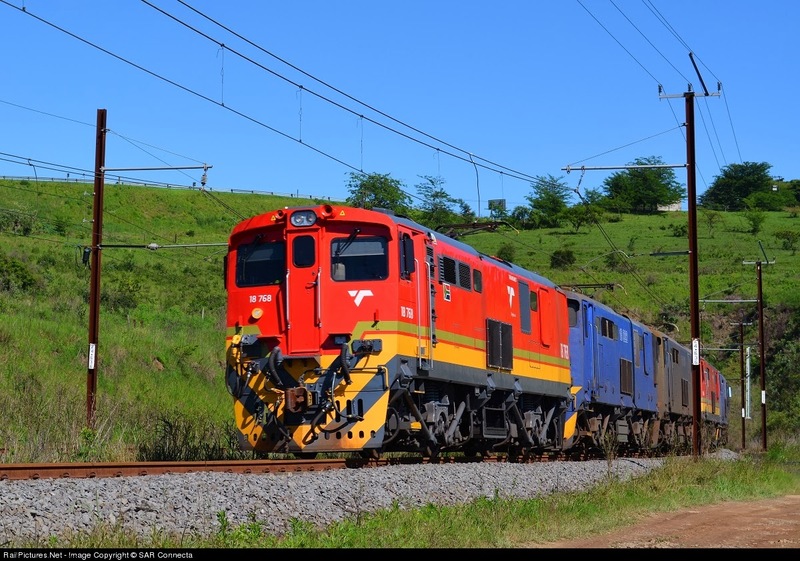 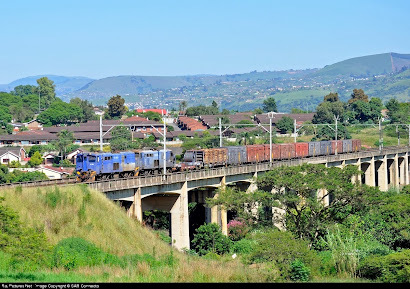 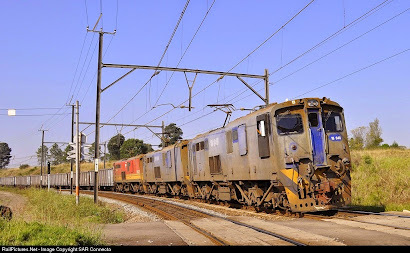 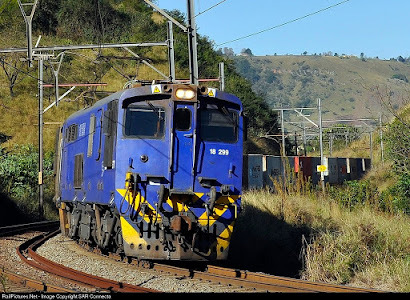 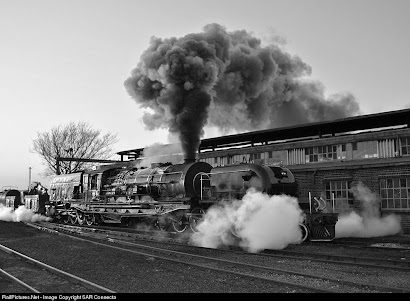 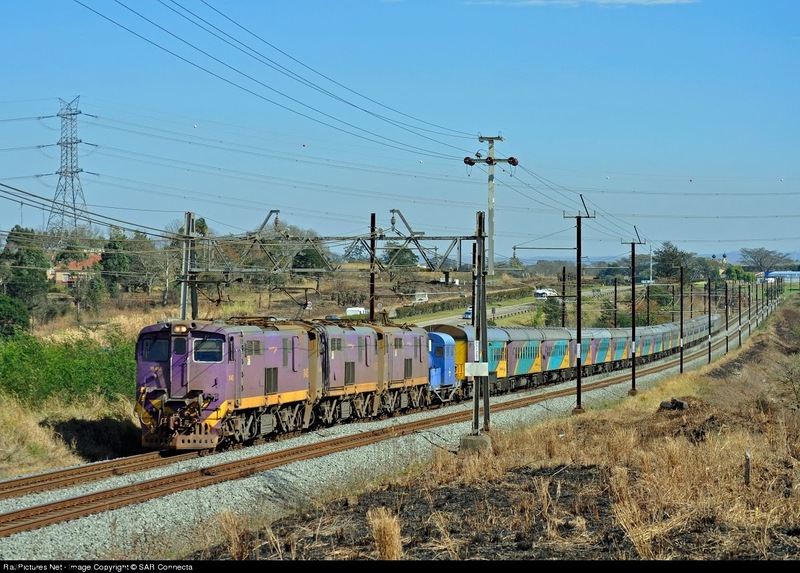 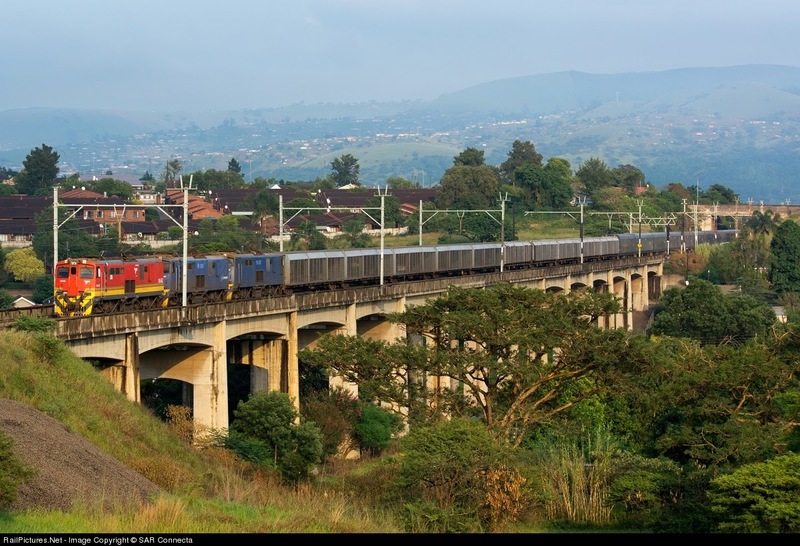 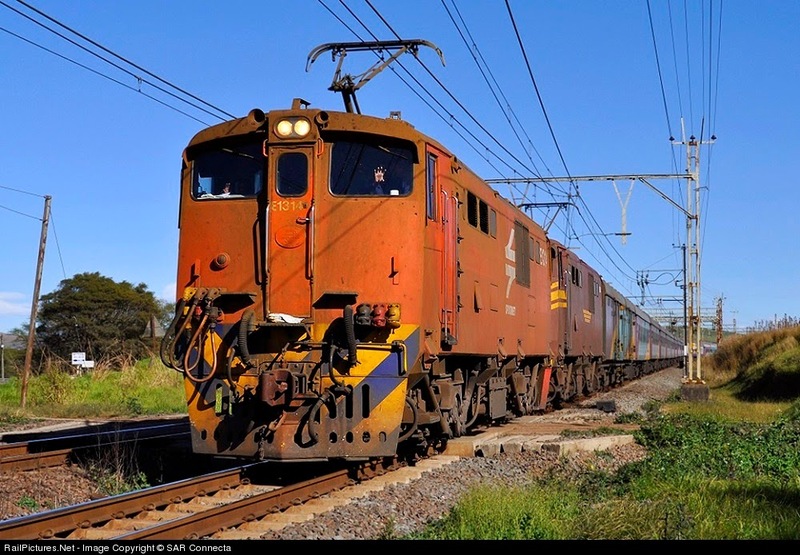 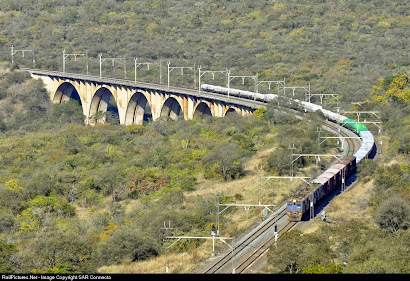 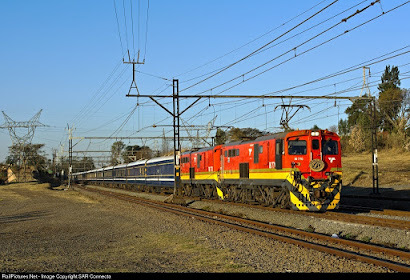 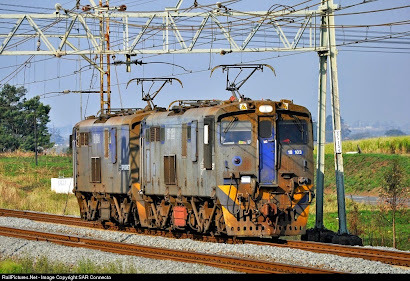 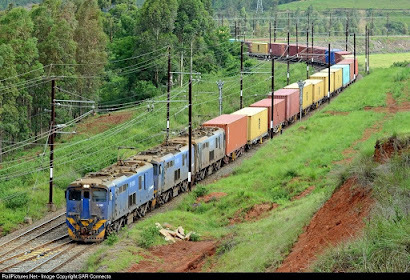 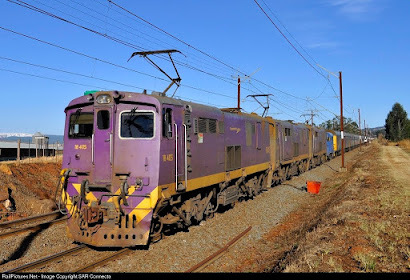 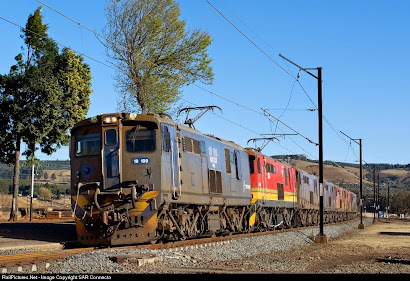 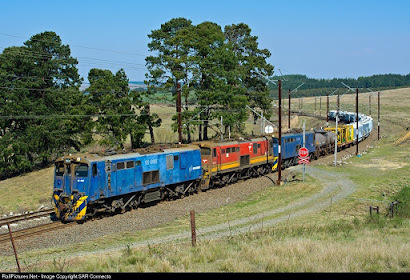 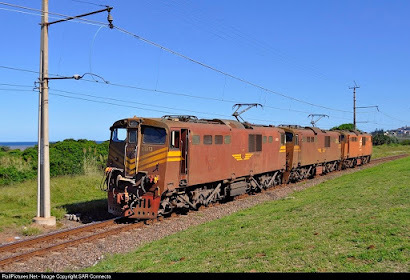 E7131 & Coal Train - Richards Bay (5th May 2013). 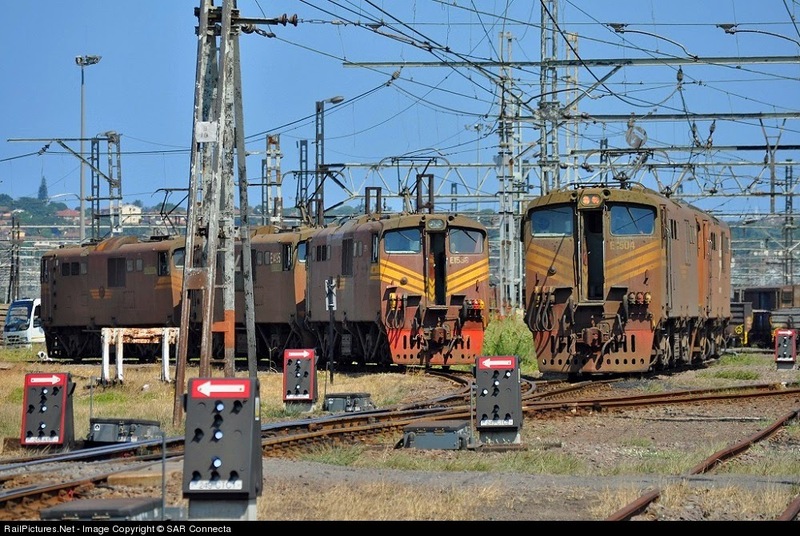 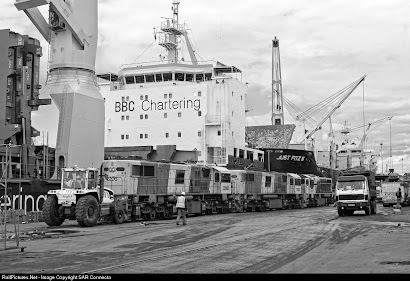 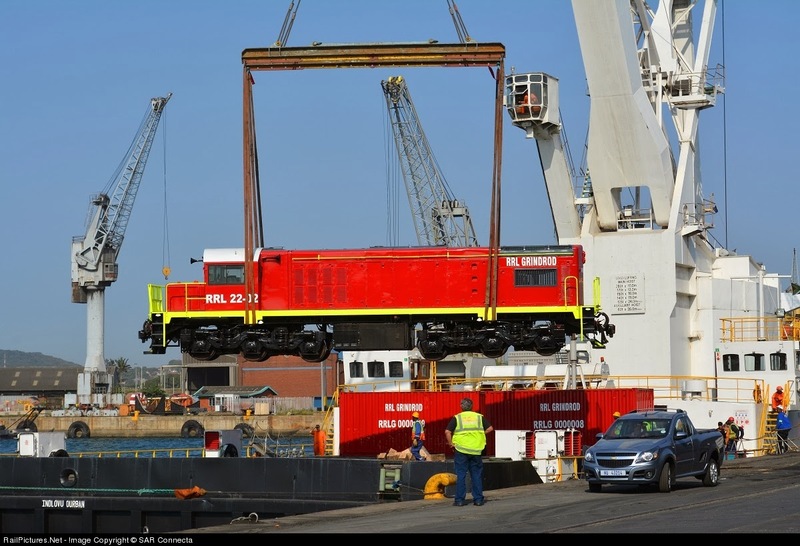 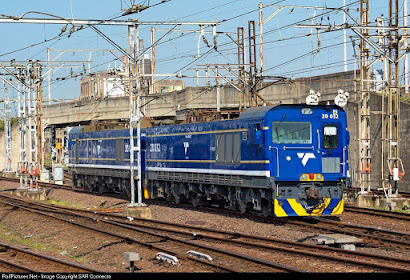 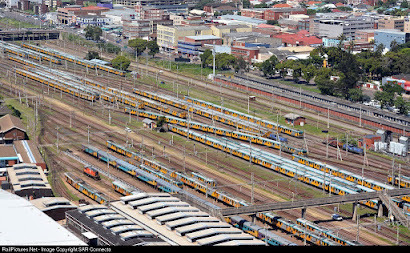 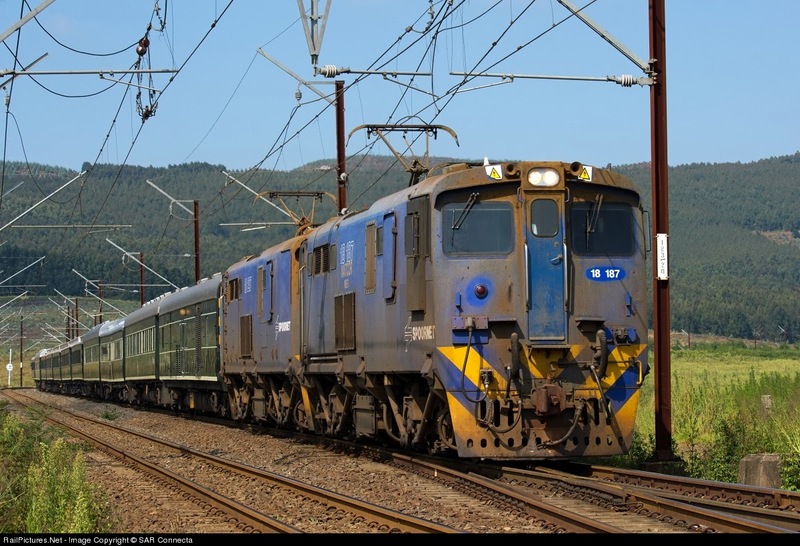 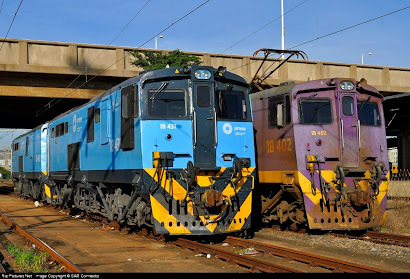 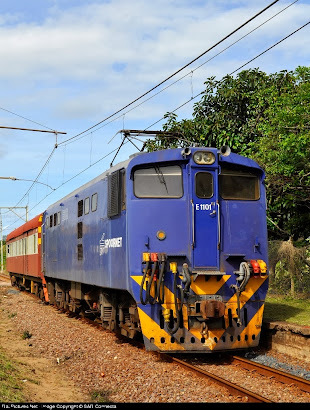 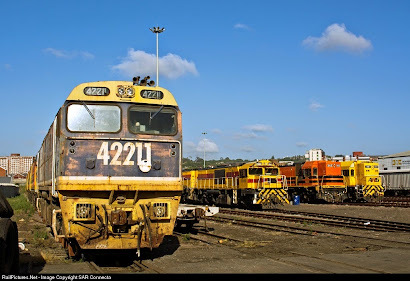 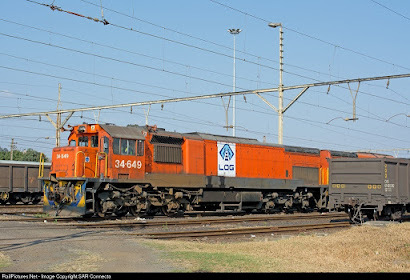 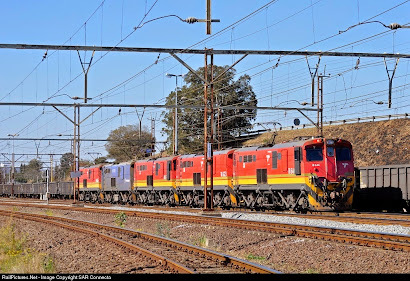 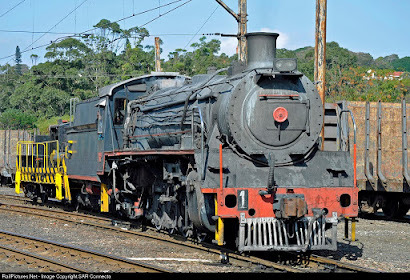 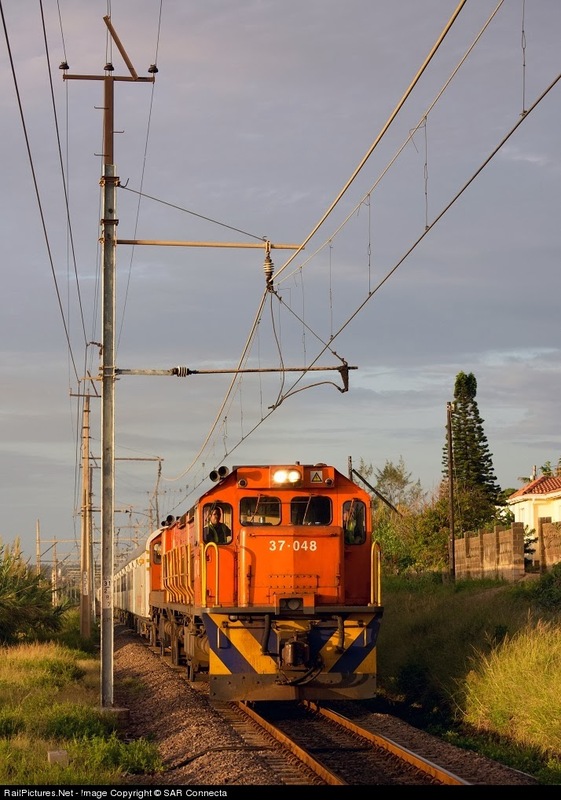 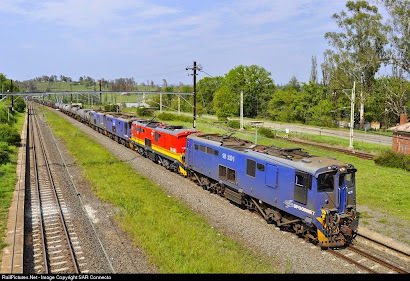 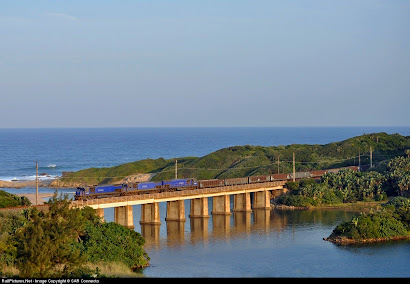 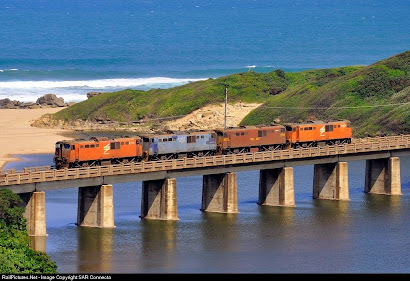 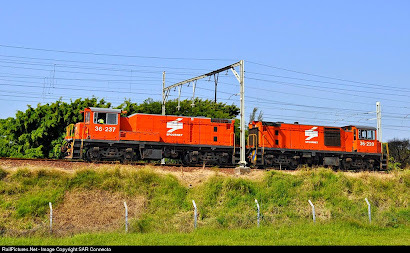 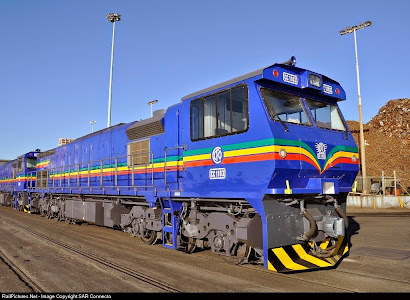 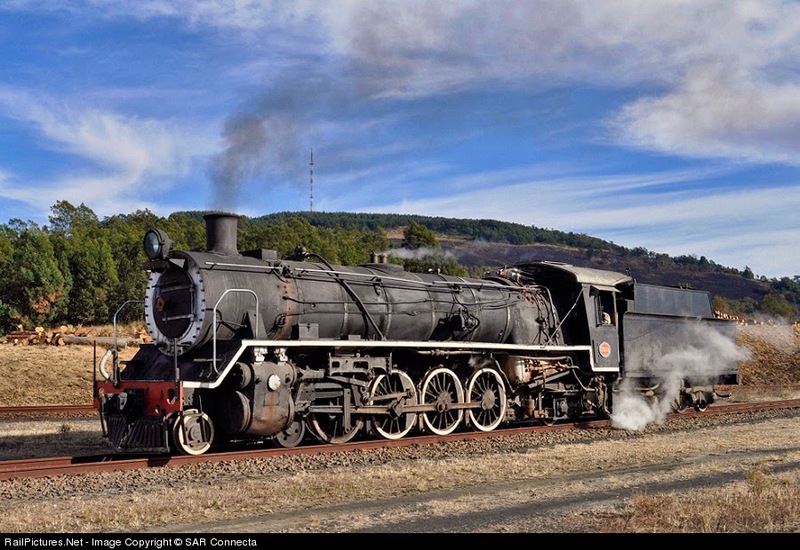 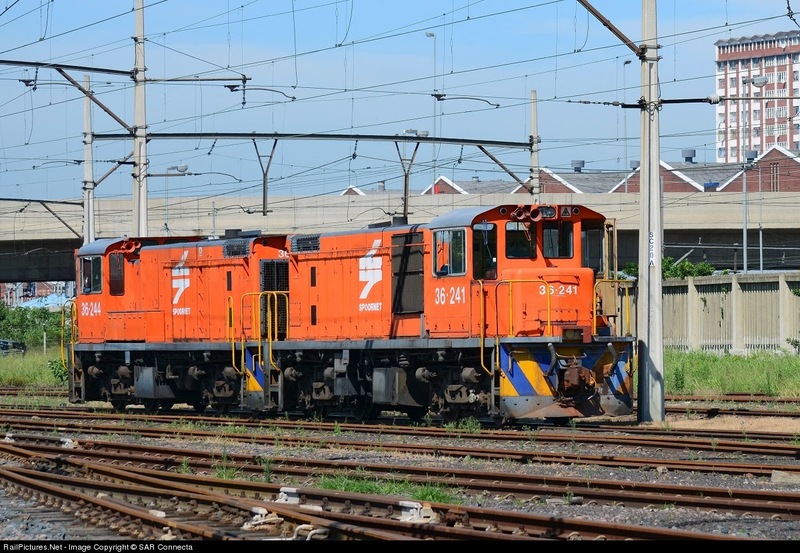 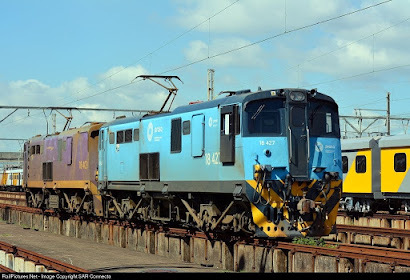 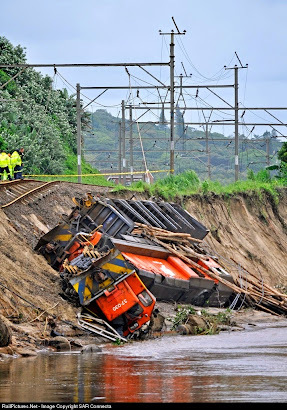 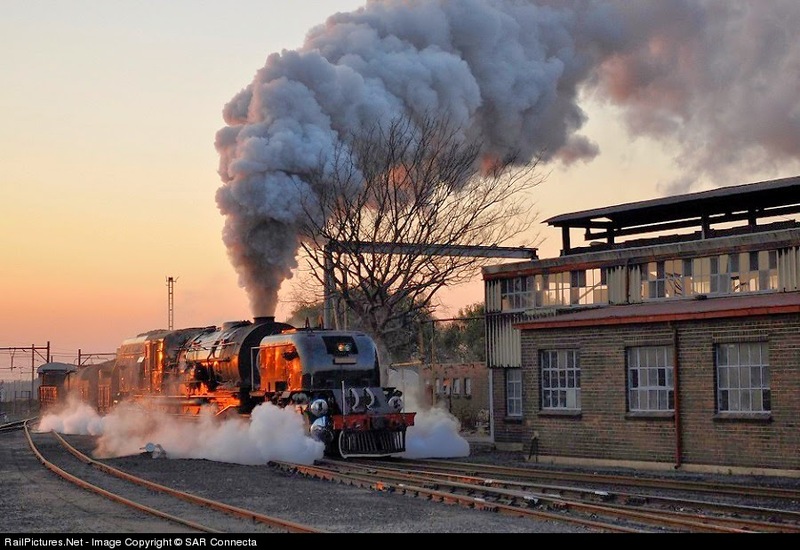 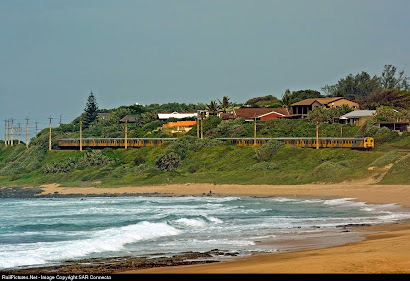 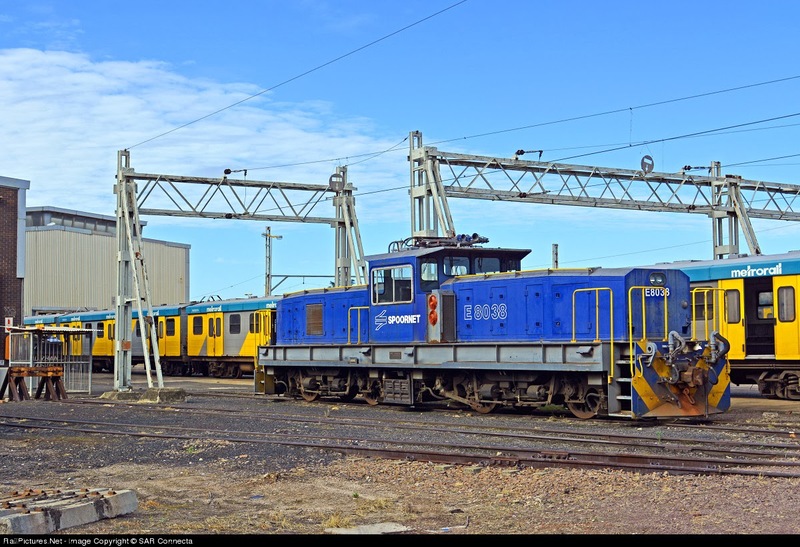 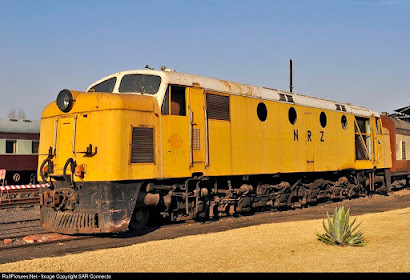 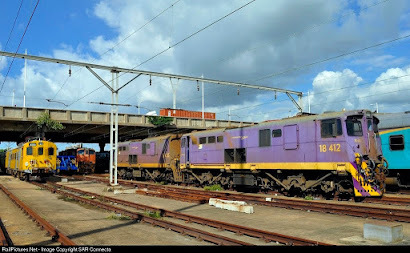 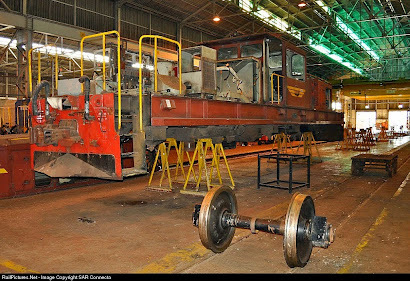 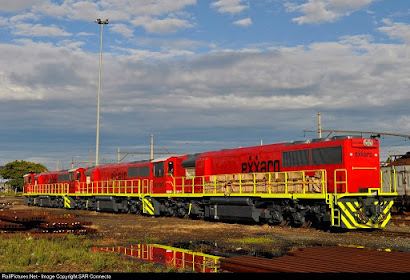 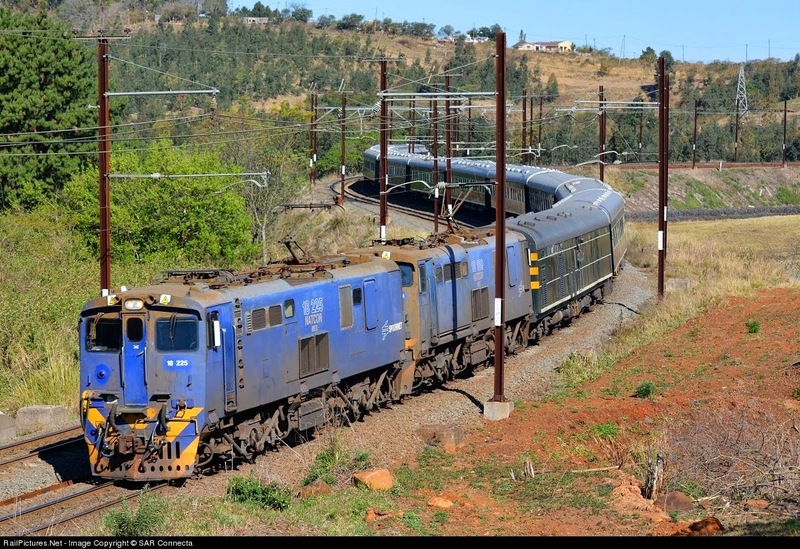 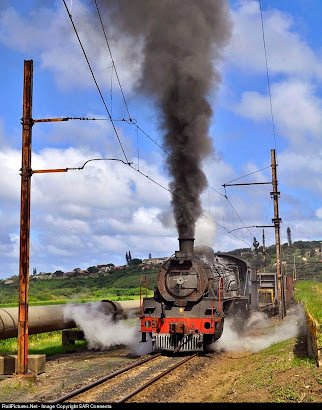 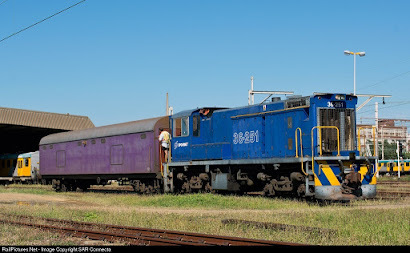 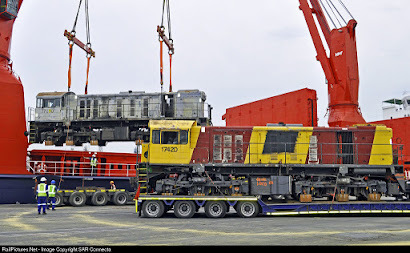 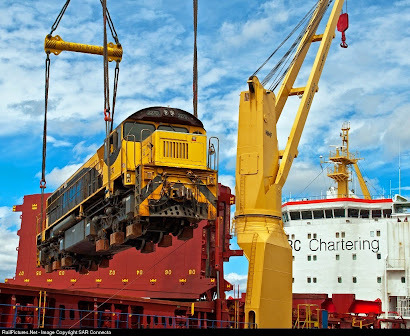 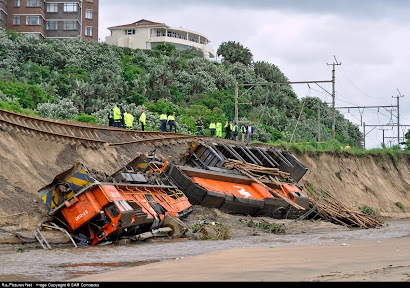 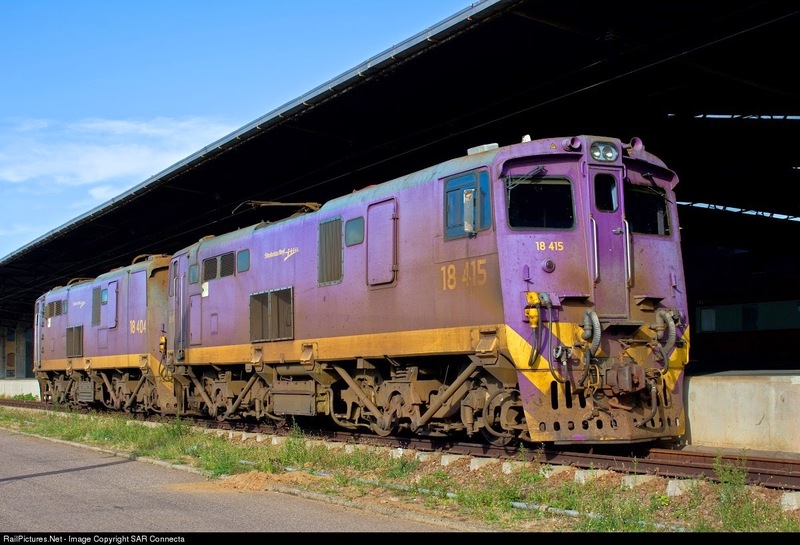 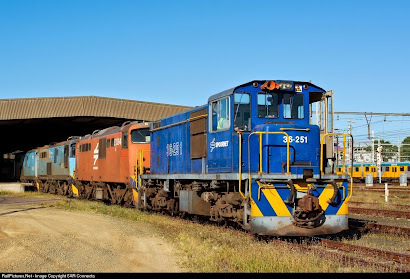 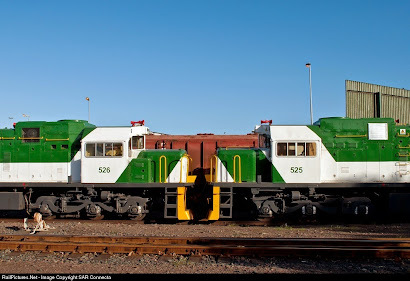 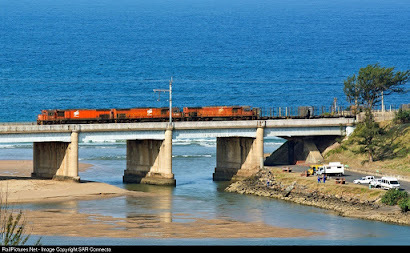 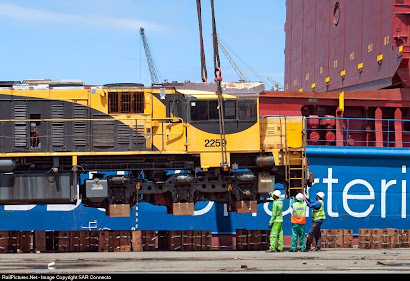 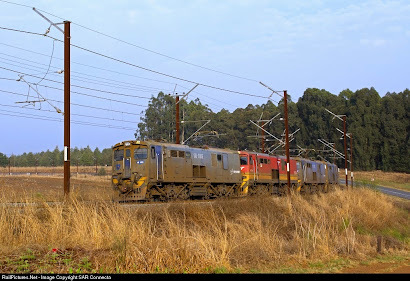 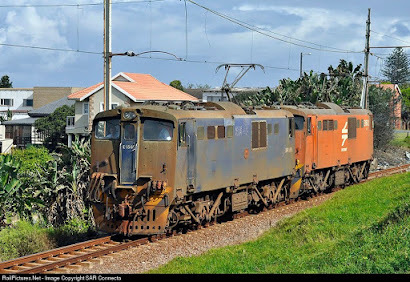 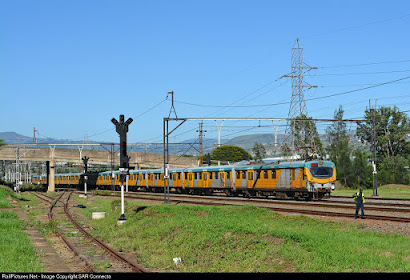 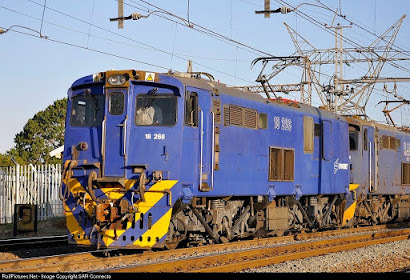 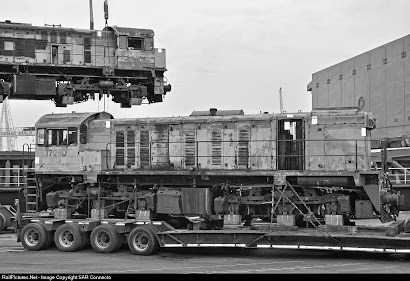 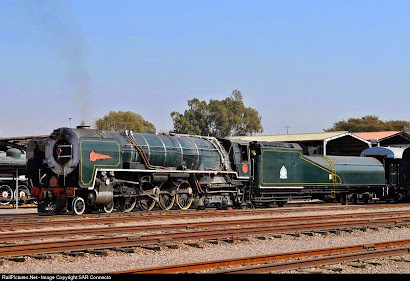 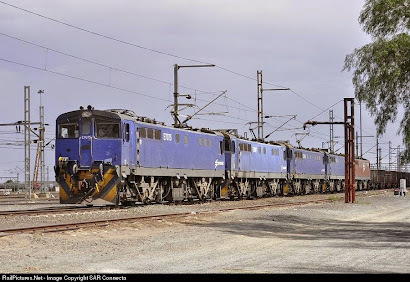 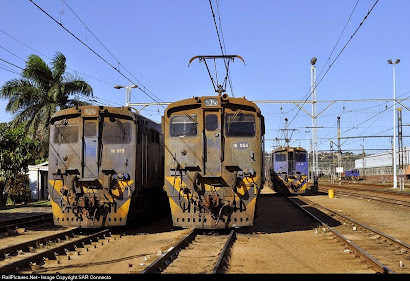 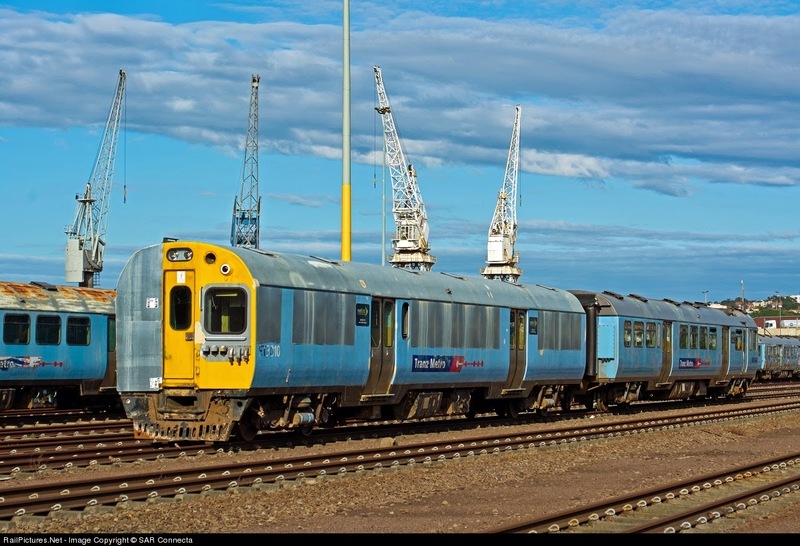 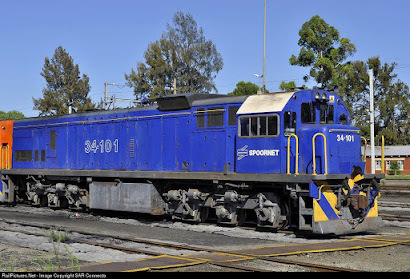 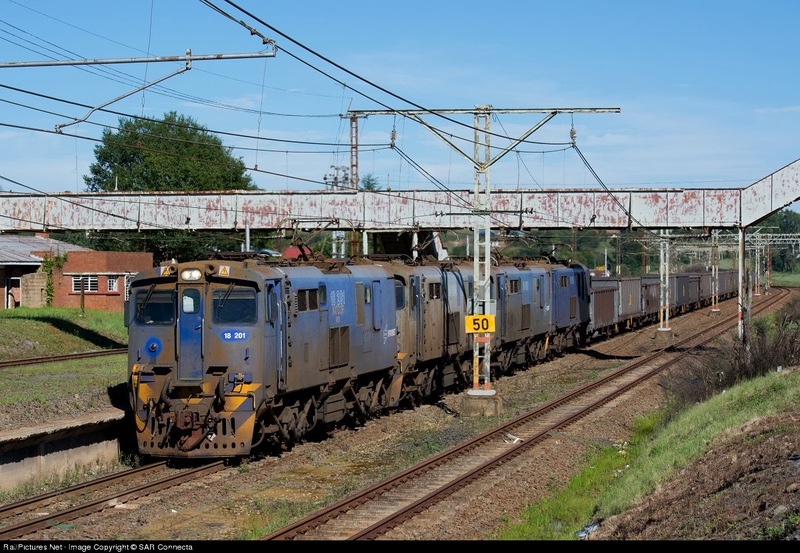 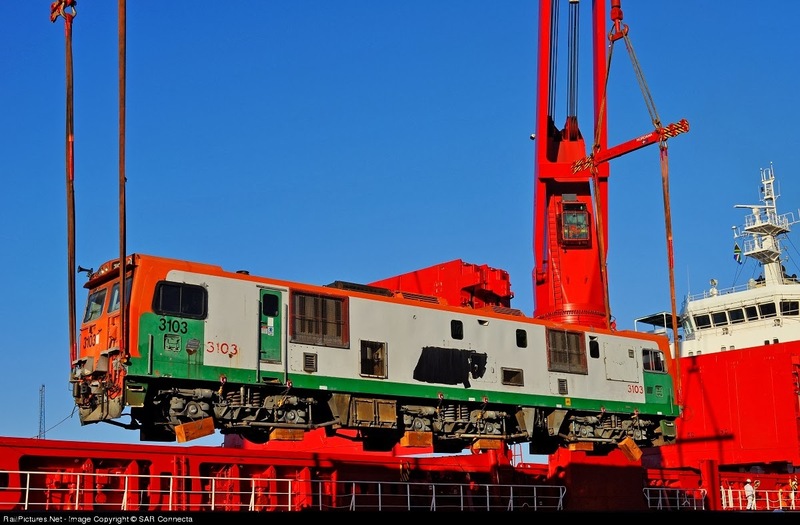 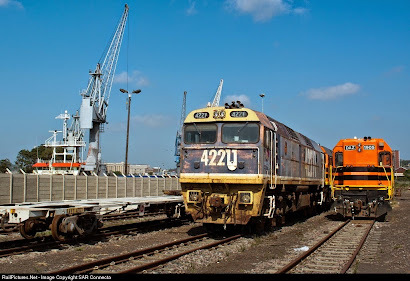 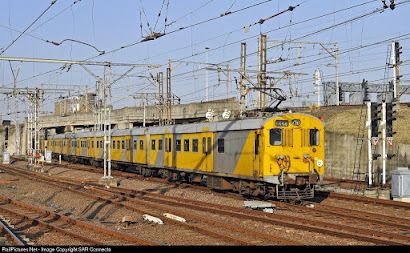 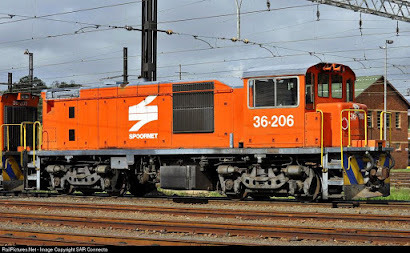 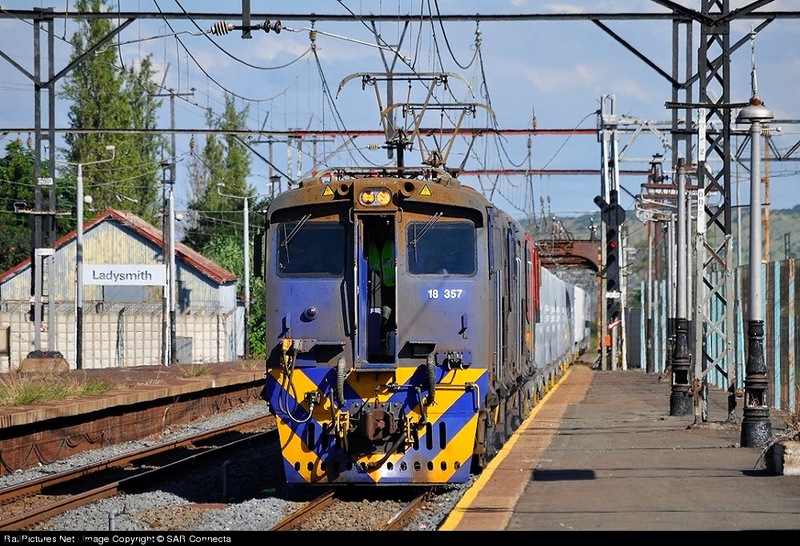 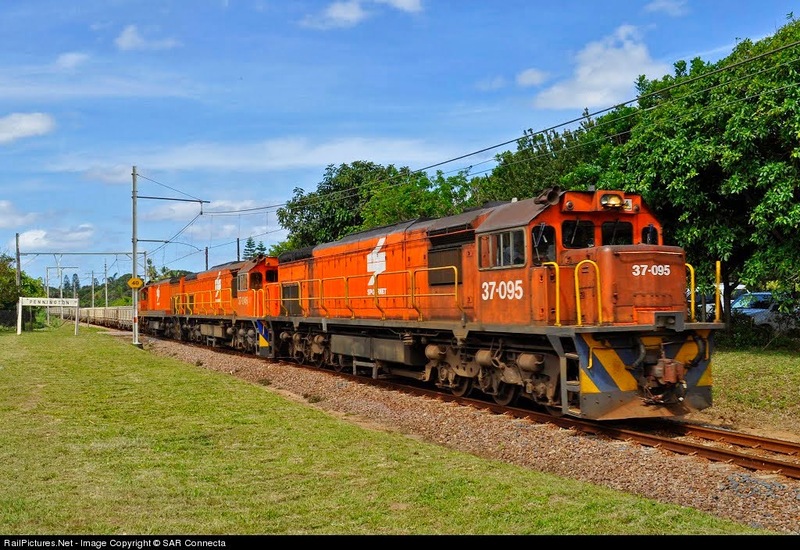 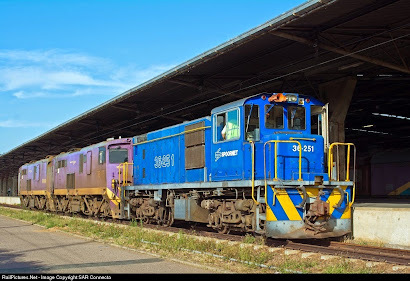 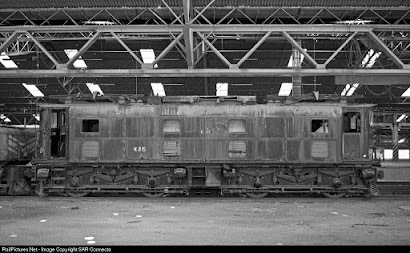 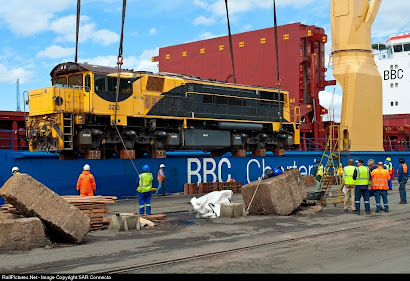 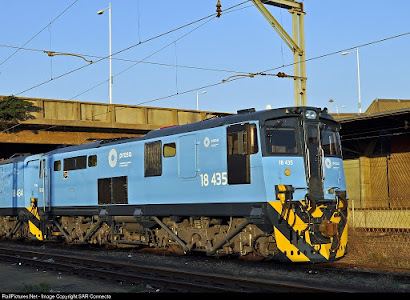 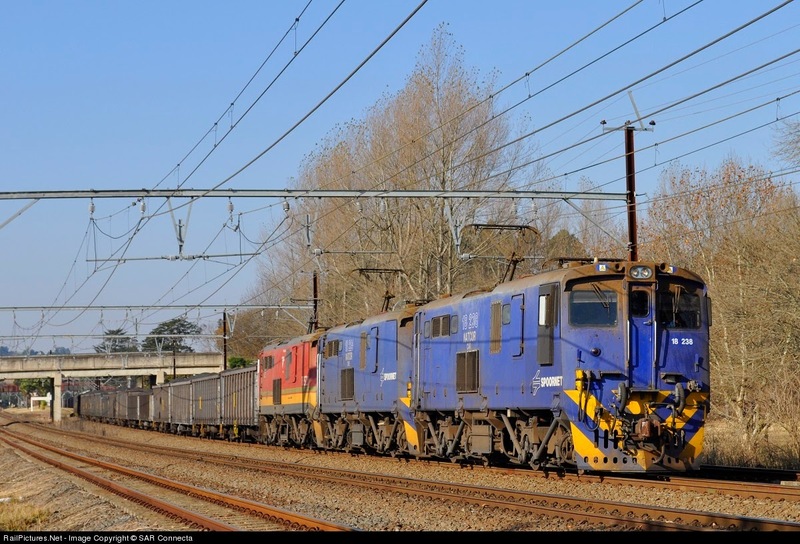 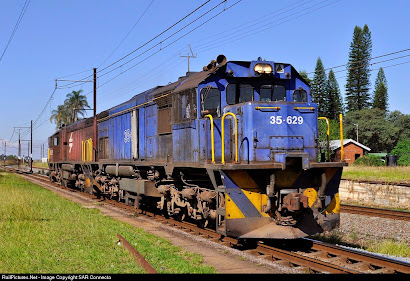 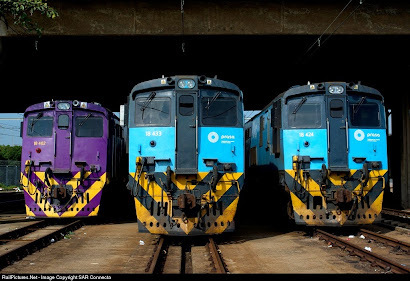 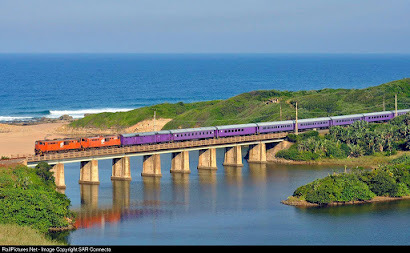 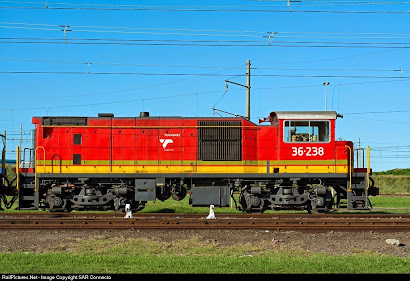 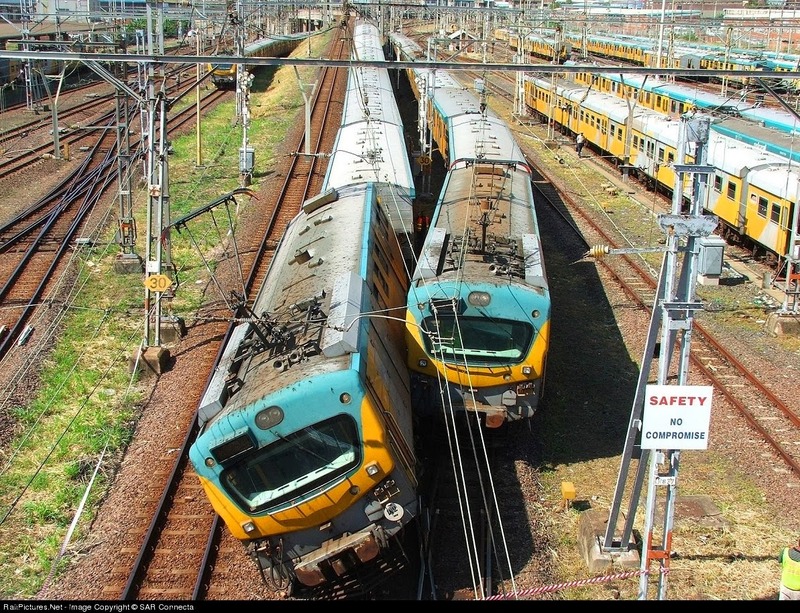 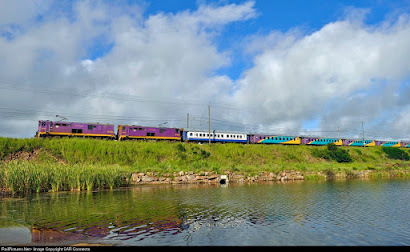 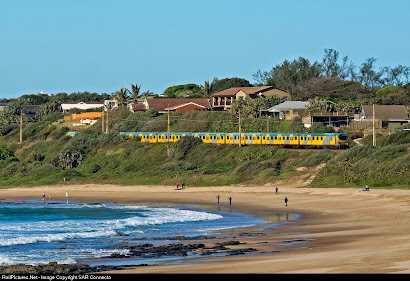 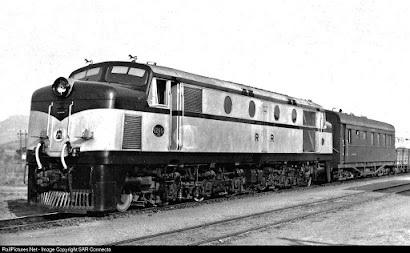 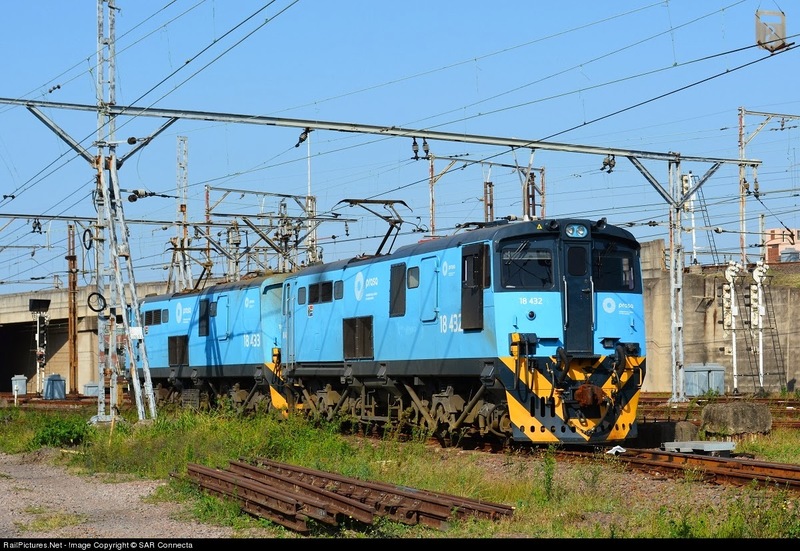 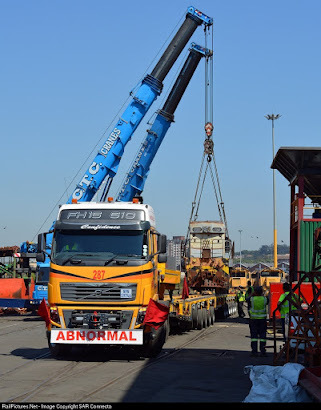 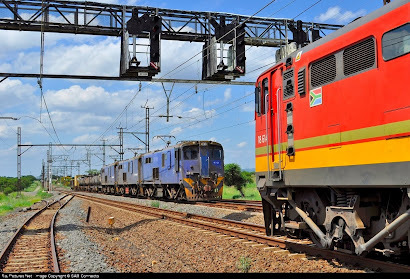 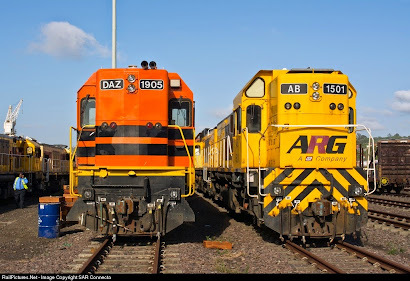 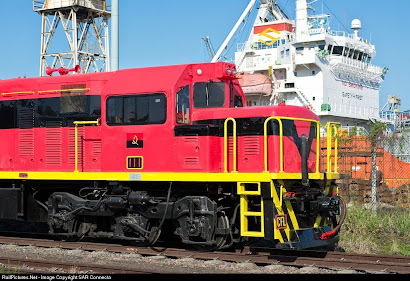 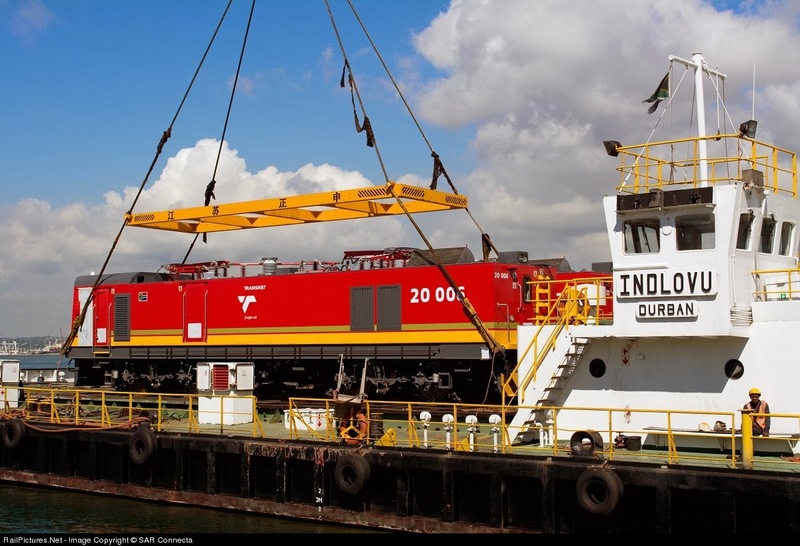 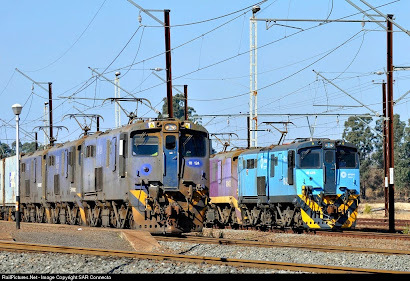 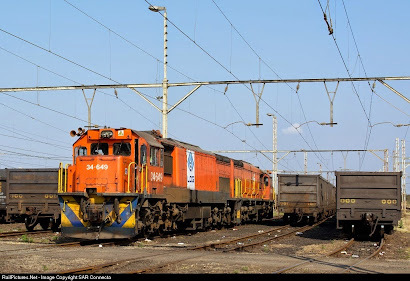 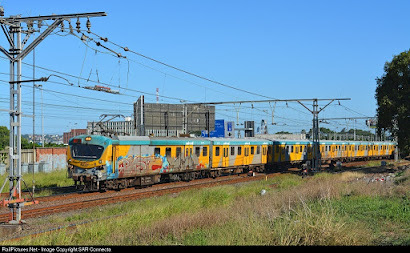 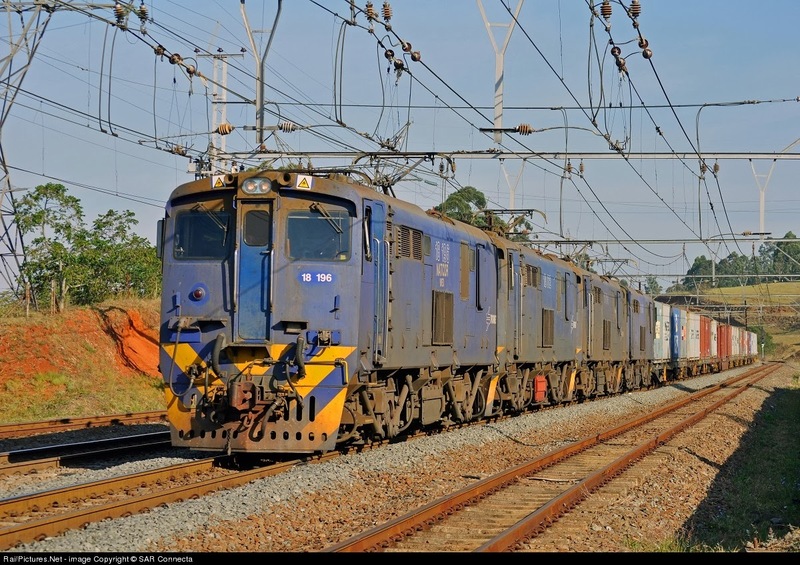 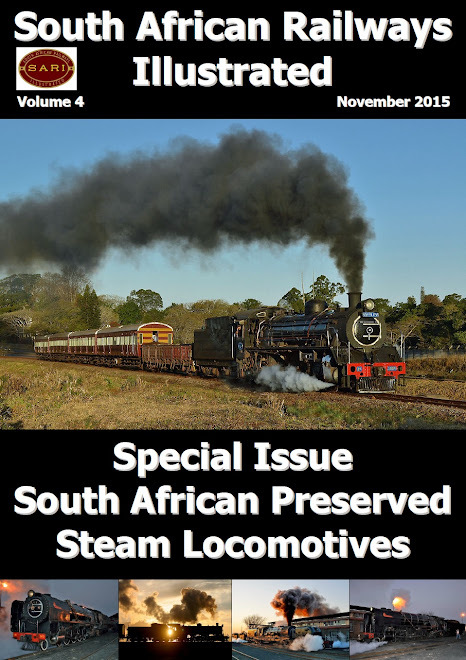 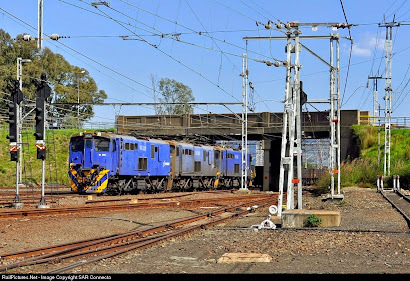 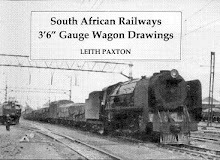 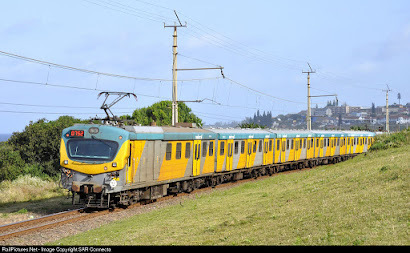 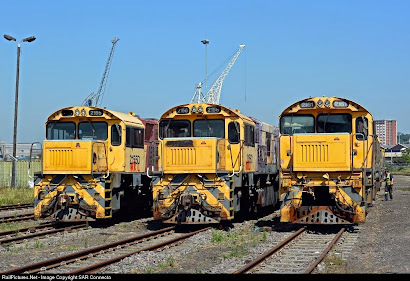 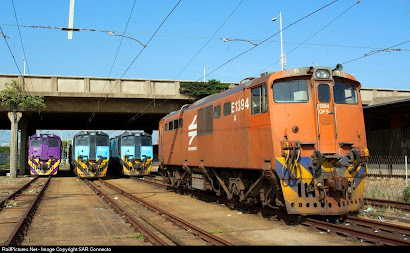 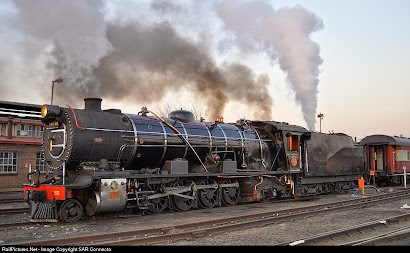 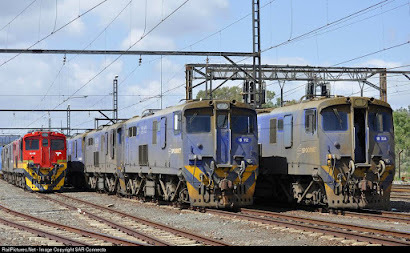 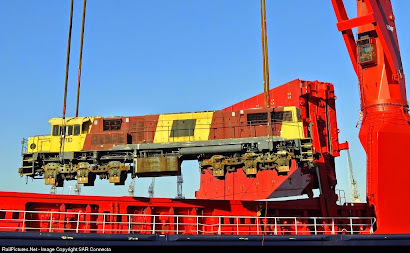 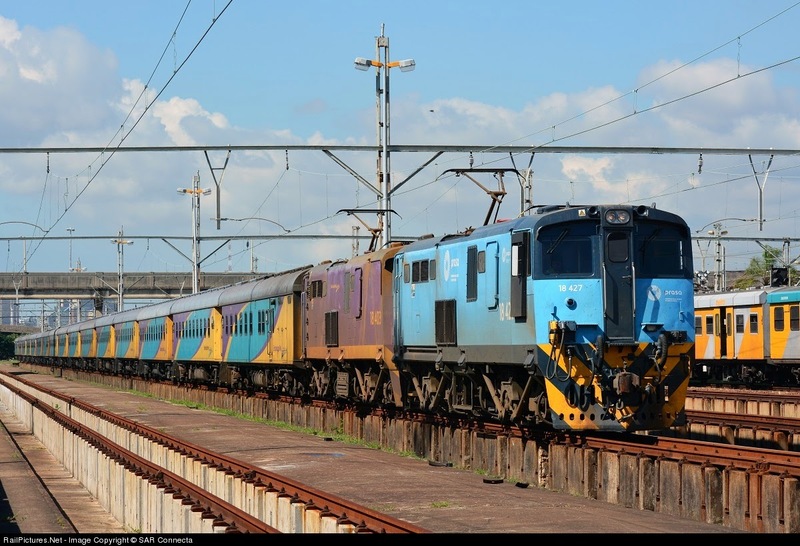 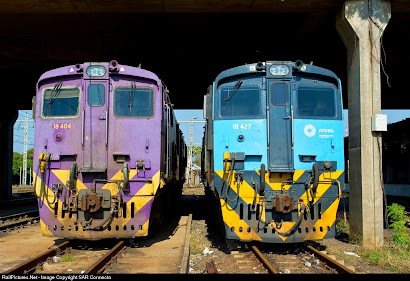 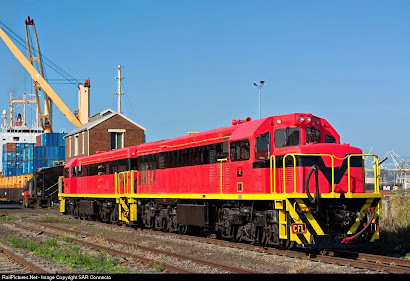 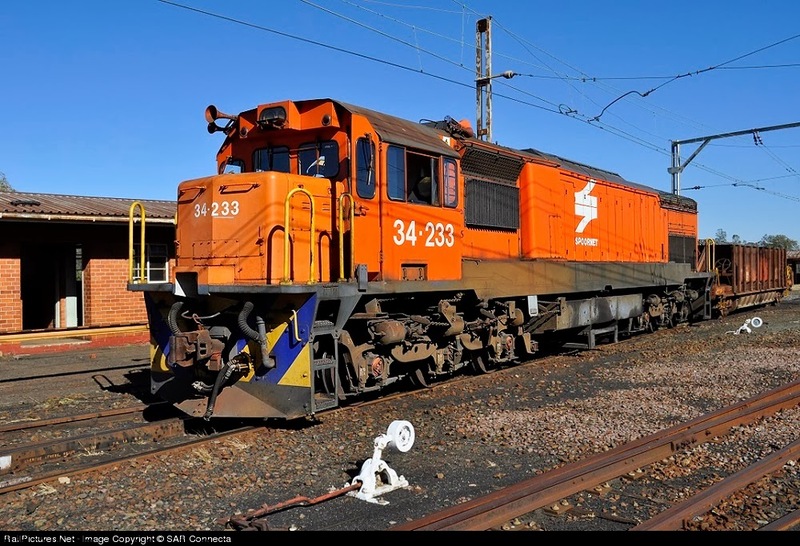 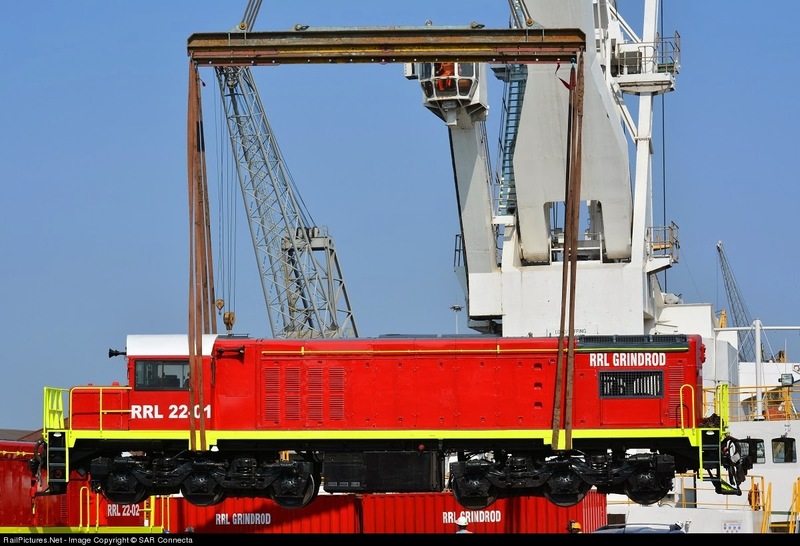 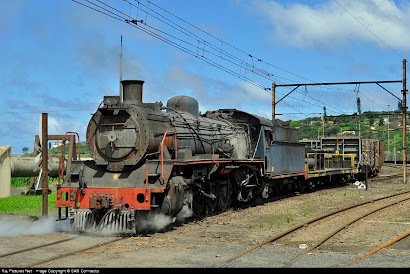 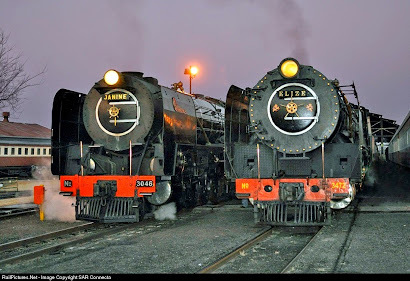 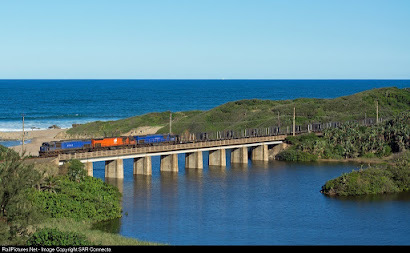 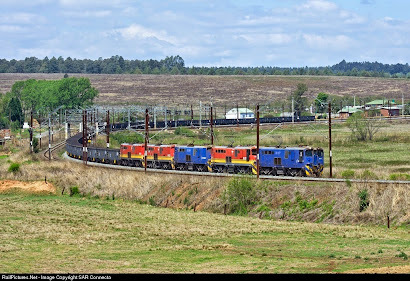 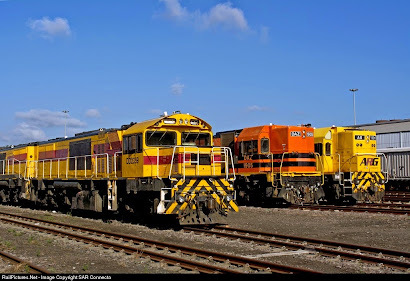 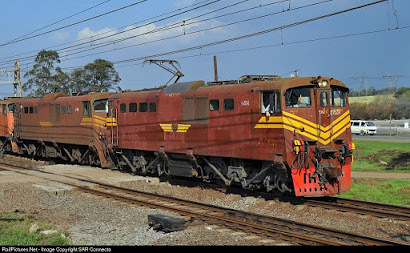 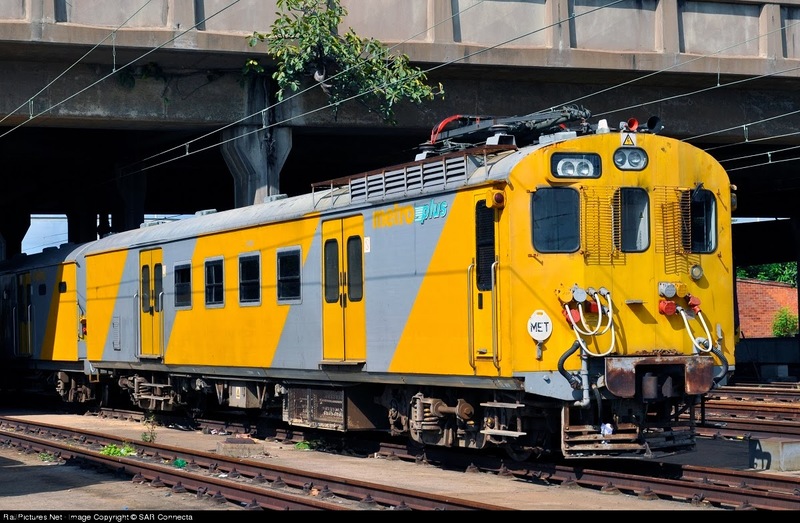 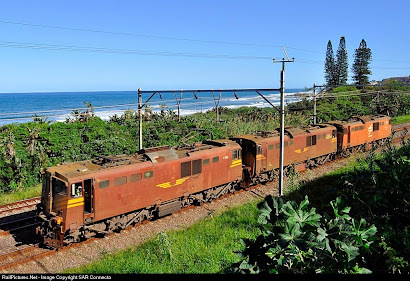 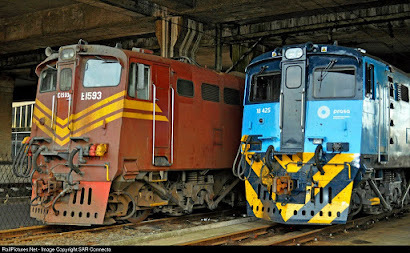 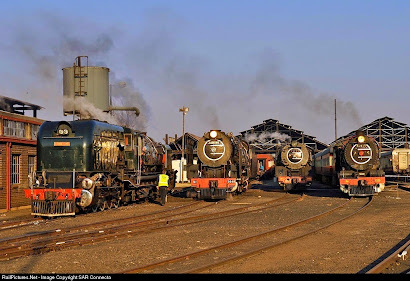 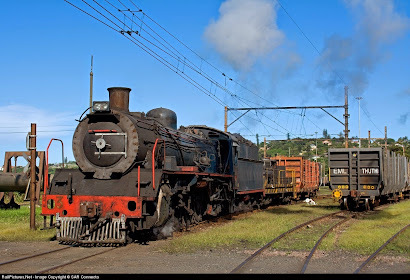 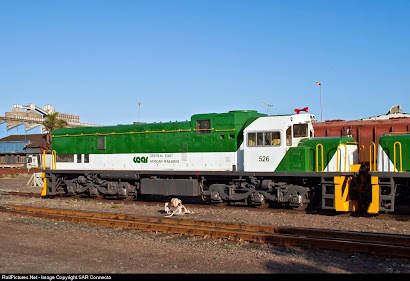 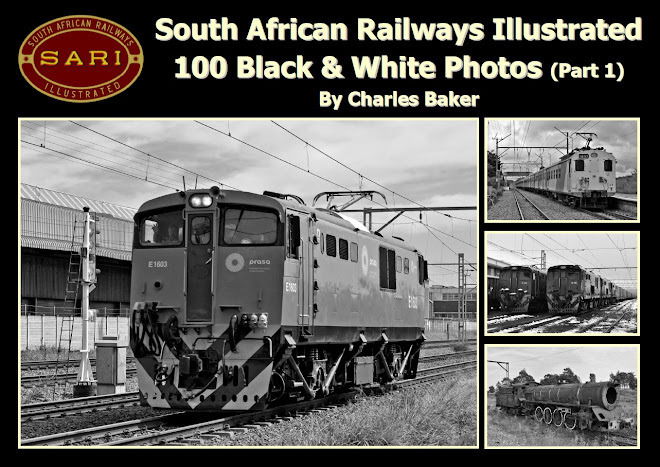 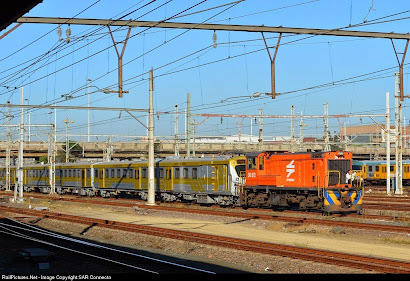 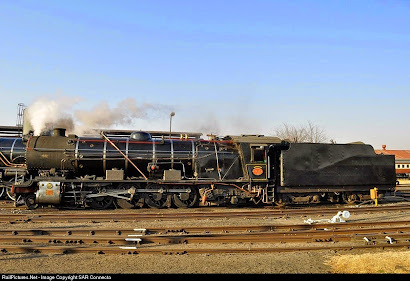 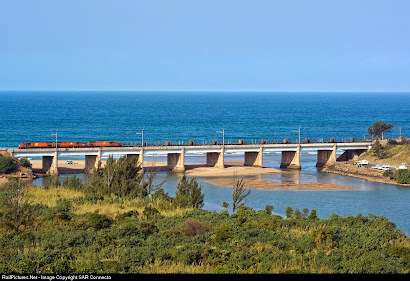 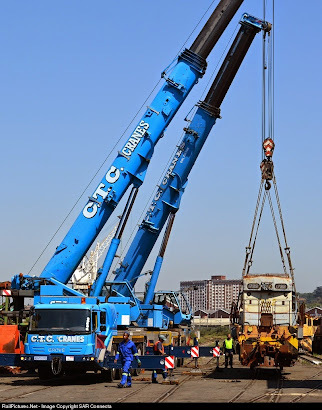 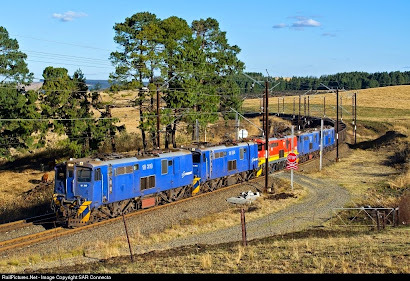 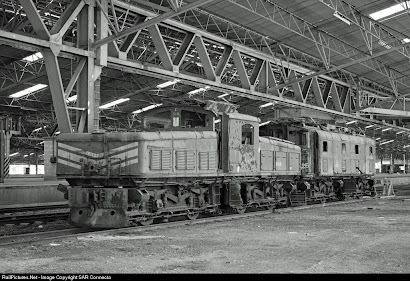 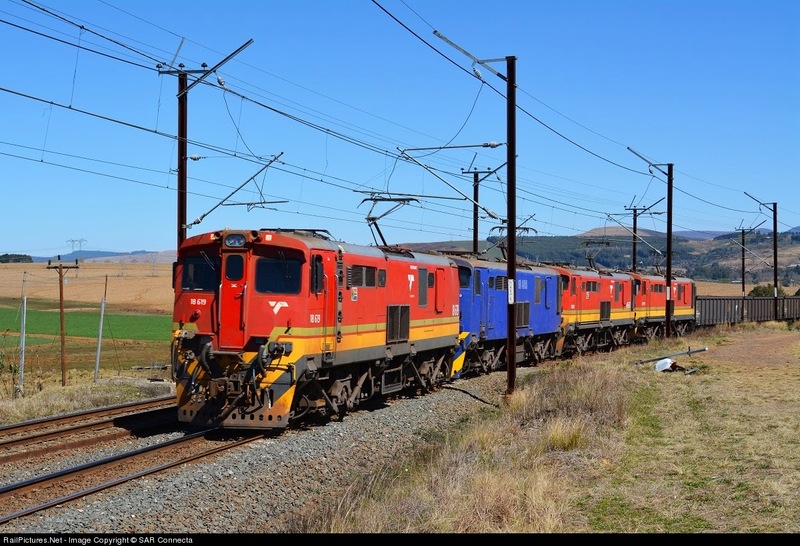 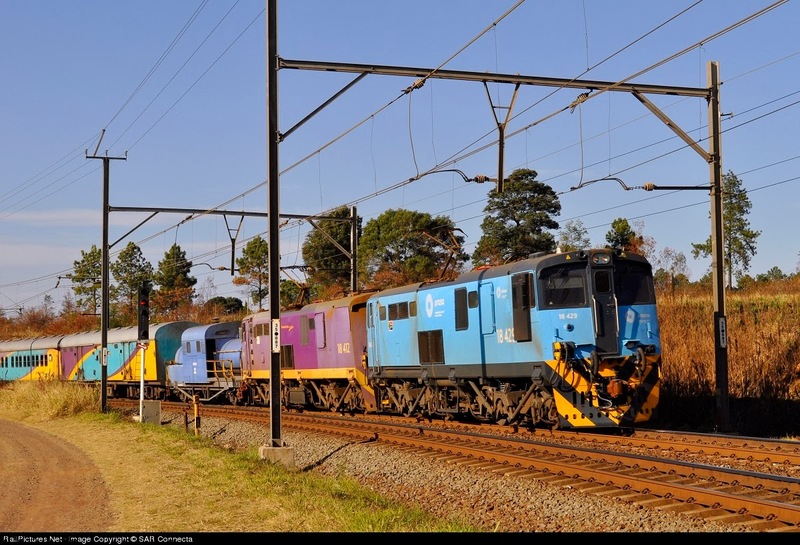 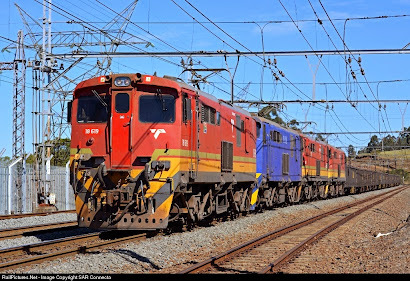 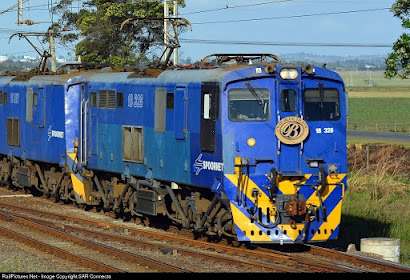 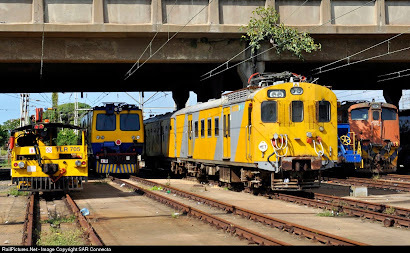 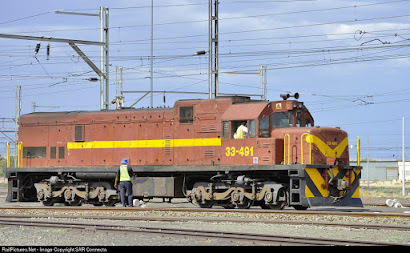 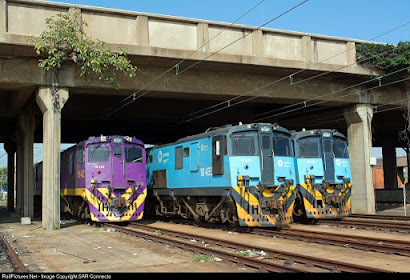 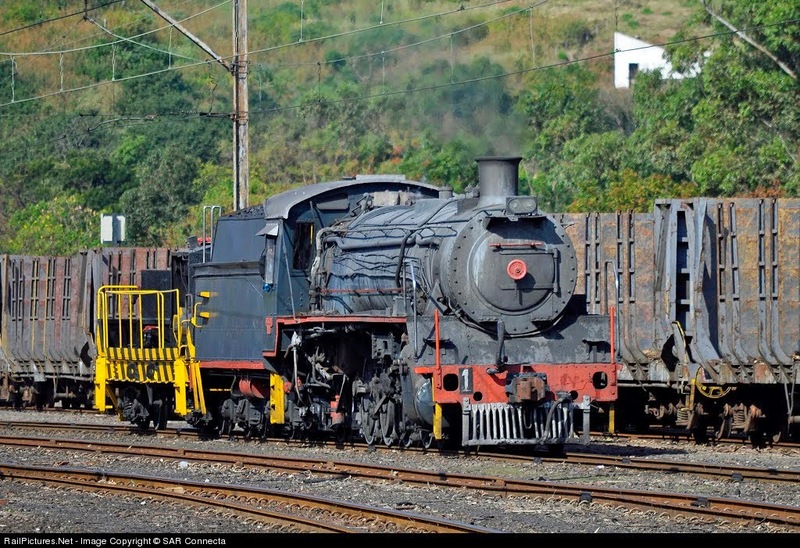 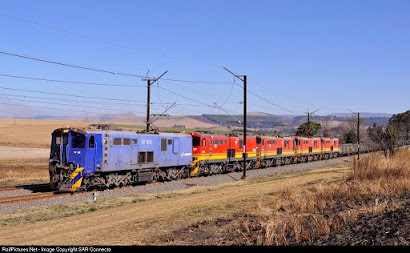 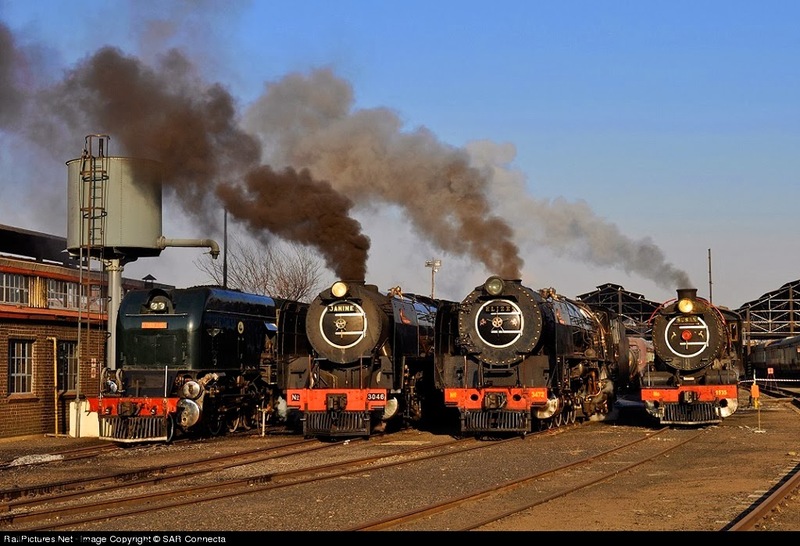 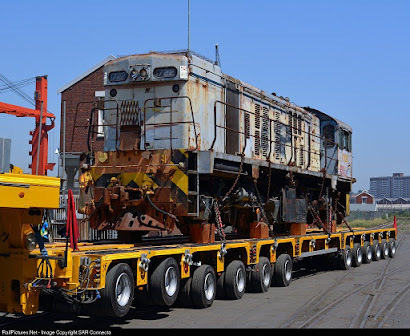 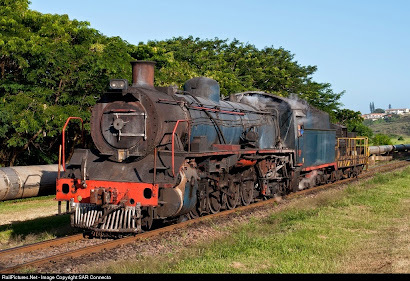 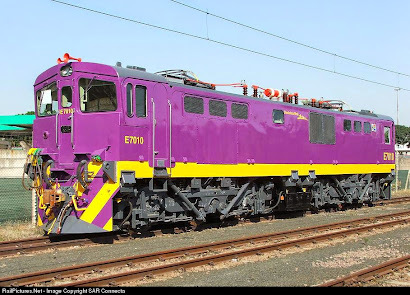 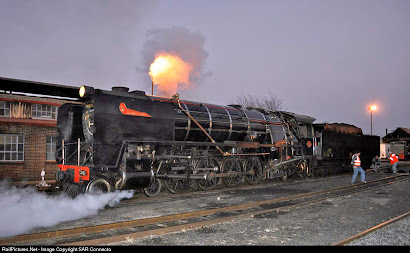 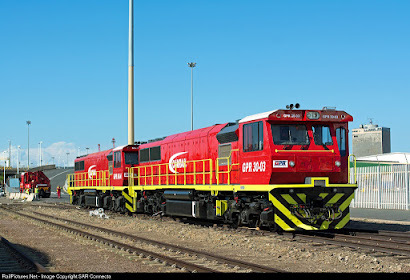 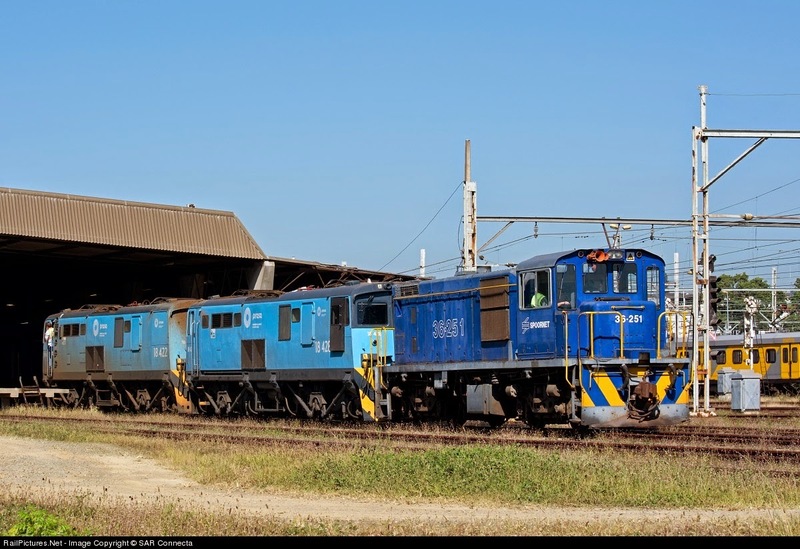 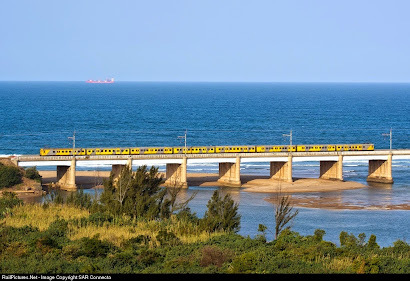 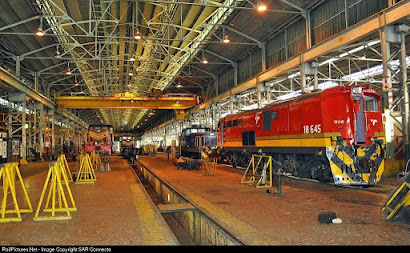 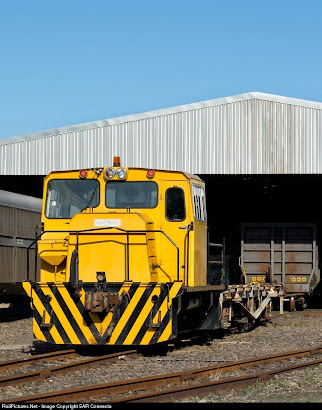 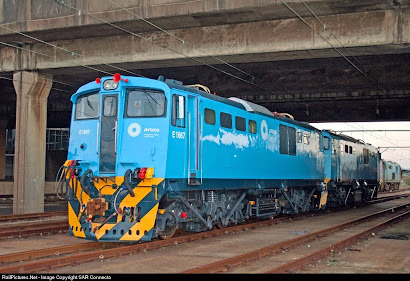 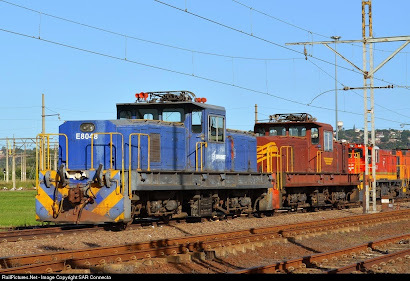 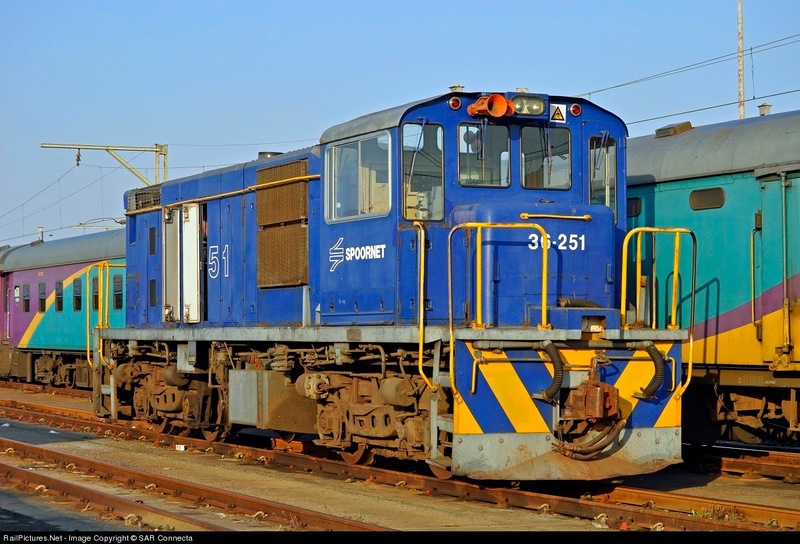 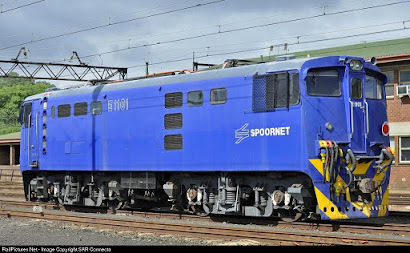 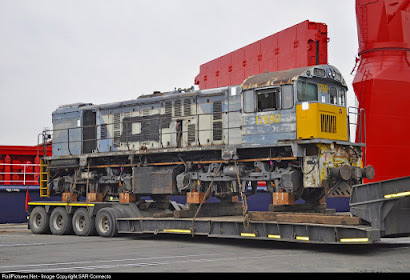 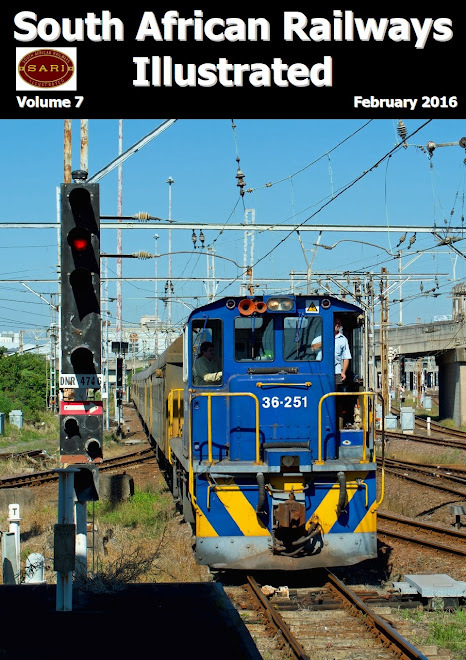 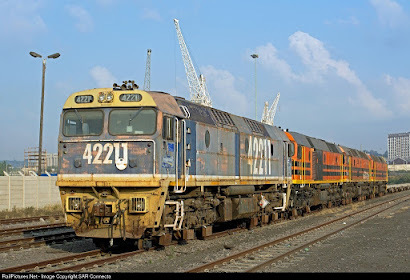 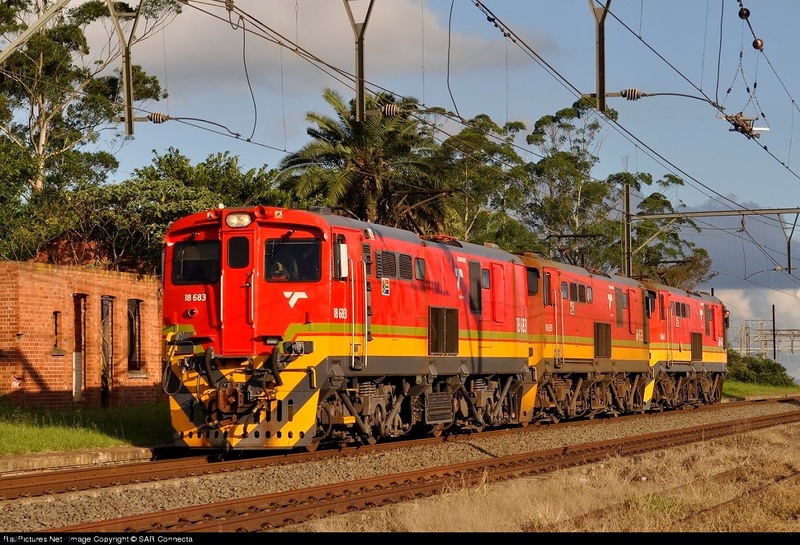 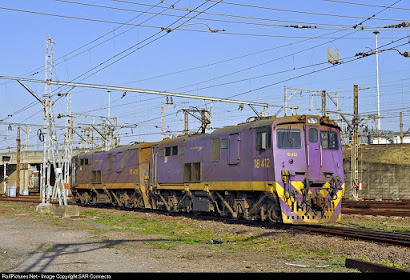 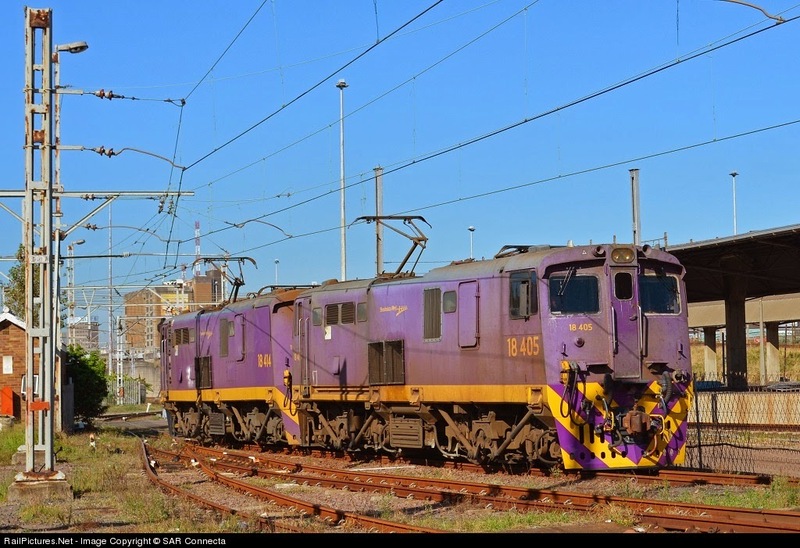 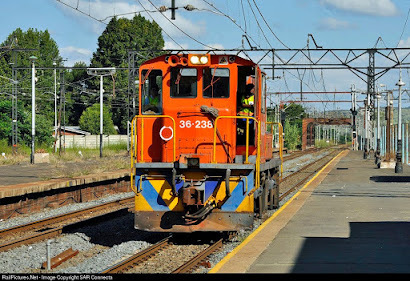 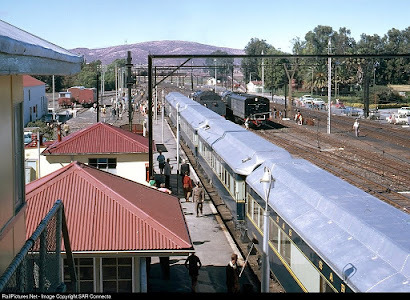 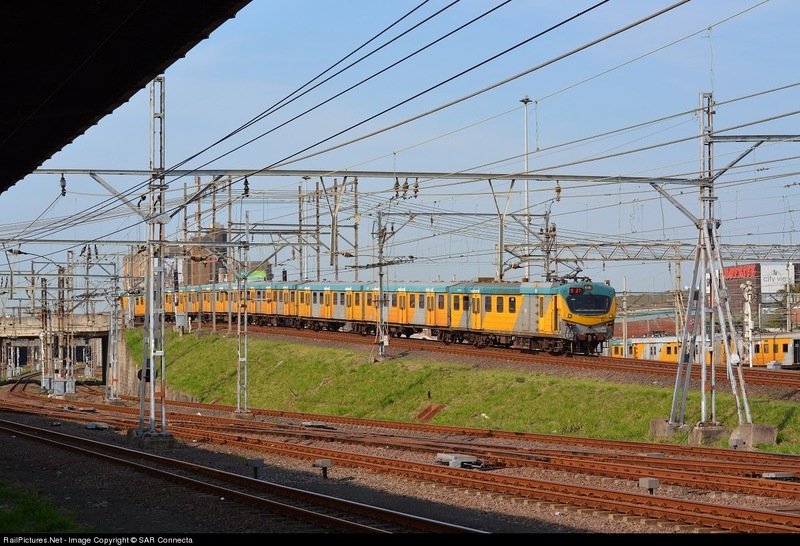 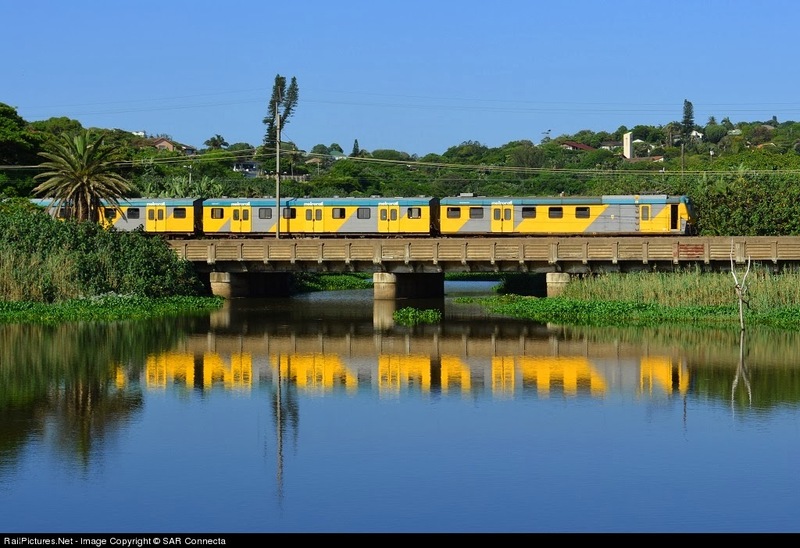 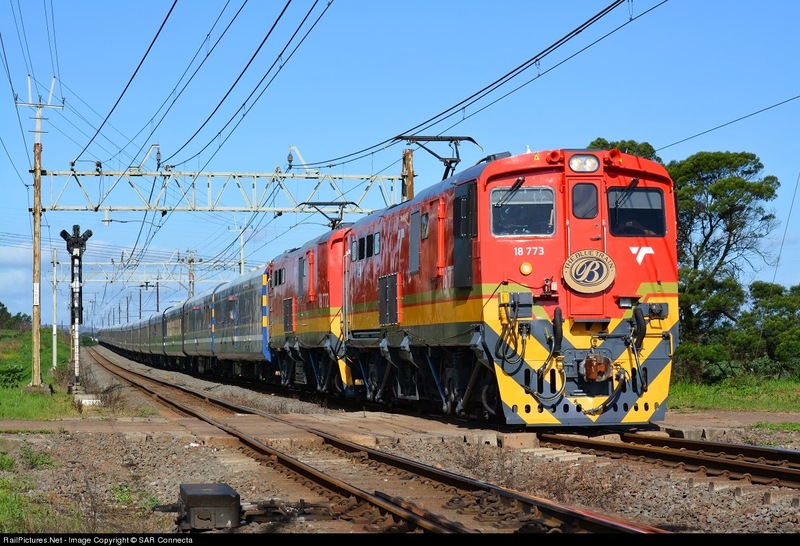 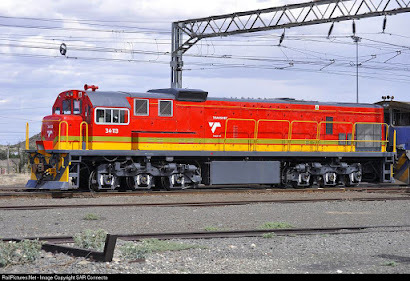 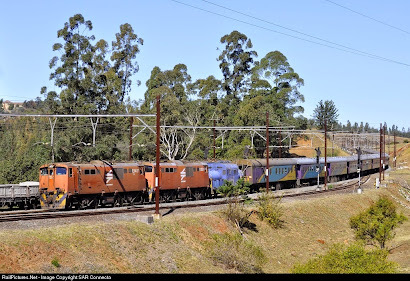 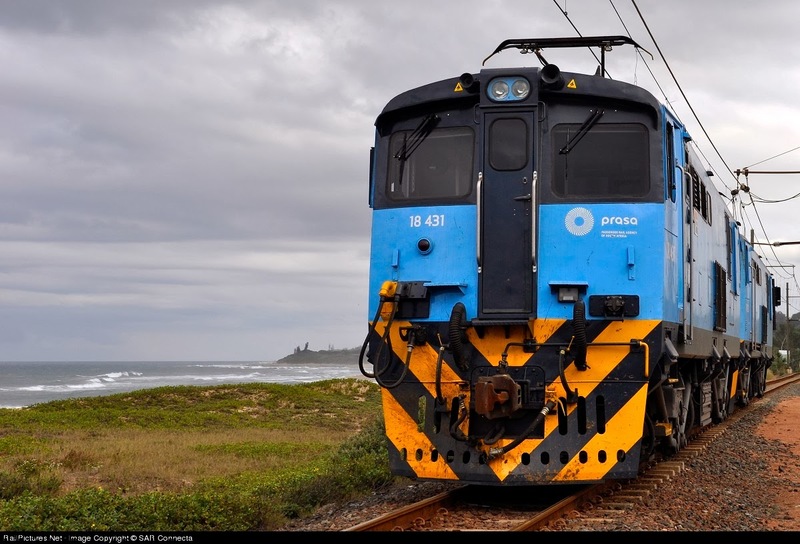 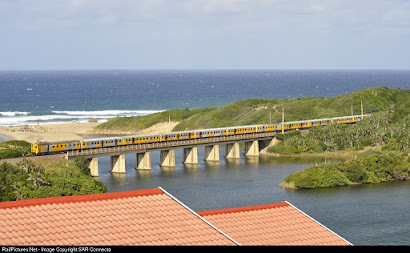 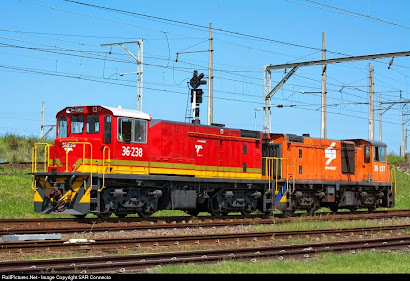 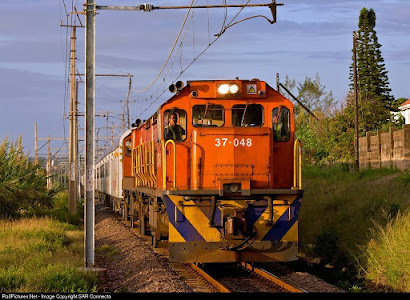 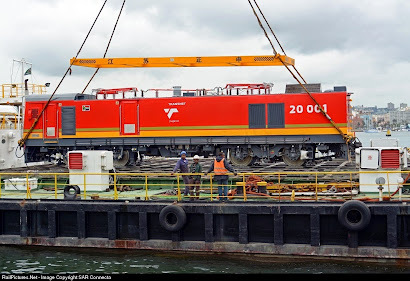 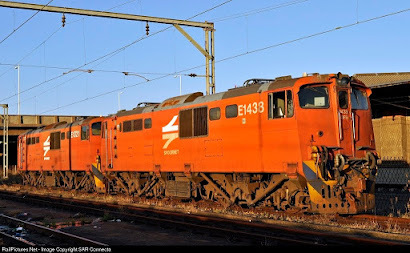 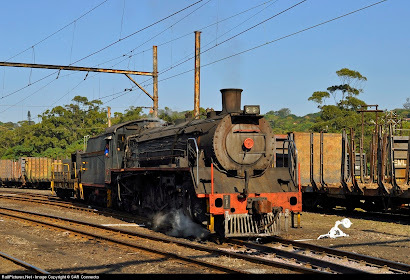 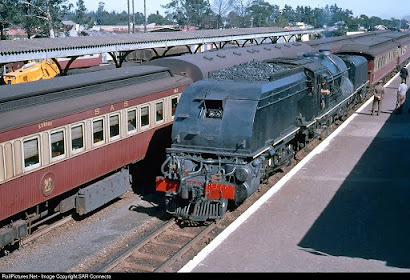 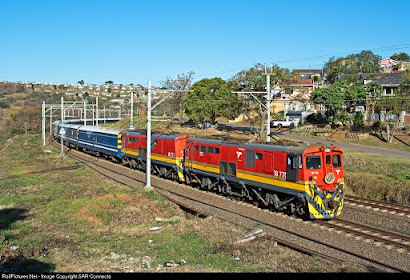 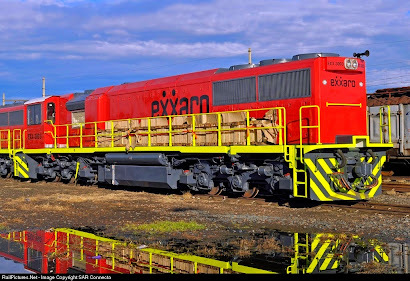 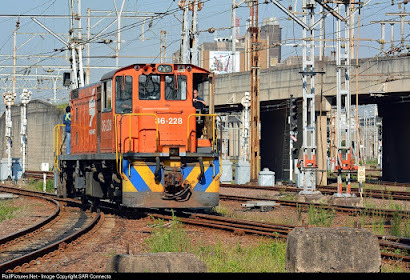 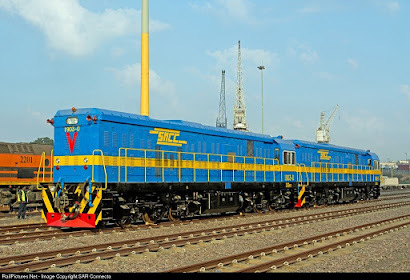 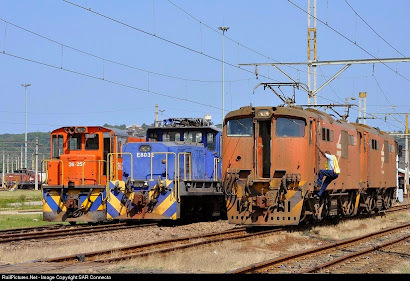 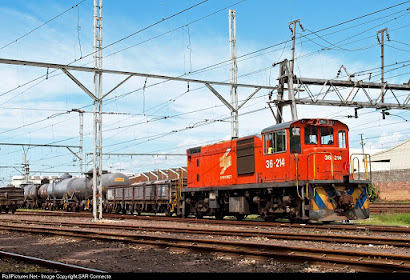 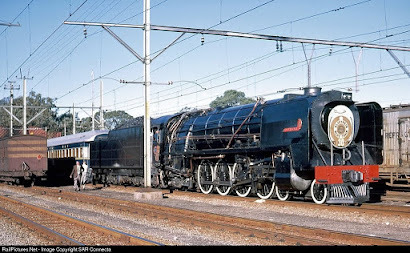 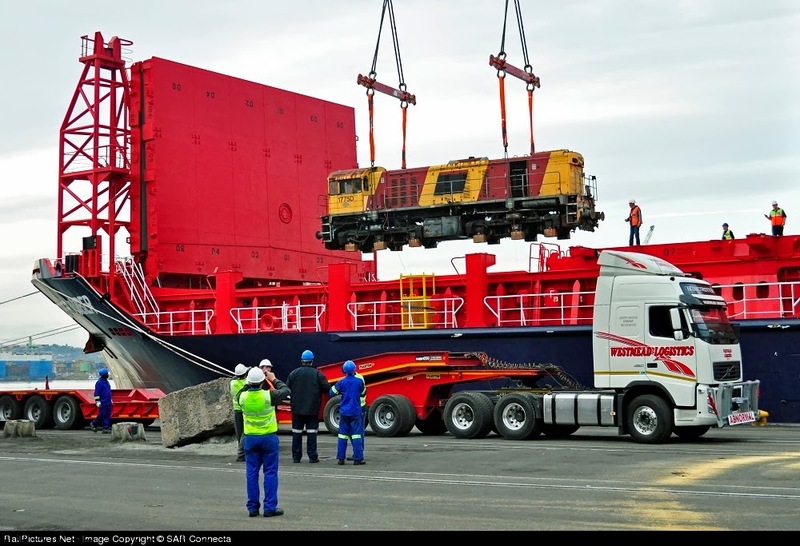 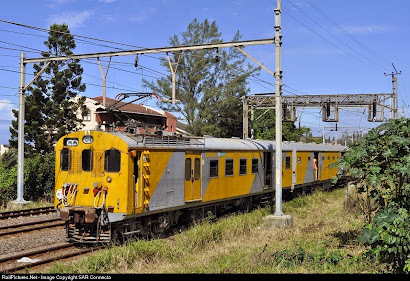 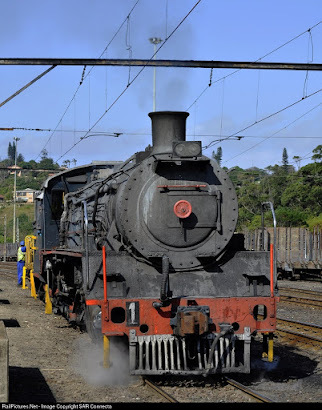 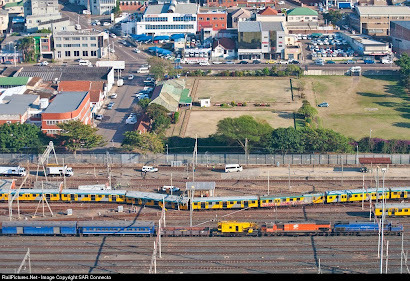 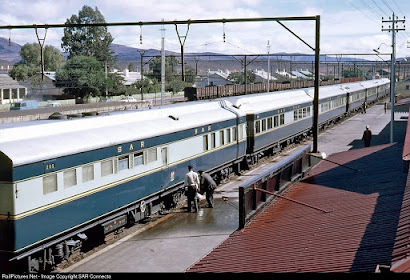 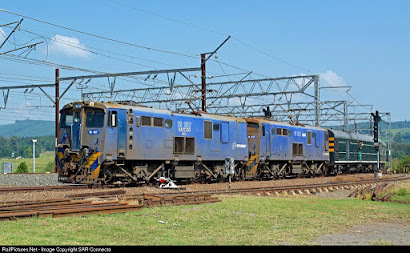 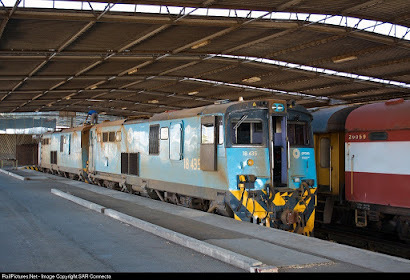 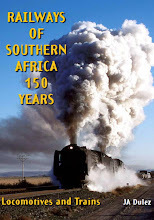 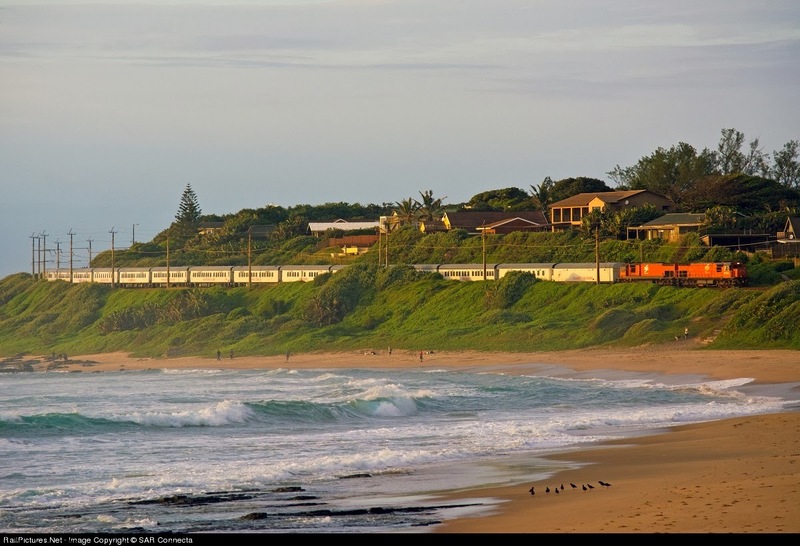 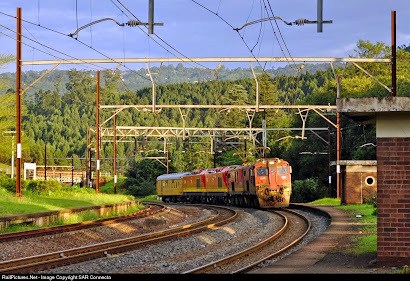 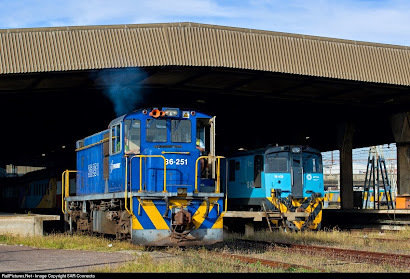 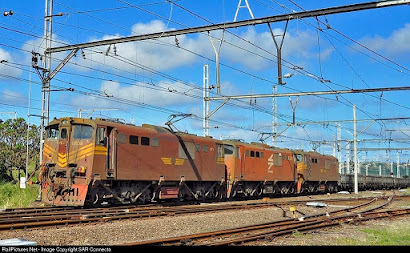 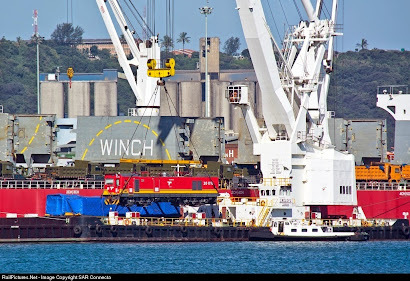 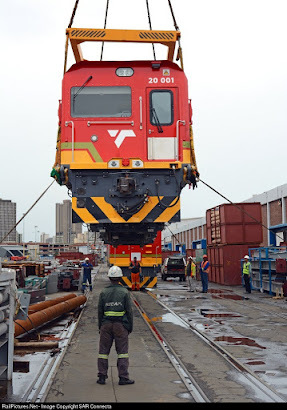 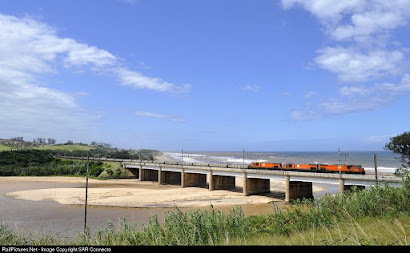 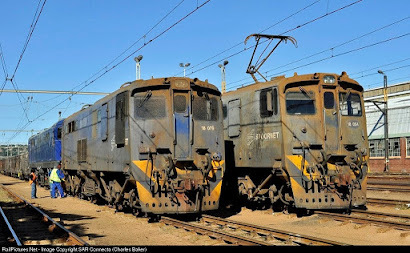 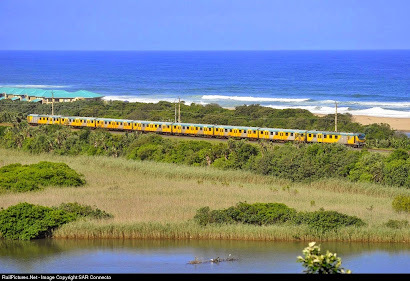 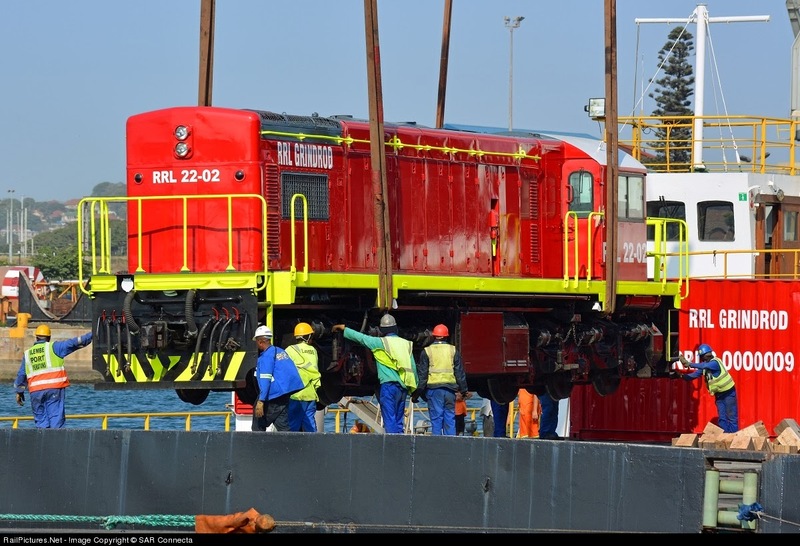 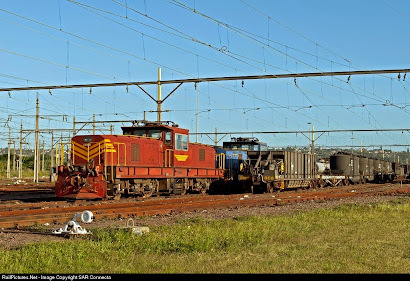 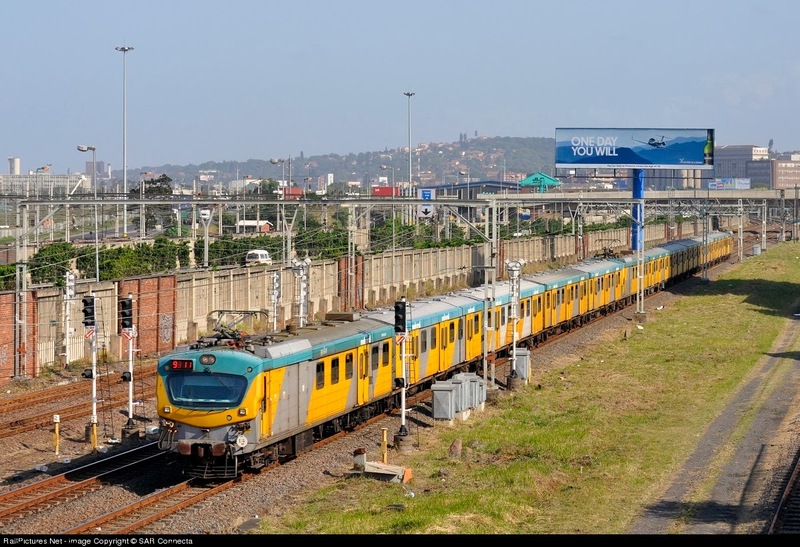 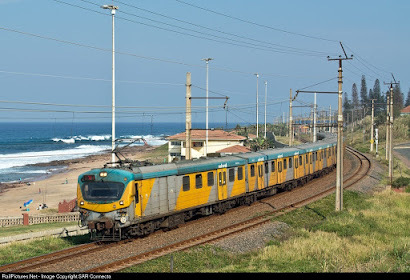 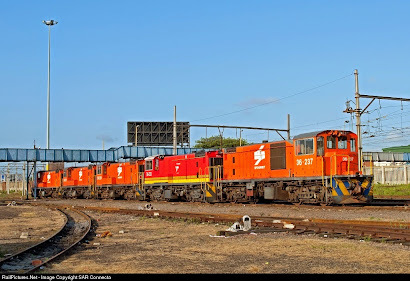 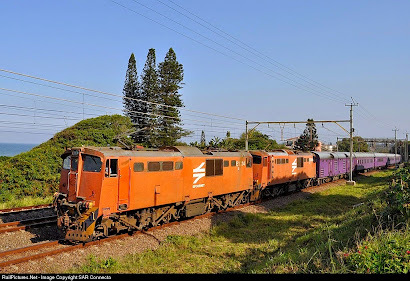 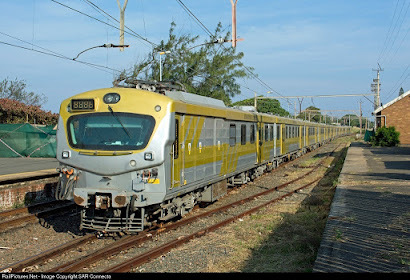 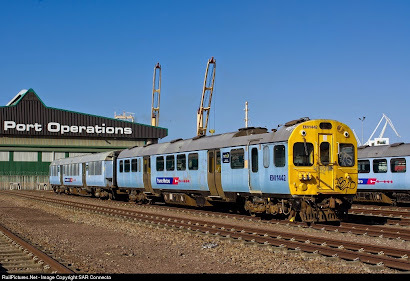 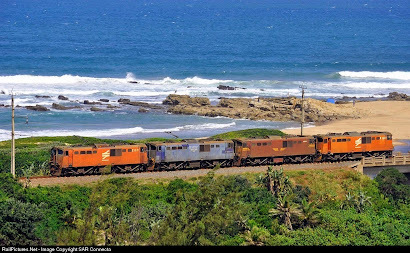 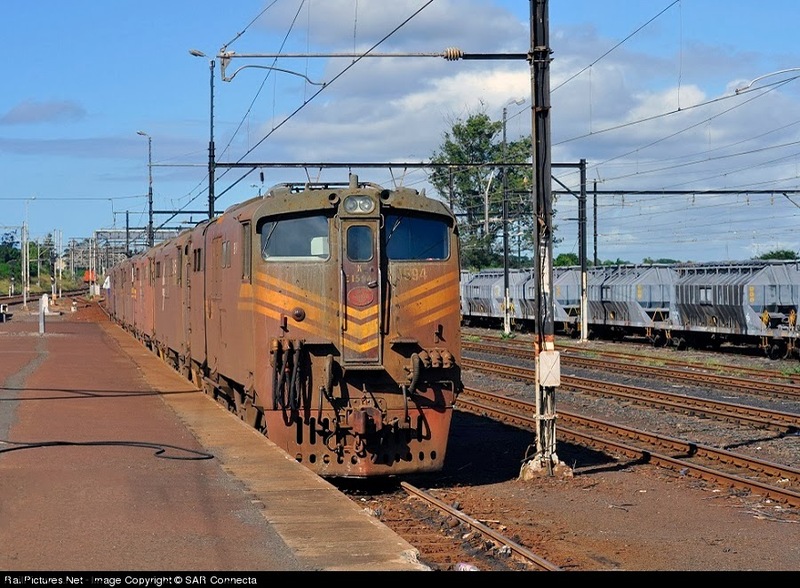 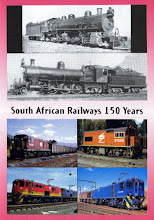 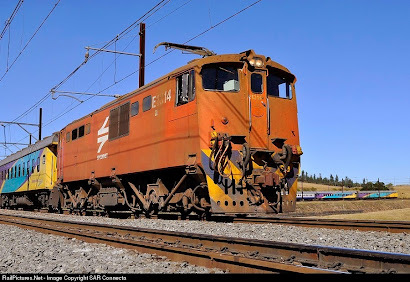 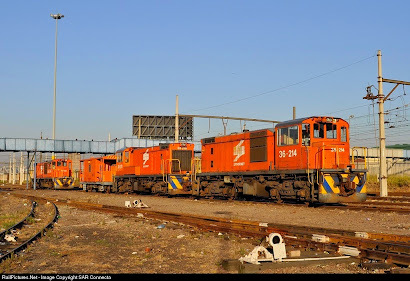 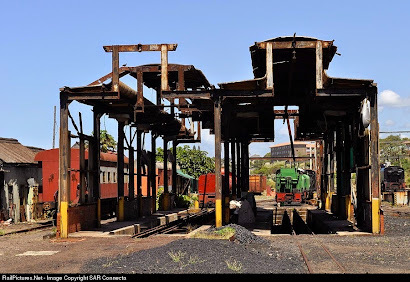 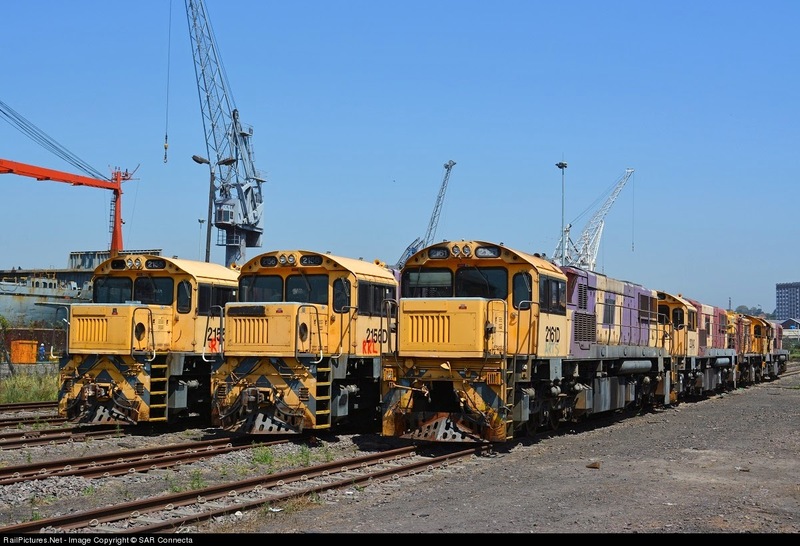 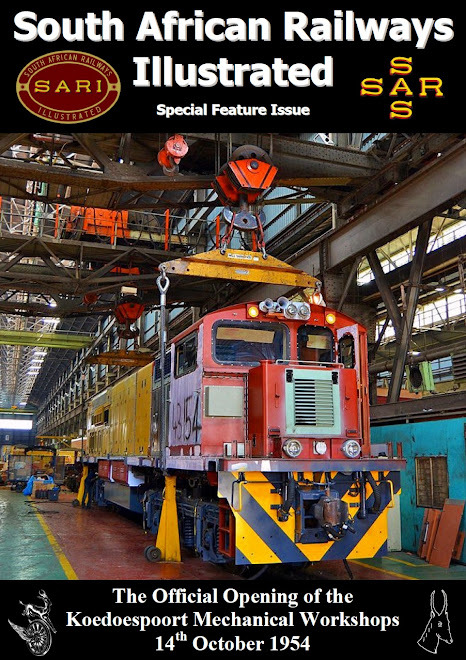 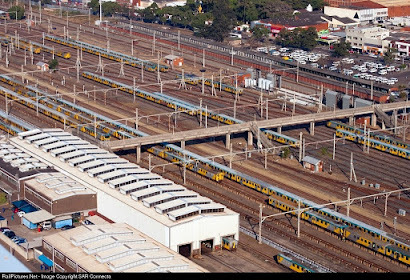 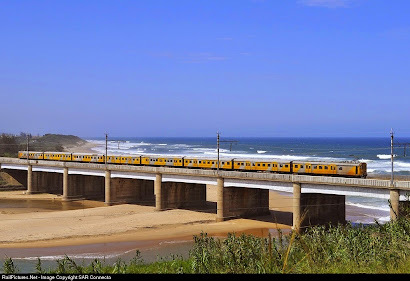 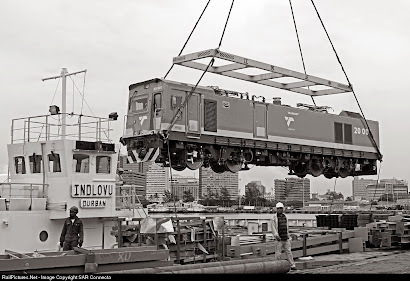 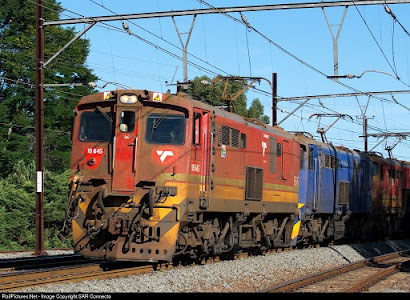 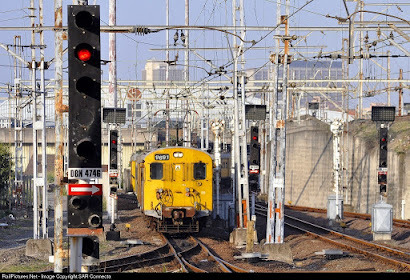 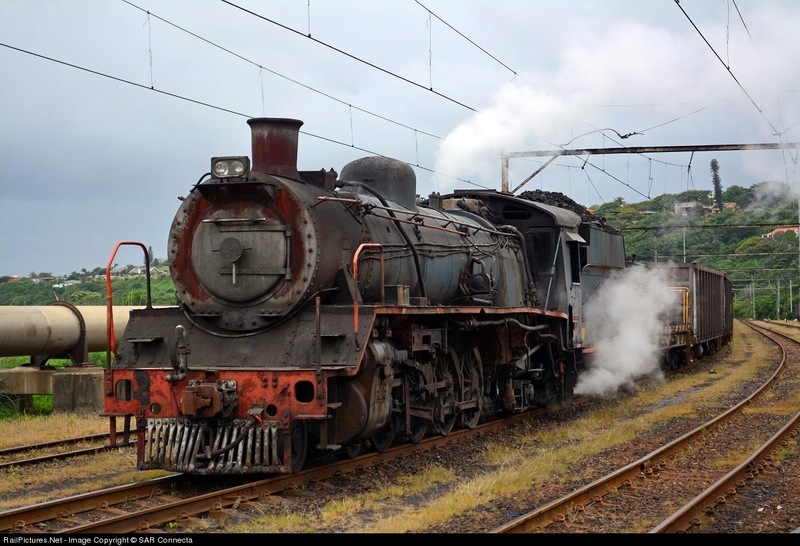 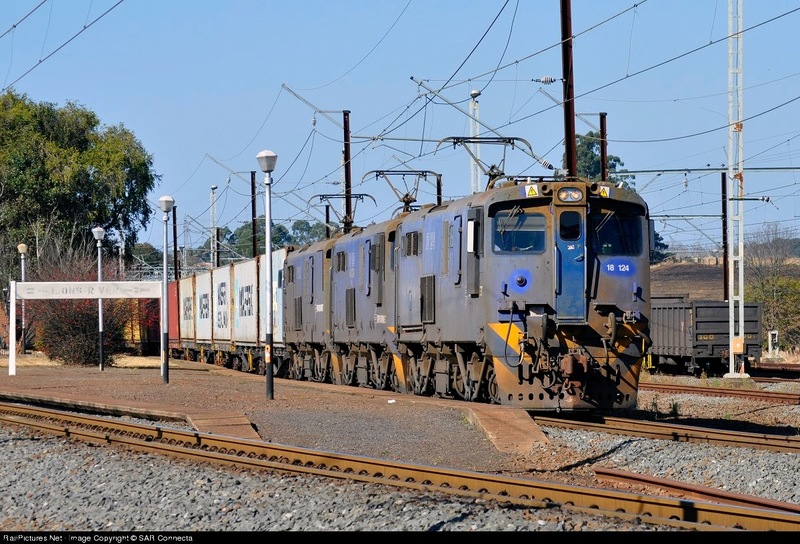 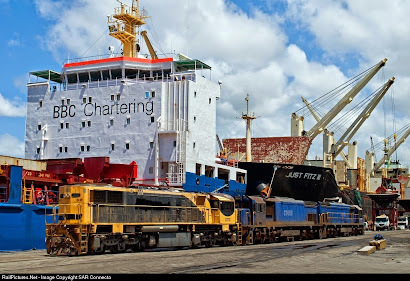 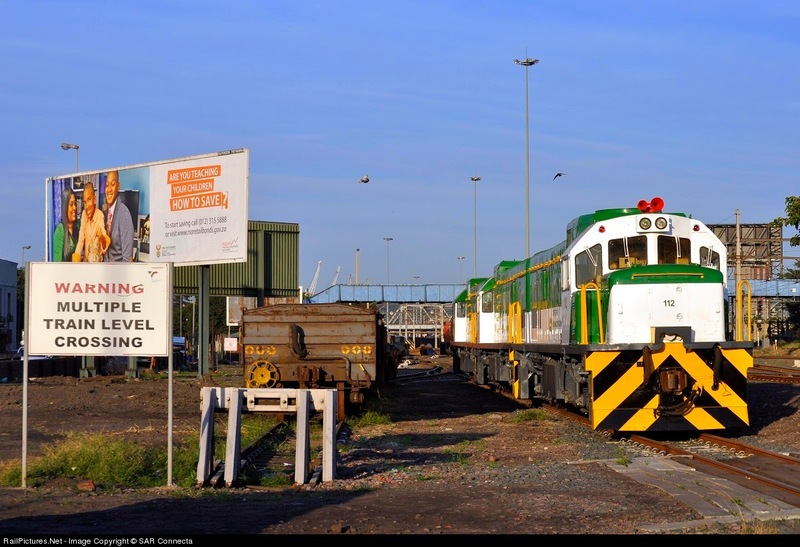 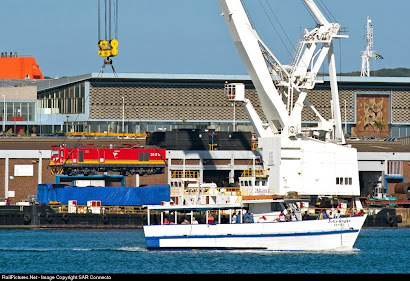 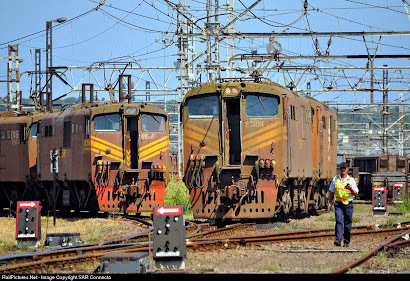 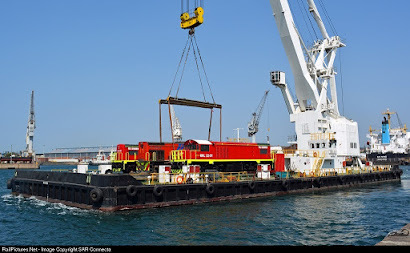 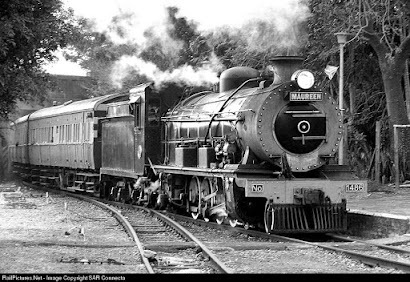 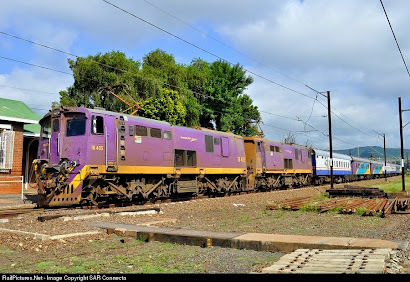 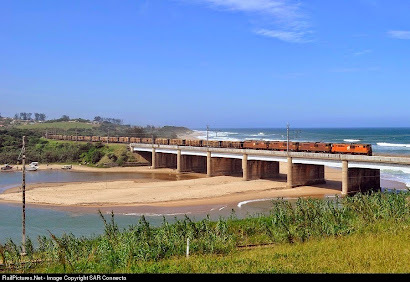 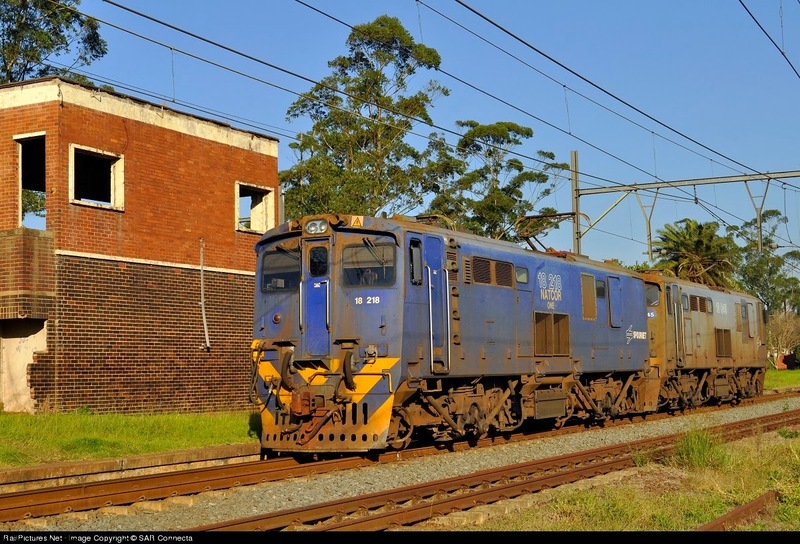 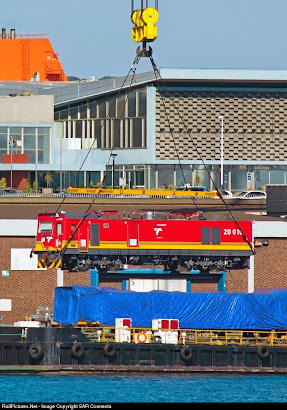 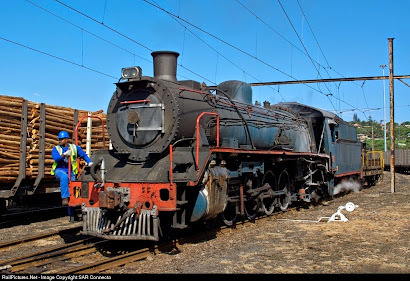 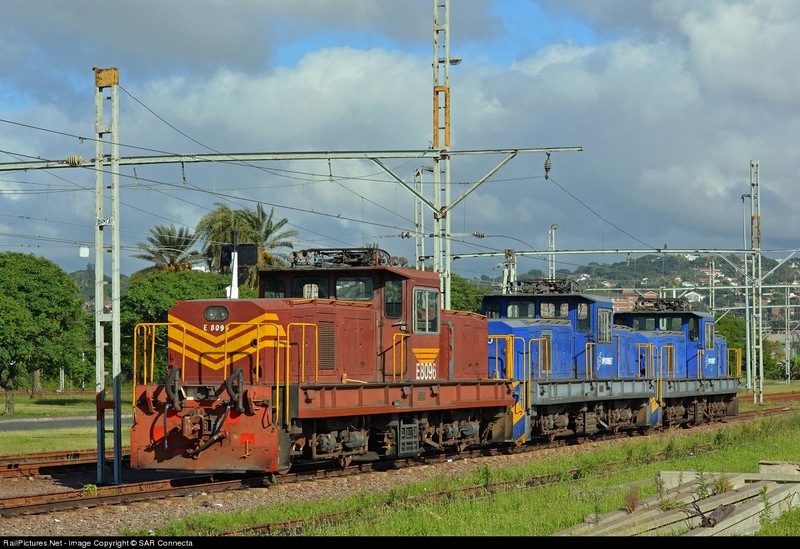 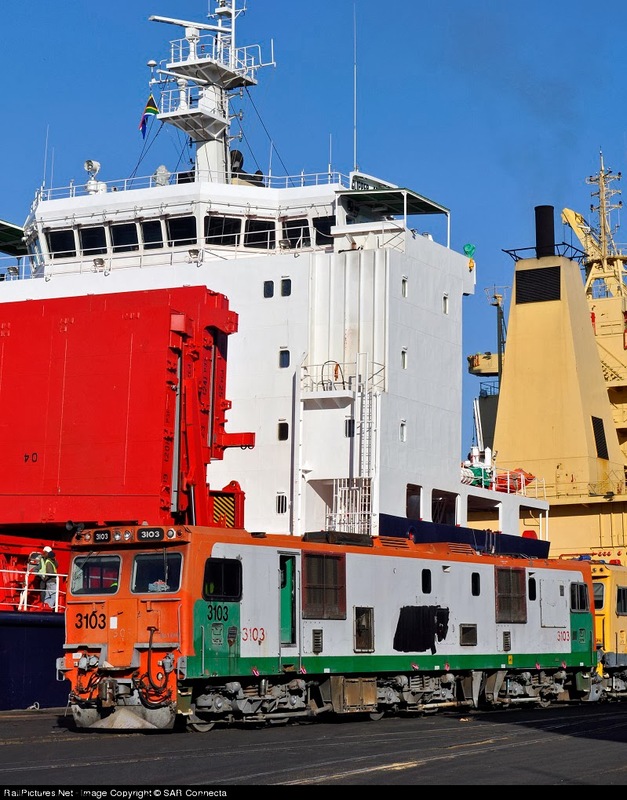 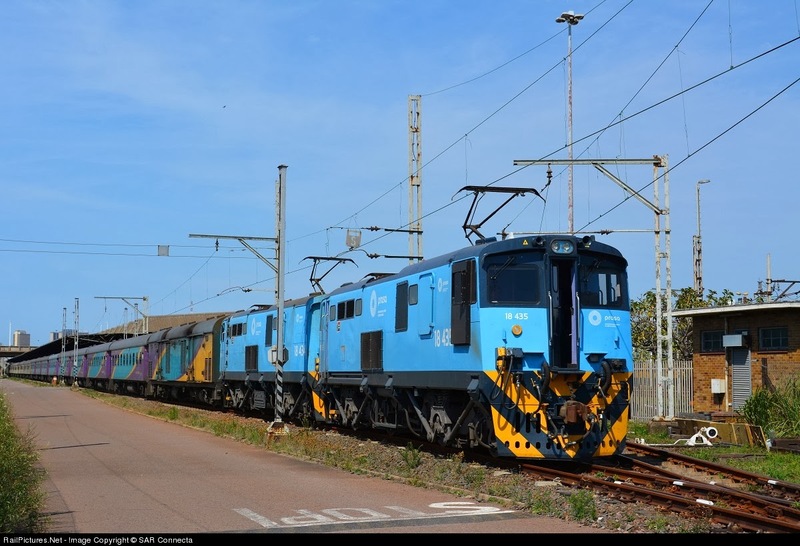 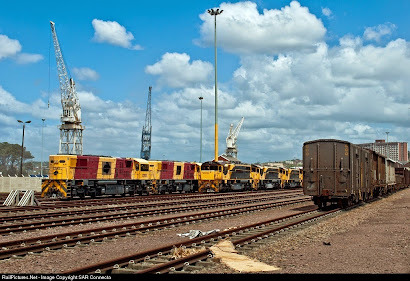 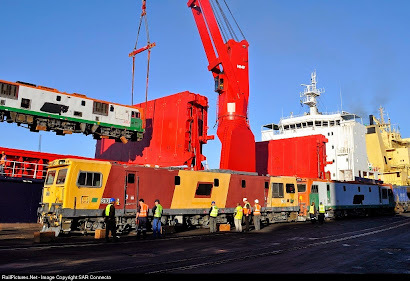 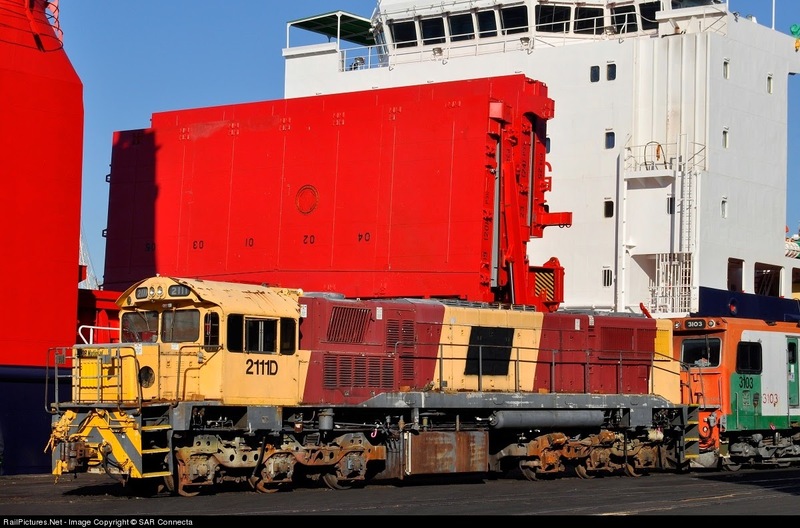 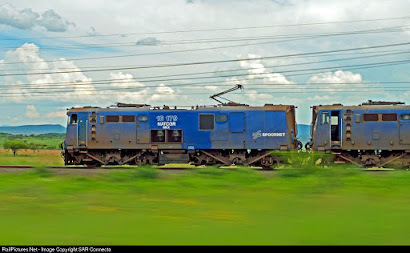 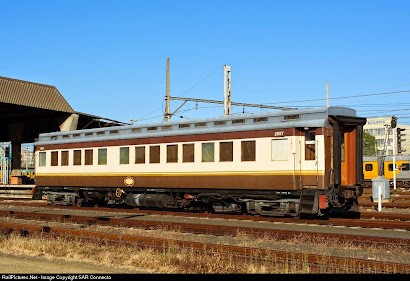 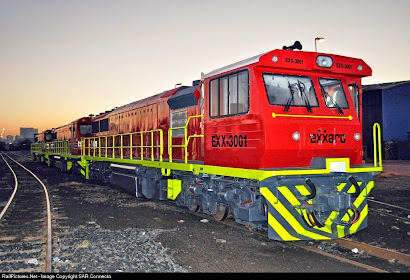 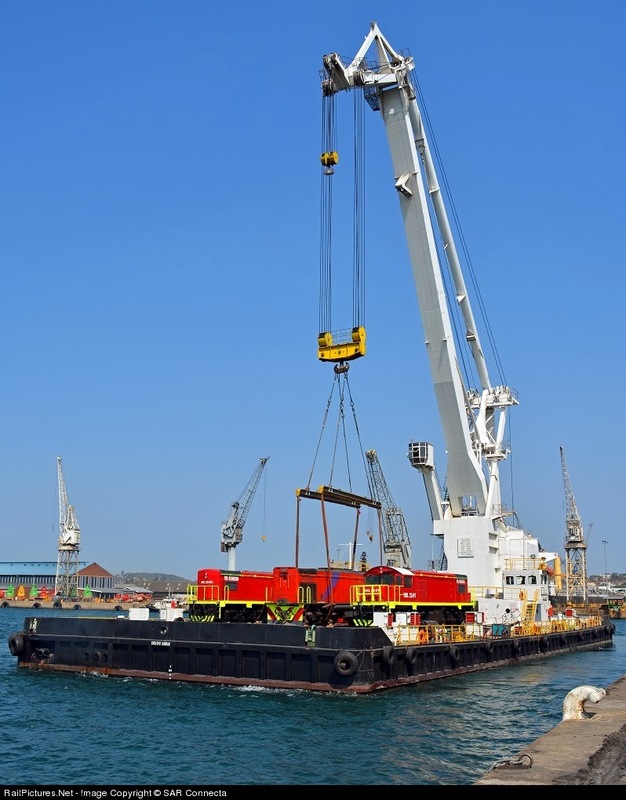 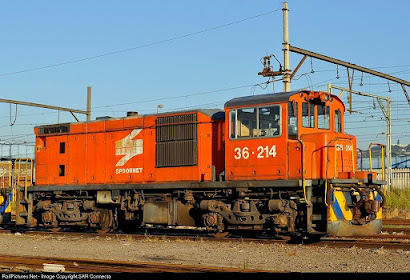 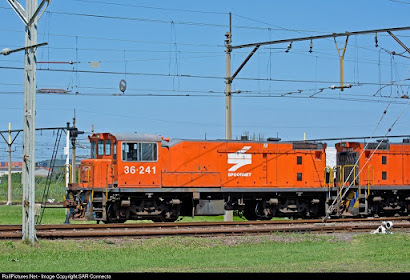 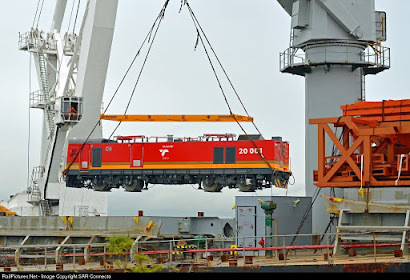 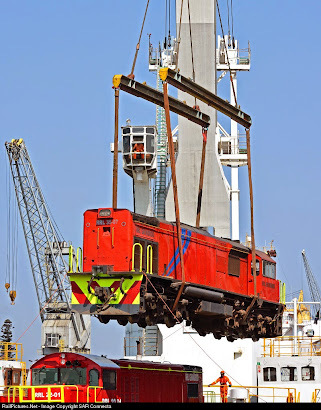 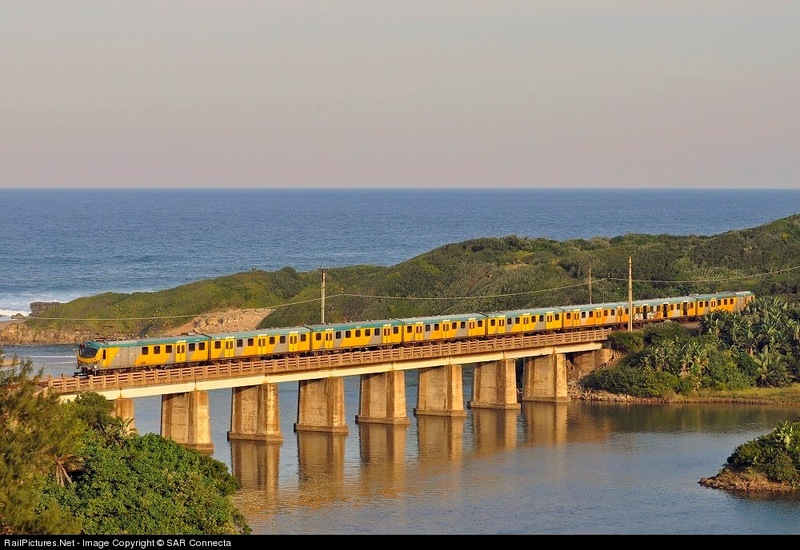 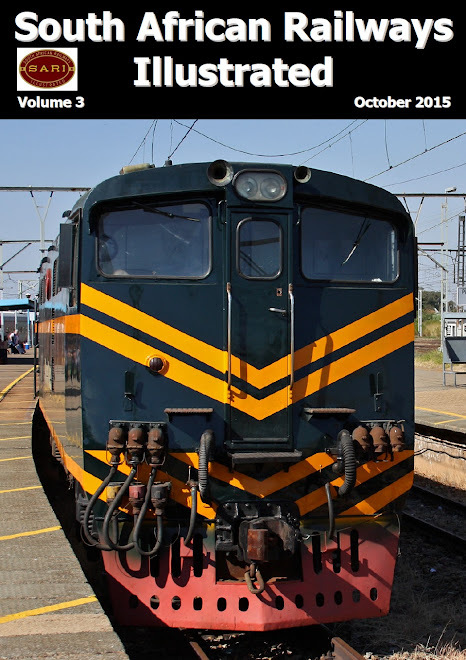 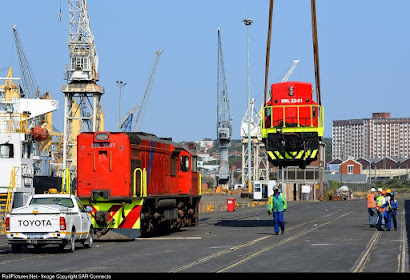 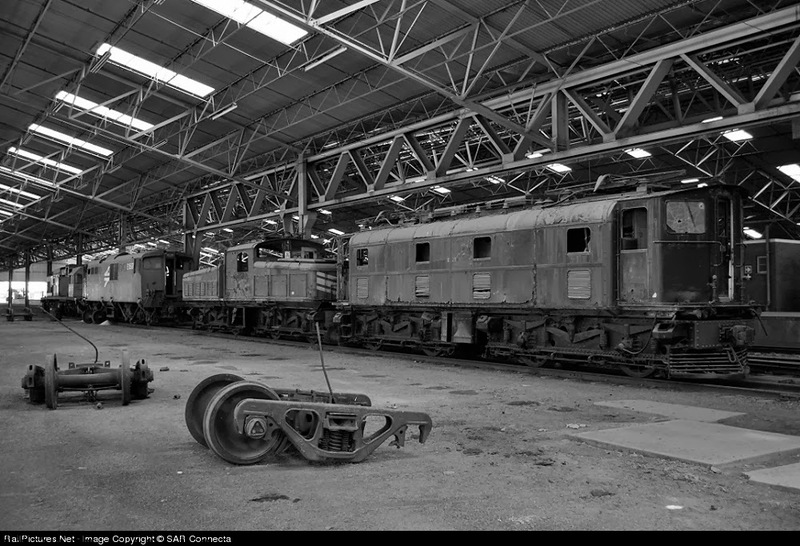 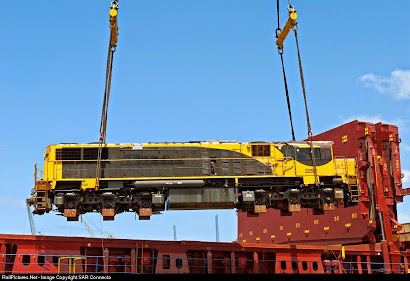 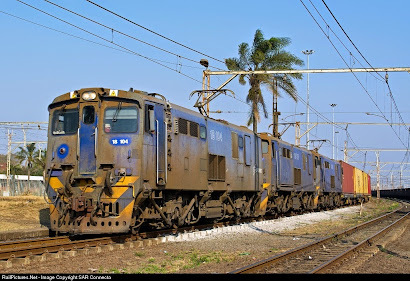 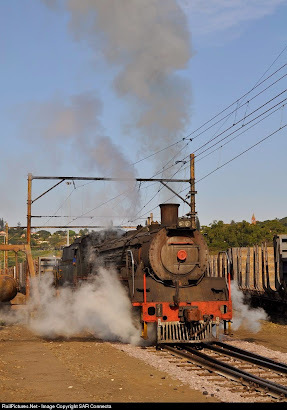 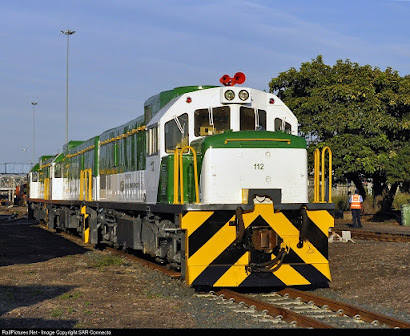 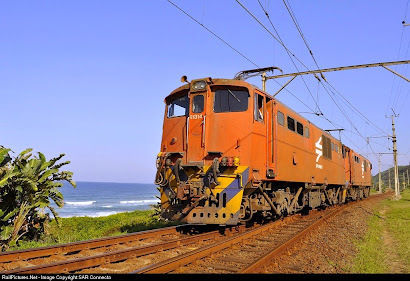 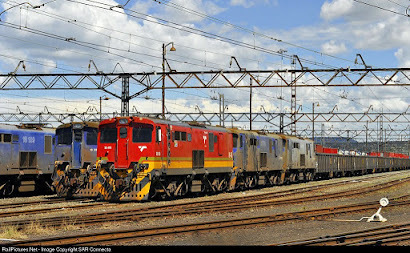 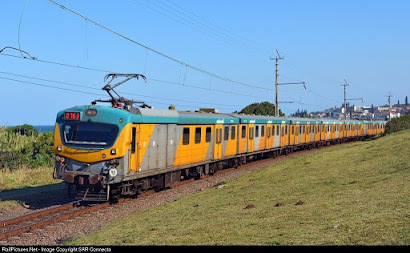 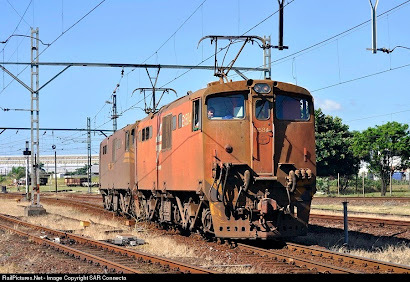 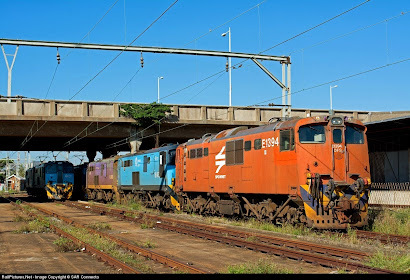 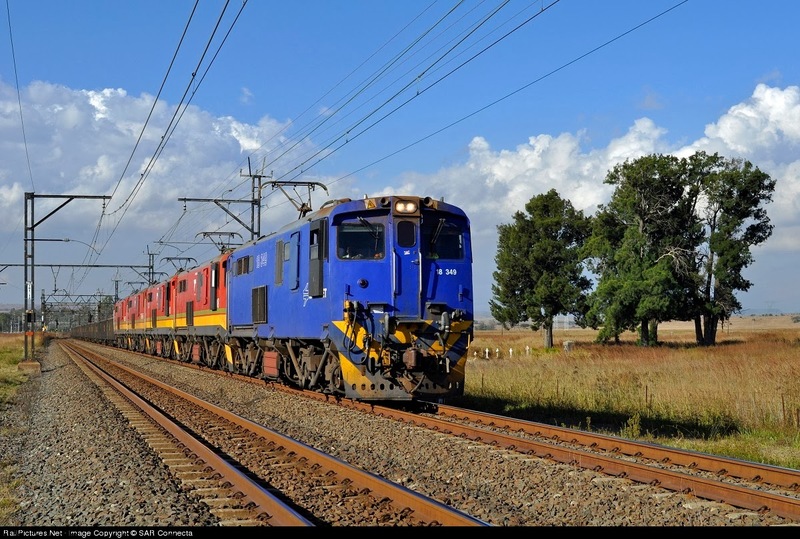 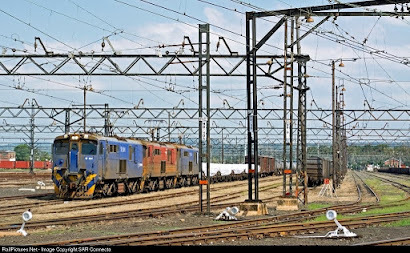 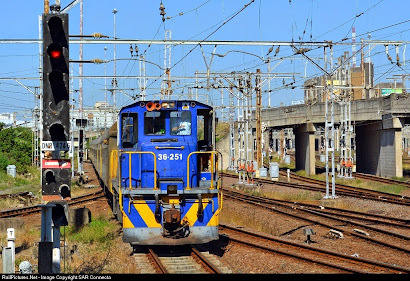 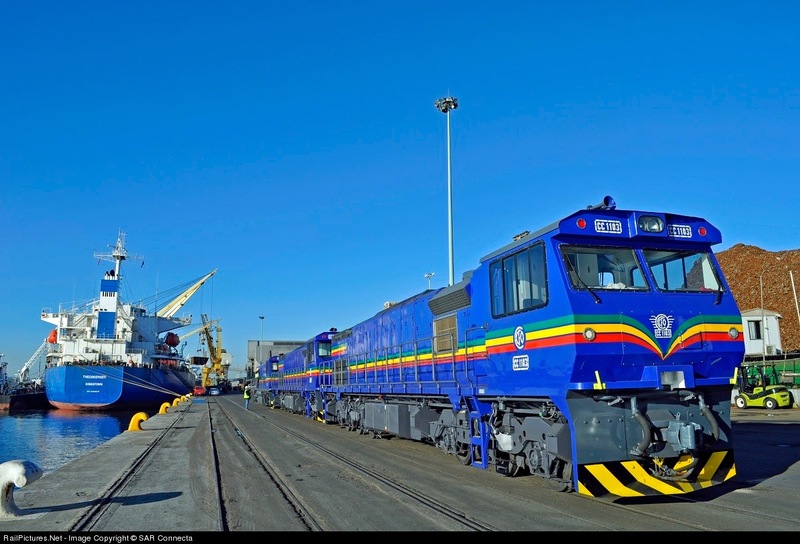 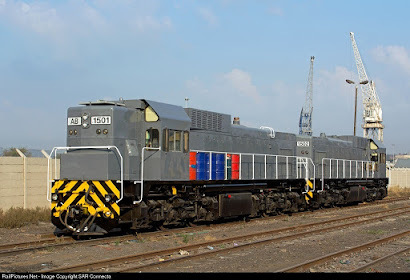 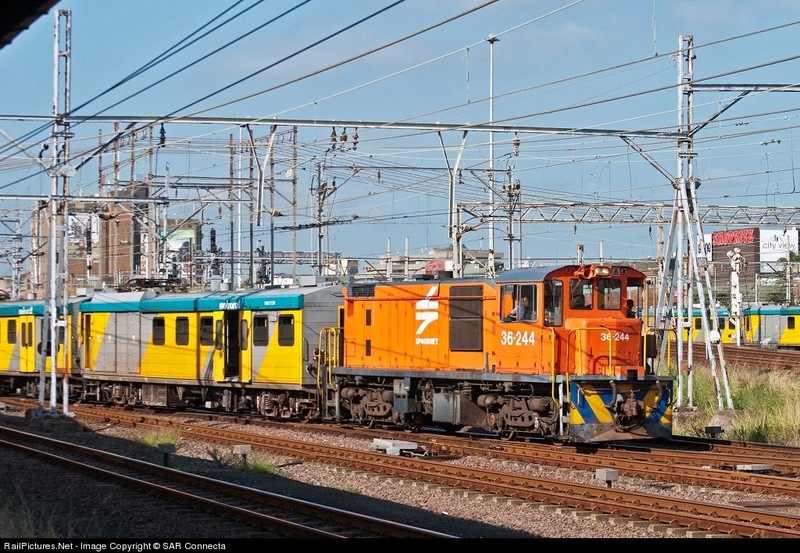 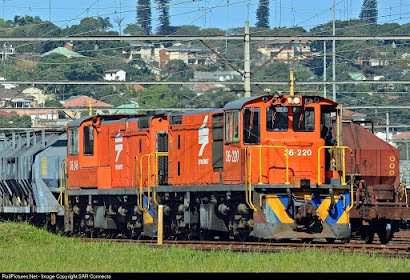 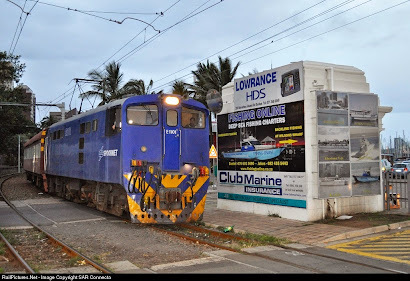 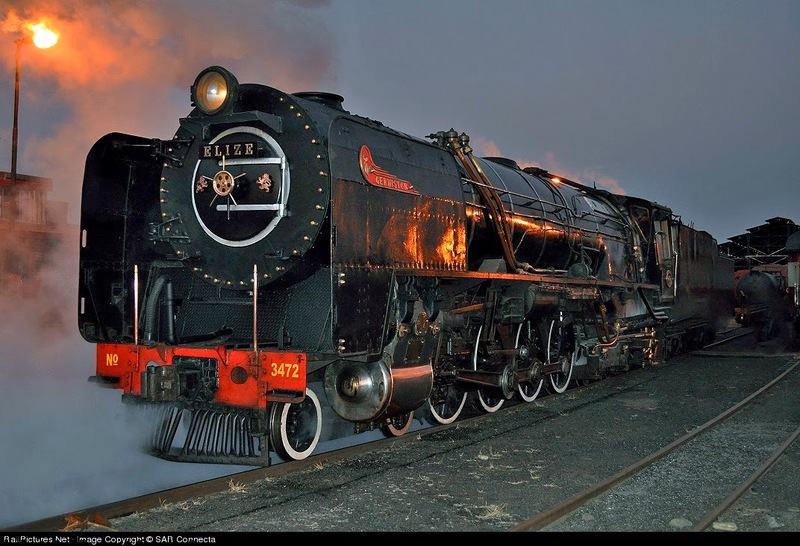 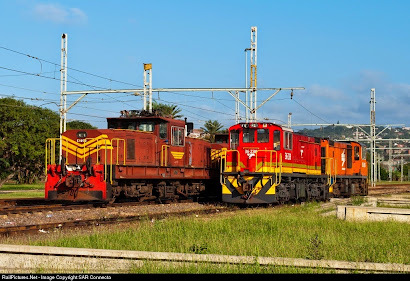 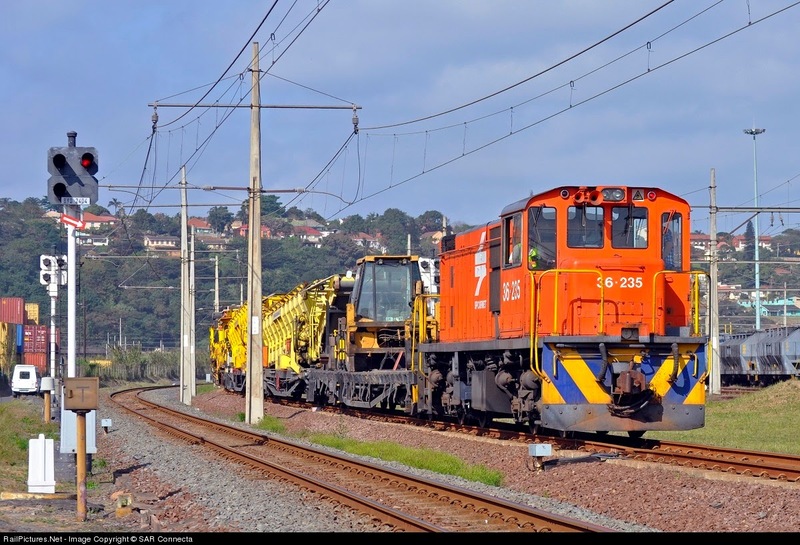 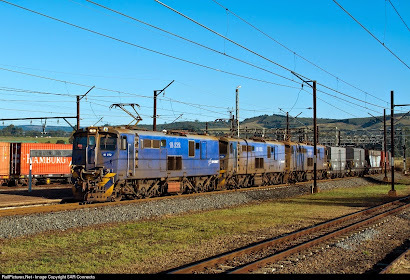 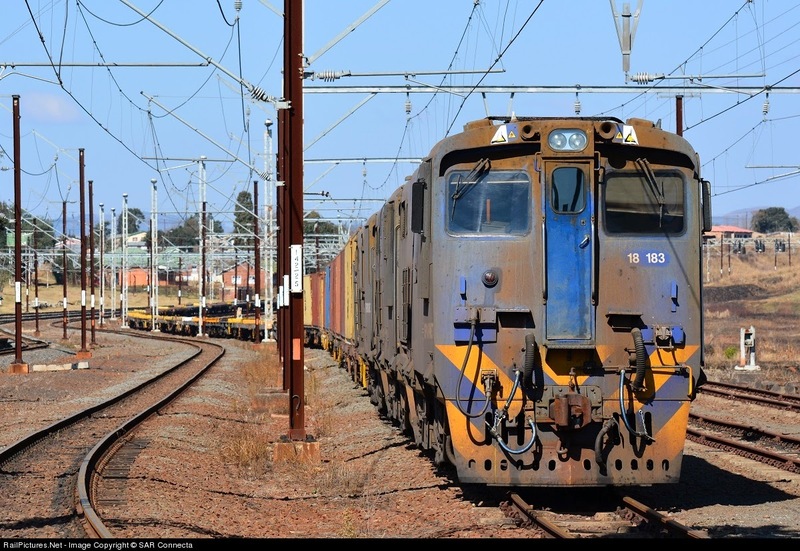 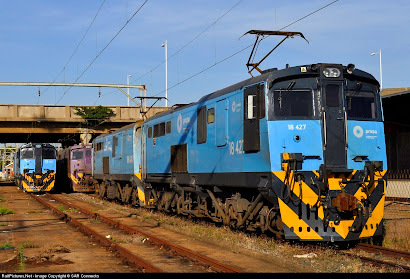 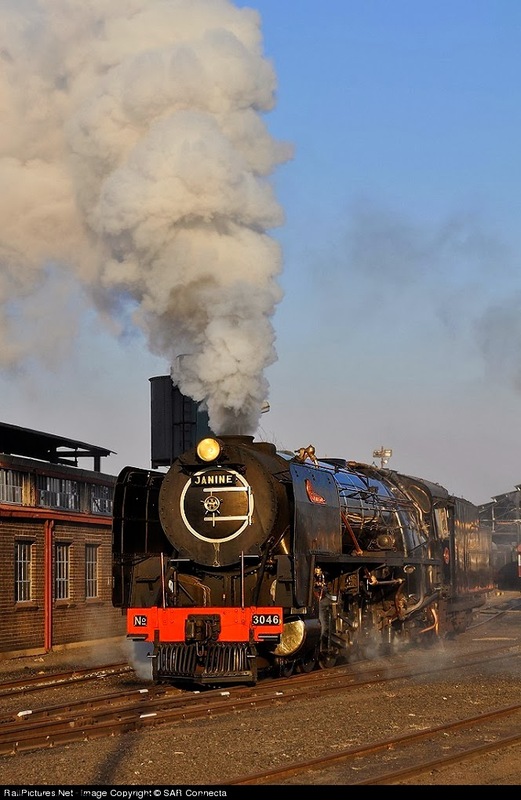 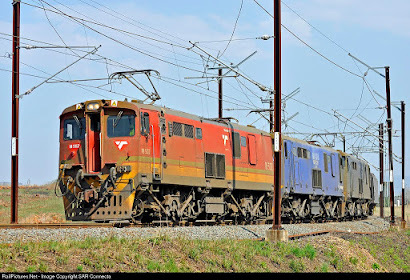 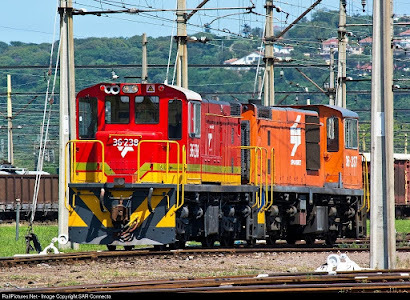 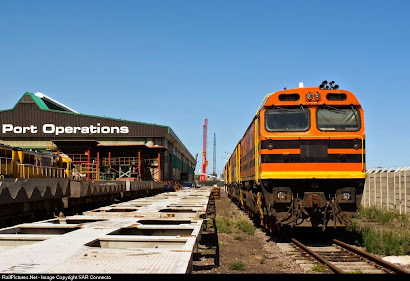 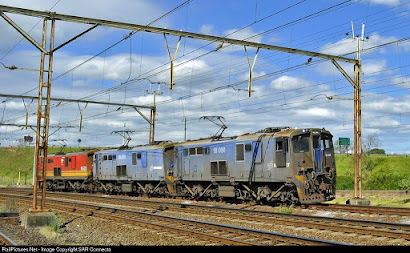 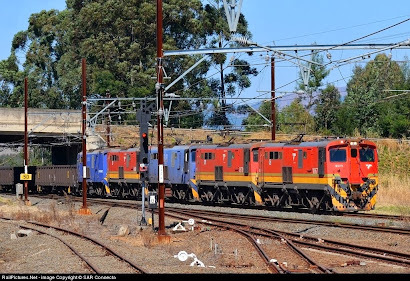 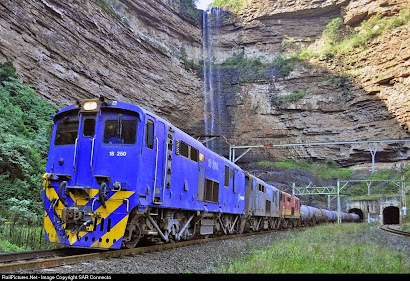 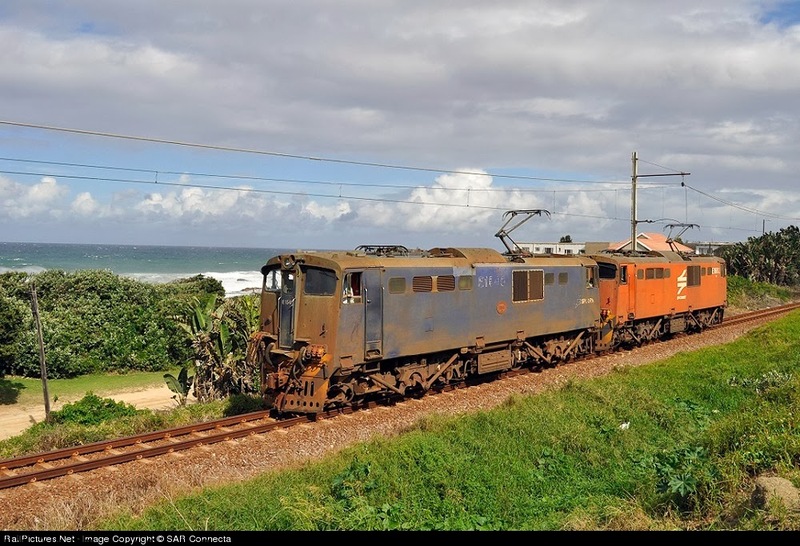 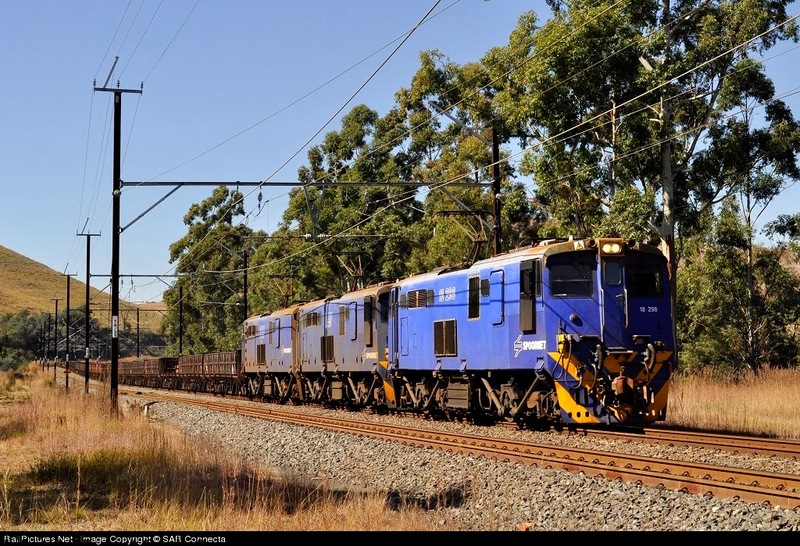 34-422 & 34-425 at Richards Bay (5th May 2013). 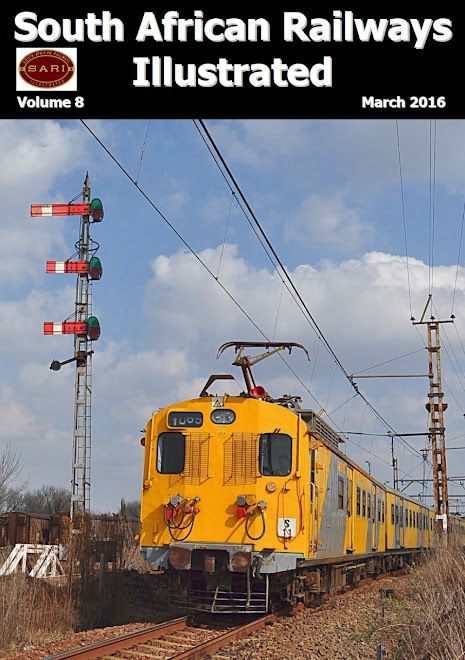 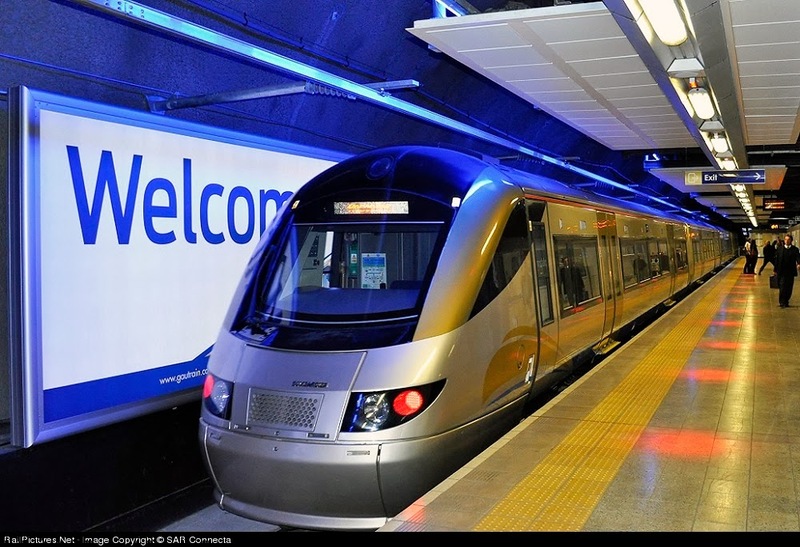 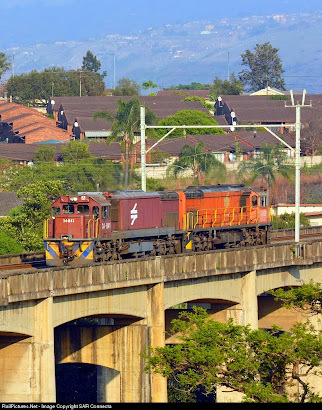 18-218 / 18-045 at Umlaas Road (3rd May 2013). 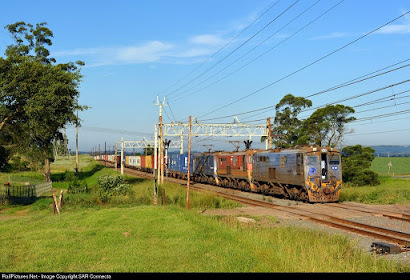 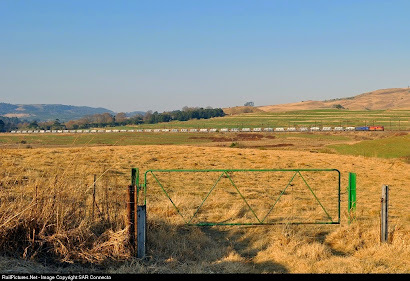 18-524 & Containers - Umlaas Road (3rd May 2013). 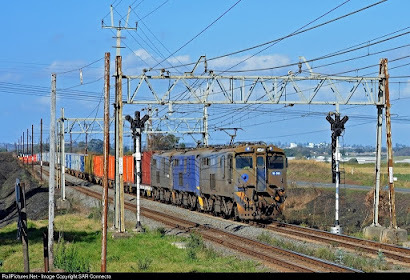 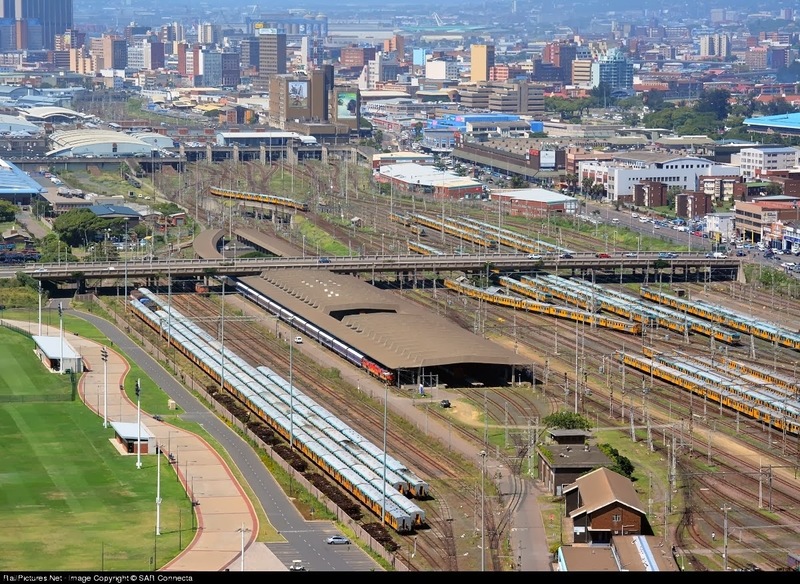 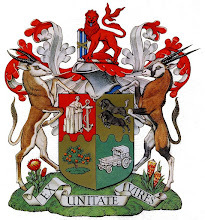 18-169 & Containers - Umlaas Road (3rd May 2013). 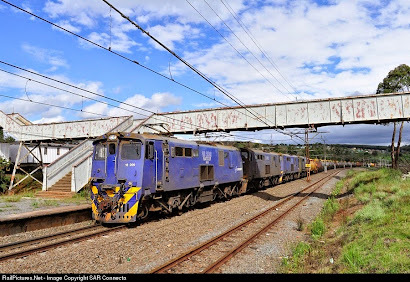 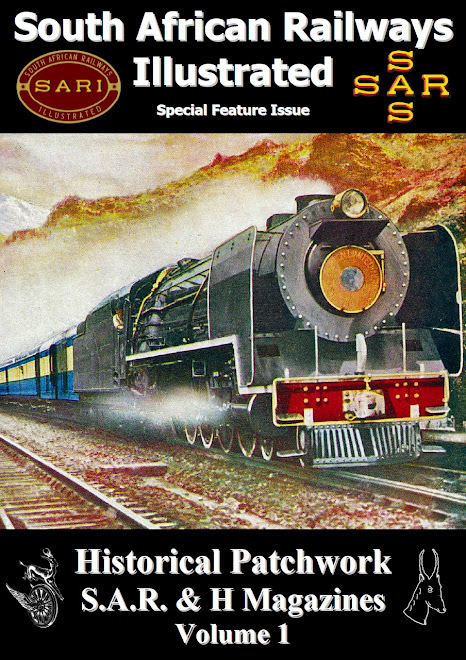 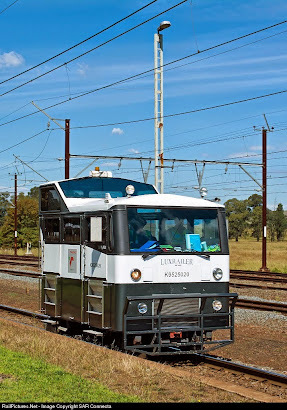 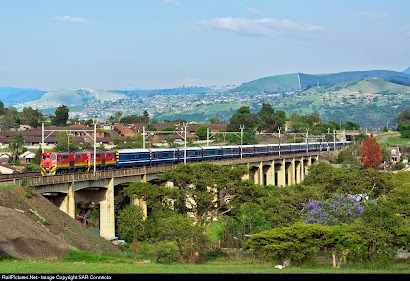 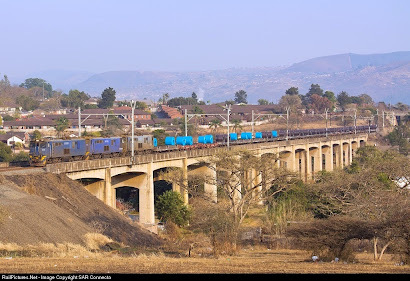 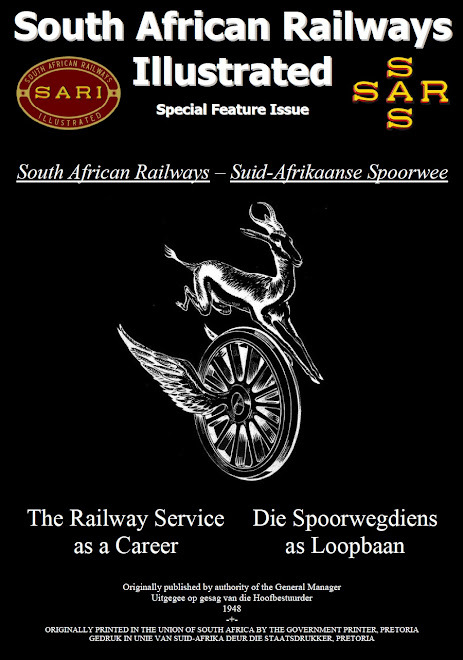 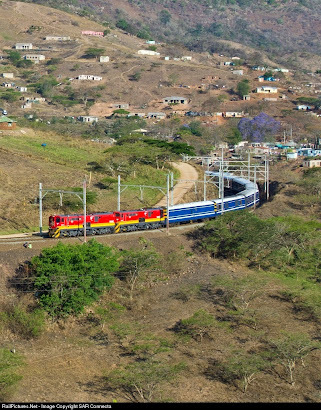 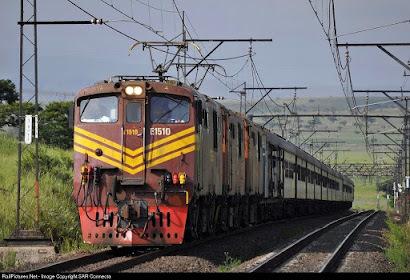 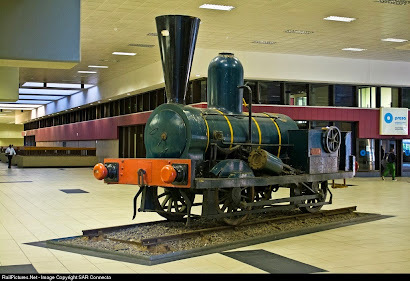 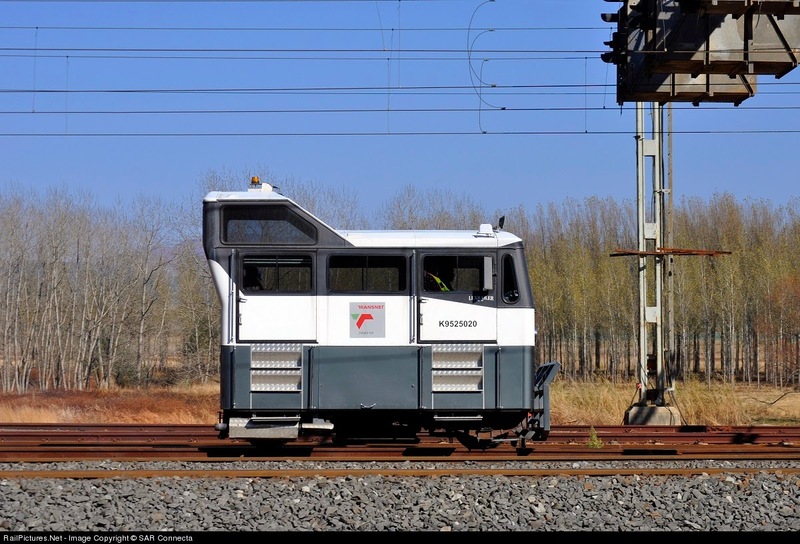 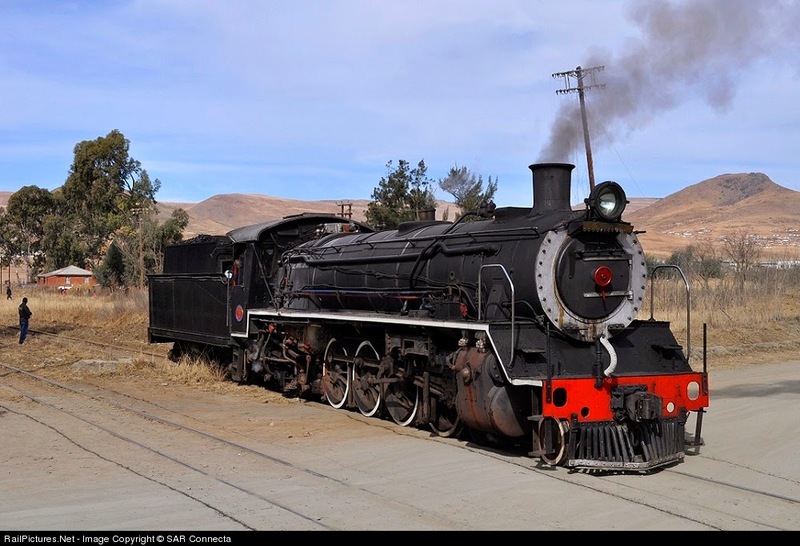 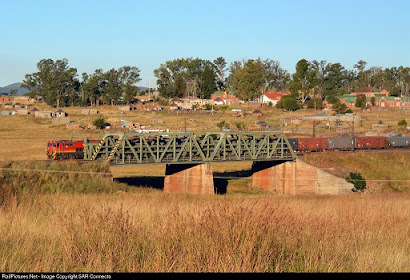 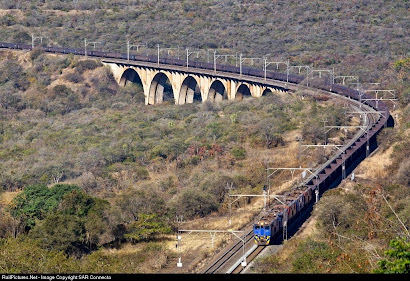 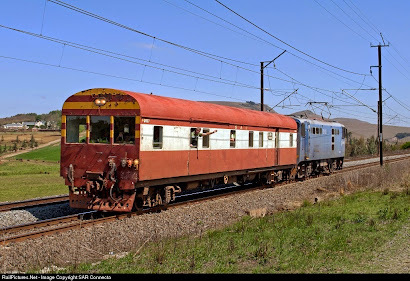 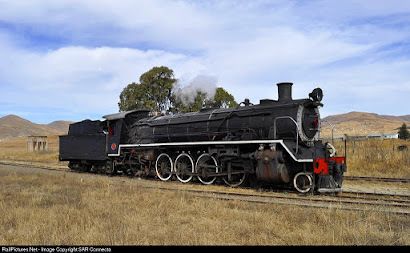 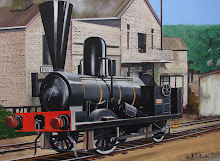 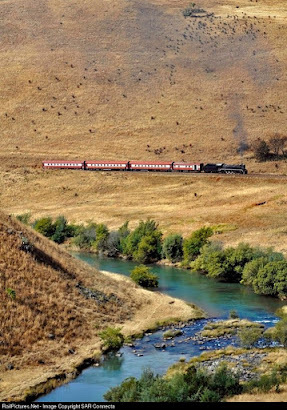 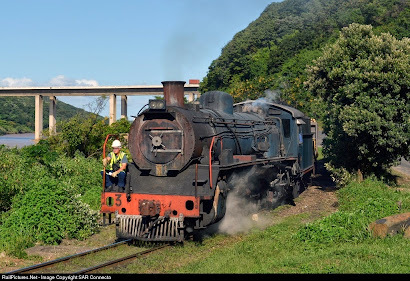 35-207 at Umlaas Road (3rd May 2013).